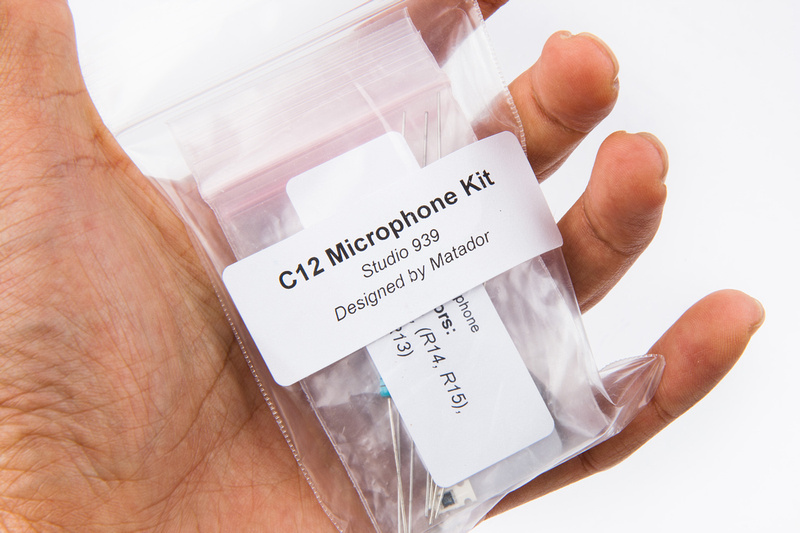 This is the official build and support thread for the C12 Clone project. All build related materials and pics will be posted first, and please feel free to post any technical, BOM, or assembly related questions. I'll update this if there are any changes or discoveries which are of a general interest to all builders. Recommended capsules for this build are Tim Campbell's CT12 or Eric Heiserman HK12. Please contact Tim directly to order capsules. The Eric Heiserman HK12's are stocked in the Studio 939 webstore. Please be aware, currently, demand for Tim's capsules has far exceeded his production capacity. Some persistence may be needed to obtain a capsule and lead times may be long. Please plan accordingly for your build. 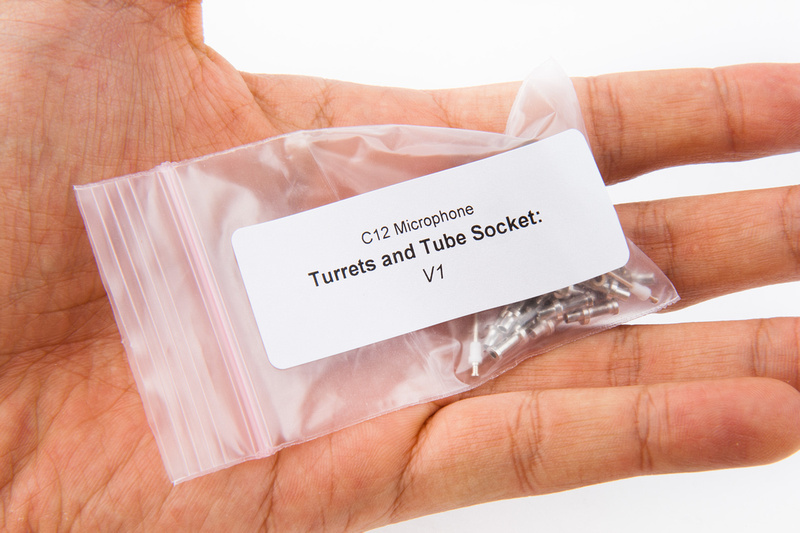 These are the backplate-correct CK12 type capsules that we have tested and recommend for the build. Note: There are other chambered variants being manufactured some of which may be available for DIY and may be suitable to your application, but we do not have 1st hand experience with them in studio. 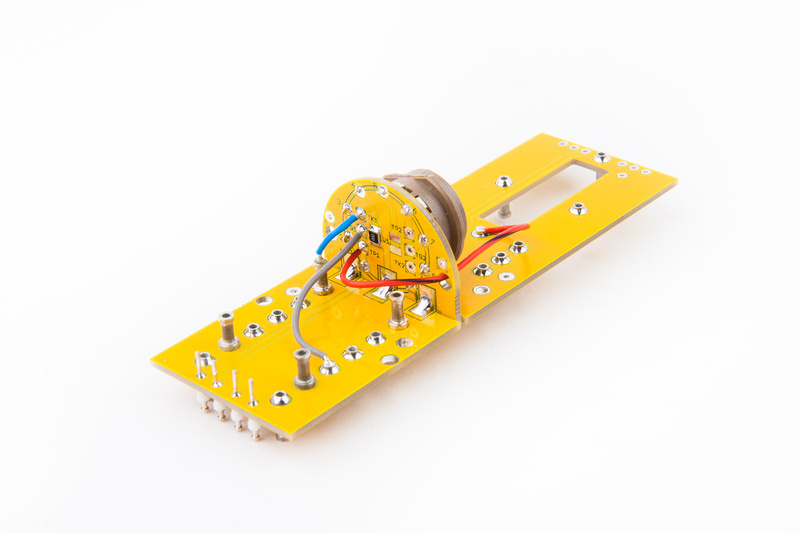 Cheaper edge-terminated capsules are a derivative of the K67 backplate which is much easier to manufacture consistently and can make a quite nice sounding capsule, but do not behave 100% like the original. 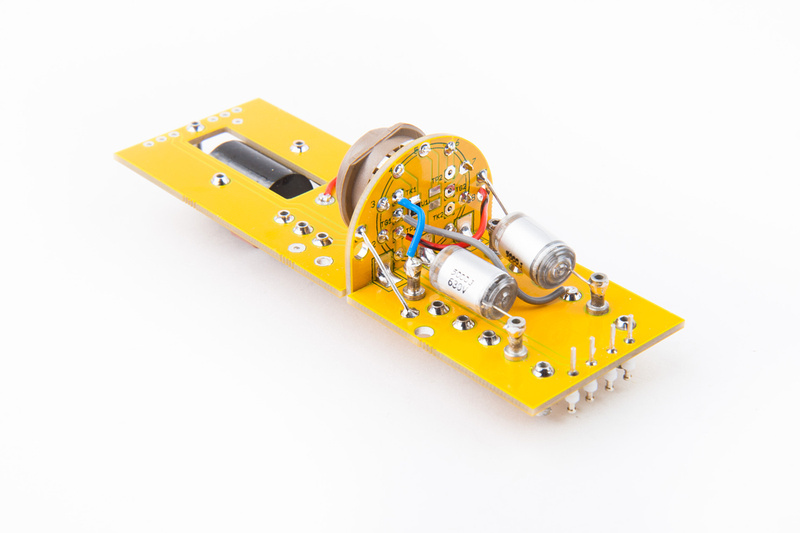 This project requires a donor microphone and is specifically designed to fit the Alctron HT-11A. 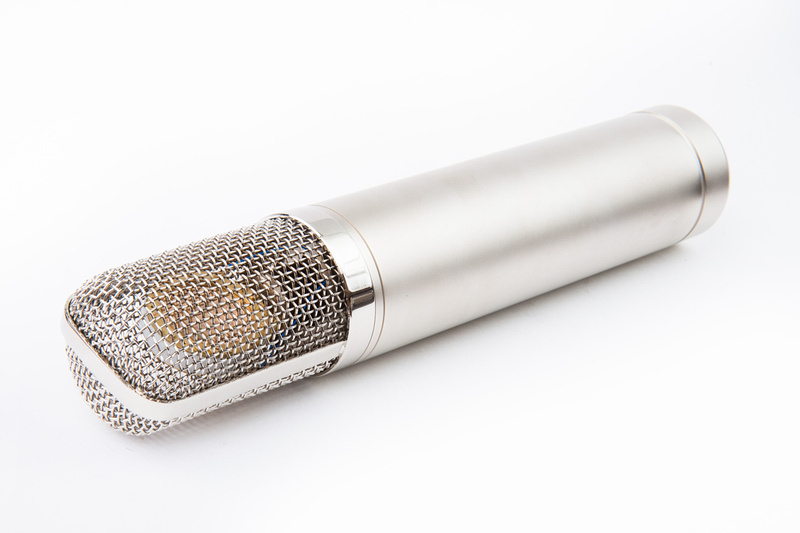 This is a popular microphone platform and several other companies re-brand and distribute it. 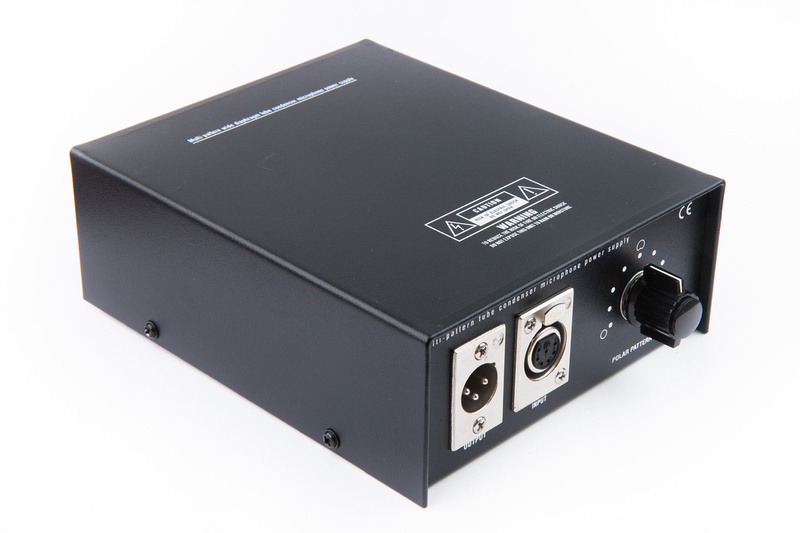 The Apex 460 is a very common version. 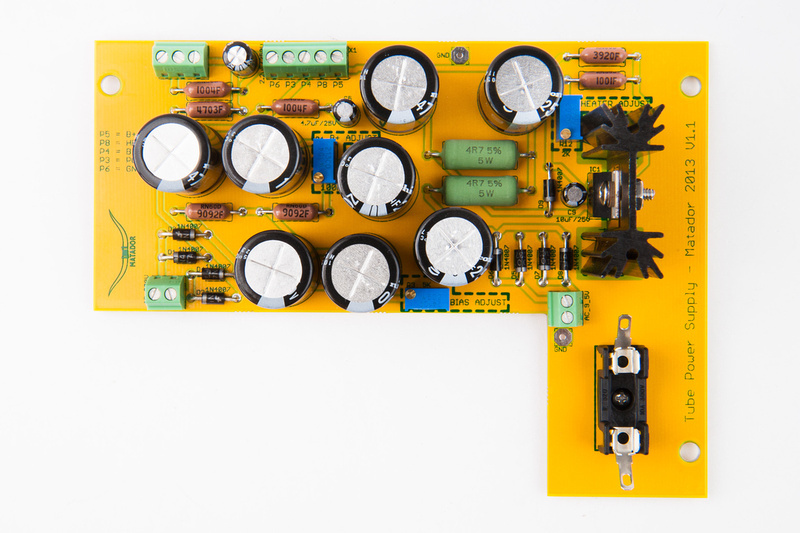 IMPORTANT NOTE: This DIY project involves working with circuits that carry LETHAL voltages. The processes and build procedures demonstrated in this thread are for educational purposes only. All work should only be performed by qualified technicians. 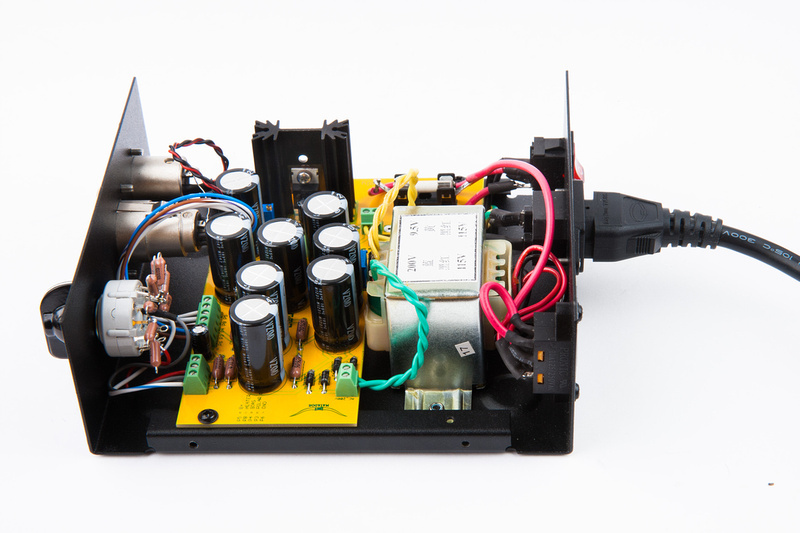 While the parts count in this project is low and build procedures outlined in this project straight-forward, a high voltage tube microphone and power supply is not a recommended beginner DIY project. 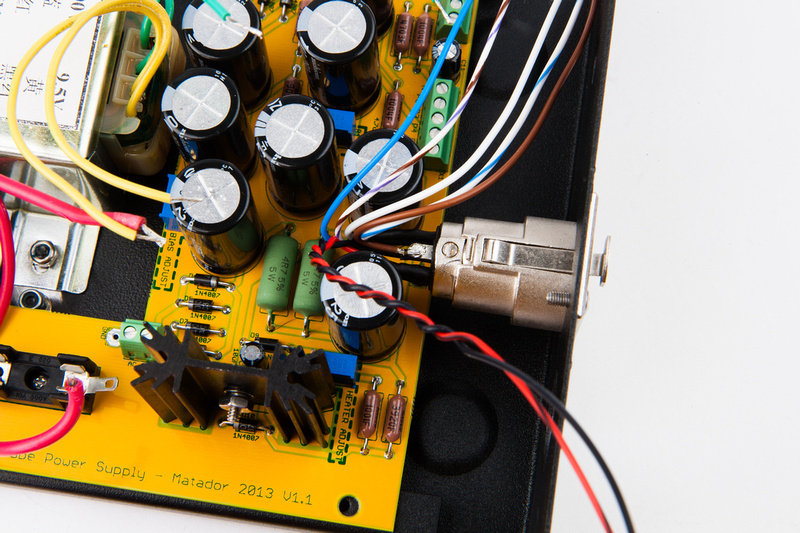 Schematics provided in the first post by Matador should be studied and thorough knowledge of all connections and components clarified prior to attempting this build. 1. 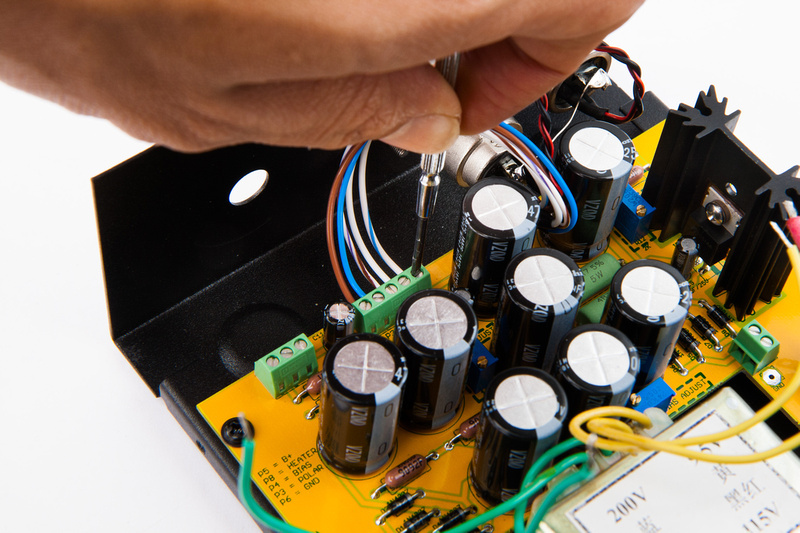 If you are new to DIY electronics and do not have confidence and technical knowledge to trouble-shoot the circuit when problems arise, make sure you have a solid fall-back plan. Before purchasing expensive parts, find someone (friend or professional) local to you who can assist in person if you get stuck! I will re-iterate that this is not a recommended project for complete beginners. 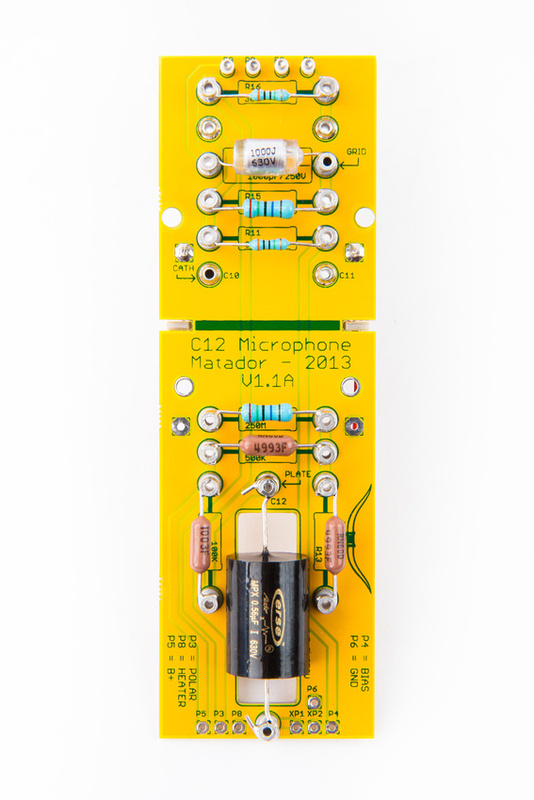 Please consider starting out with an easier low-voltage project like the VP26 microphone preamp kit from Classic Audio Products. 2. 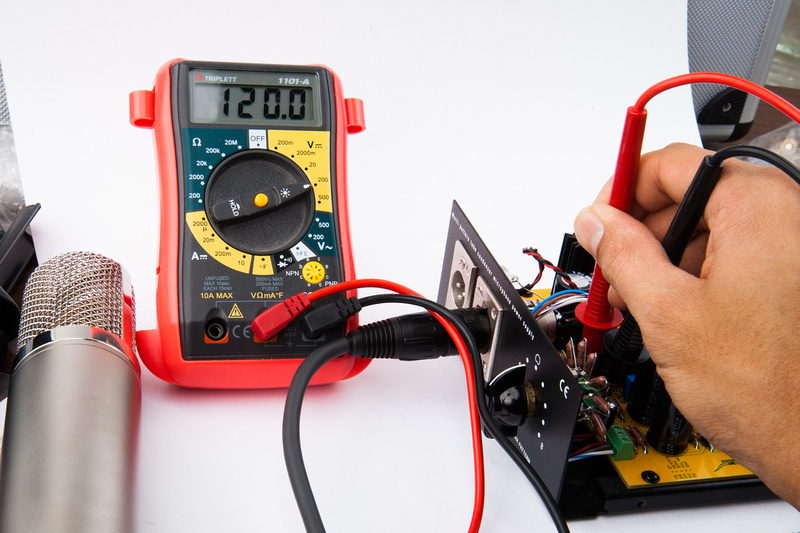 A digital multimeter that you understand how to use. 3. 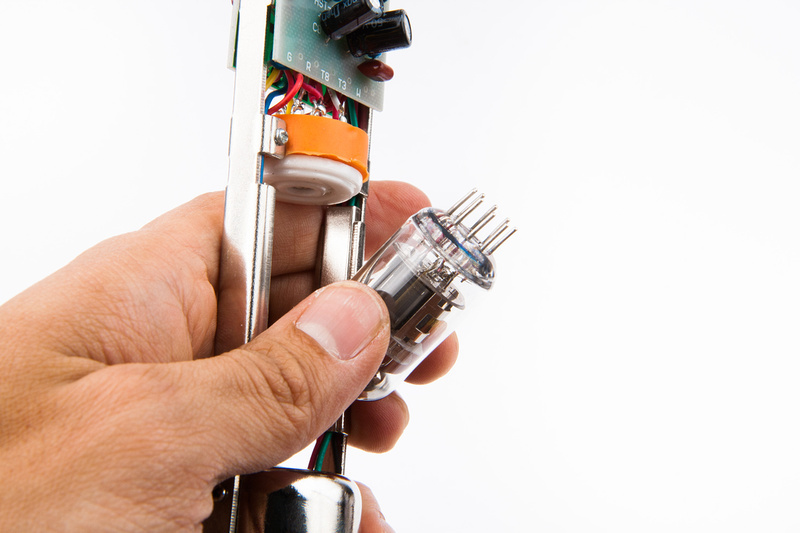 A temperature controlled soldering iron. 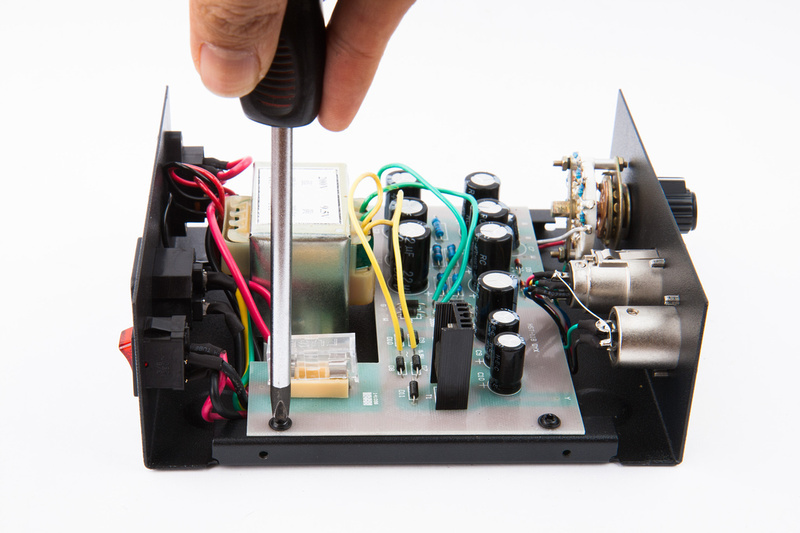 Delicate electronic components can easily become damaged with even low-wattage non-regulated soldering irons. Weller, Hakko, and other name-brand tools are good, but I have been using a budget Chinese regulated 75 watt iron for ~20 projects and it has worked smoothly and heats up to operating temperature in under 5 seconds. 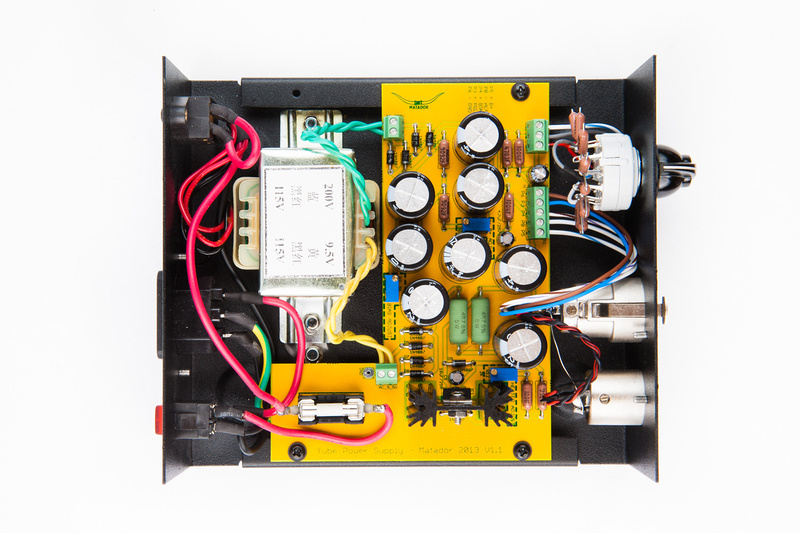 Or, a cheaper 45 watt regulated alternative. 4. 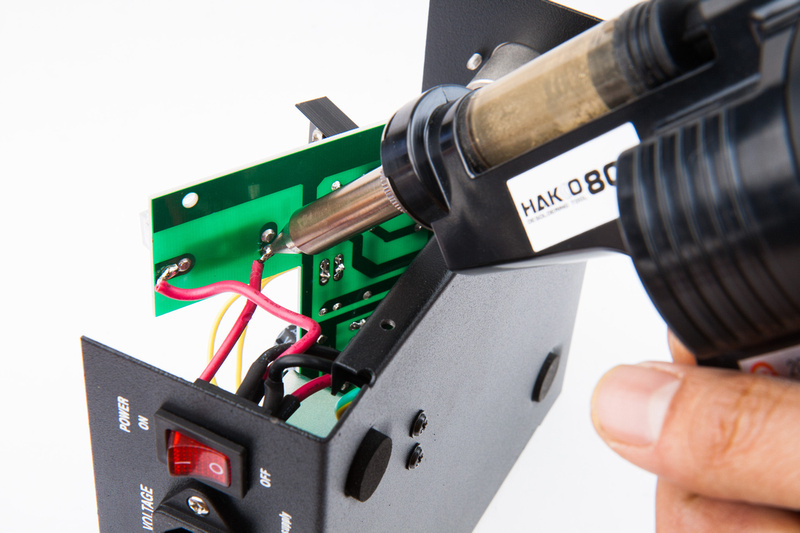 Hakko 808 de-soldering tool. 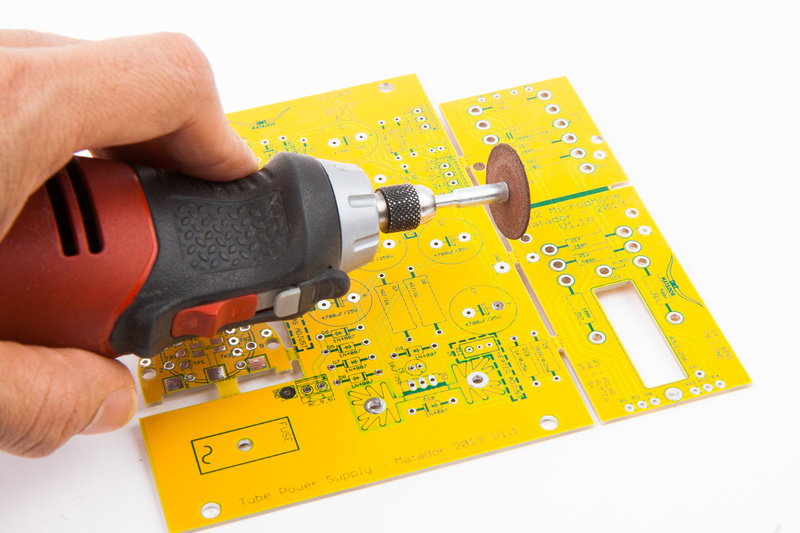 This expensive tool can save you from hours of frustration and damaging the traces on your PCB if you need to remove components after they have been soldered in. 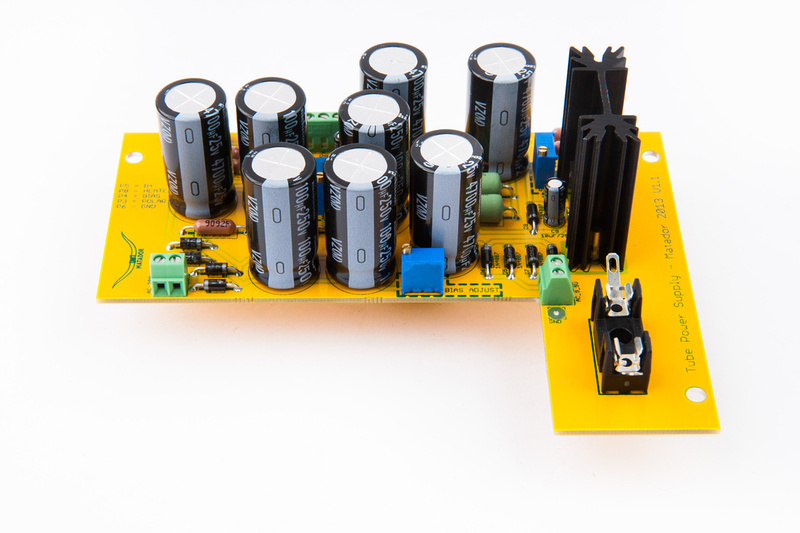 OK with a full understanding of the inherent risks involved in working with DIY electronics, the first step in this project is stripping the stock Alctron HT-11A 9 pattern power supply. We will be reusing most of the original A/C components and wiring in order to save time and cost. 4 screws secure the PSU cover. And 3 screws secure the stock PCB. 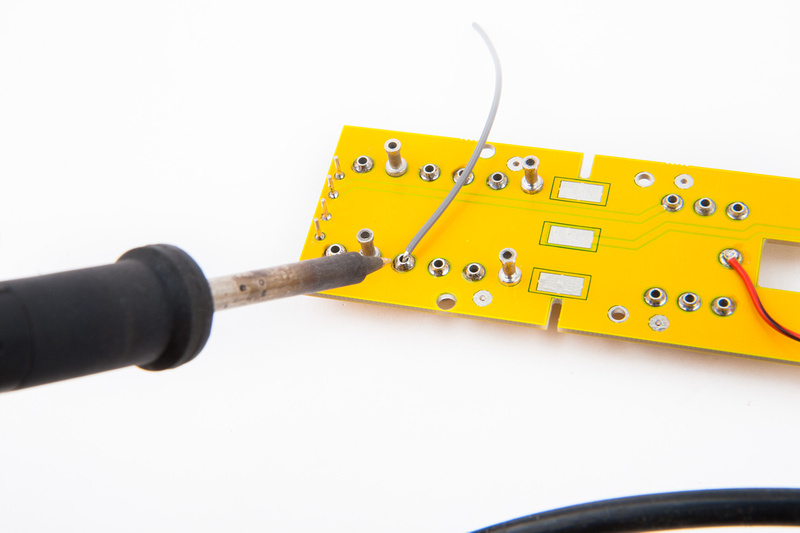 With the PCB loose, we can begin de-soldering the required wires. 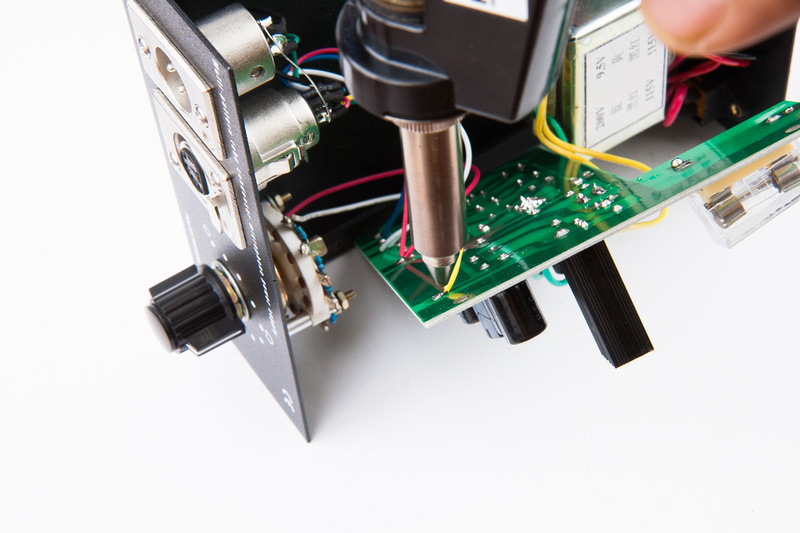 I have grown quite fond of the Hakko 808 desoldering tool. . . while not necessary in this operation, I typically bring it out when doing disassembly work. Disconnect all wires that are connected to the main PCB. 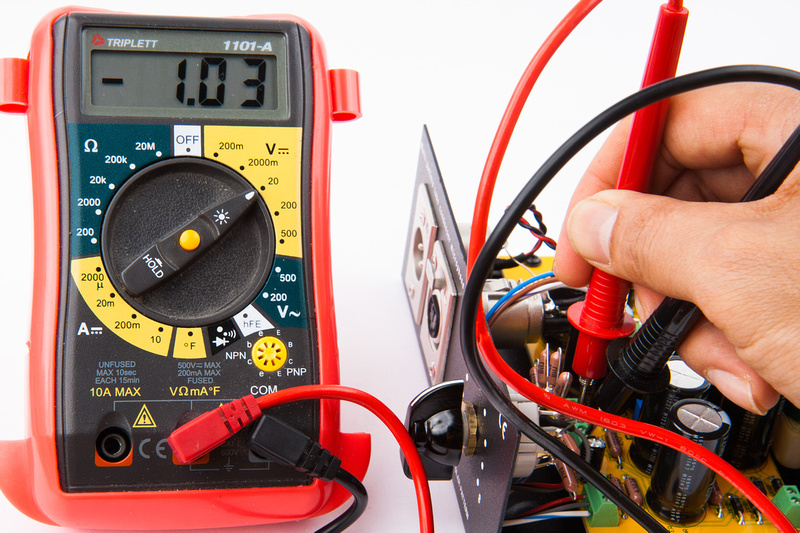 Be sure to note the mains from the IEC and the 9V and 200V A/C wires. 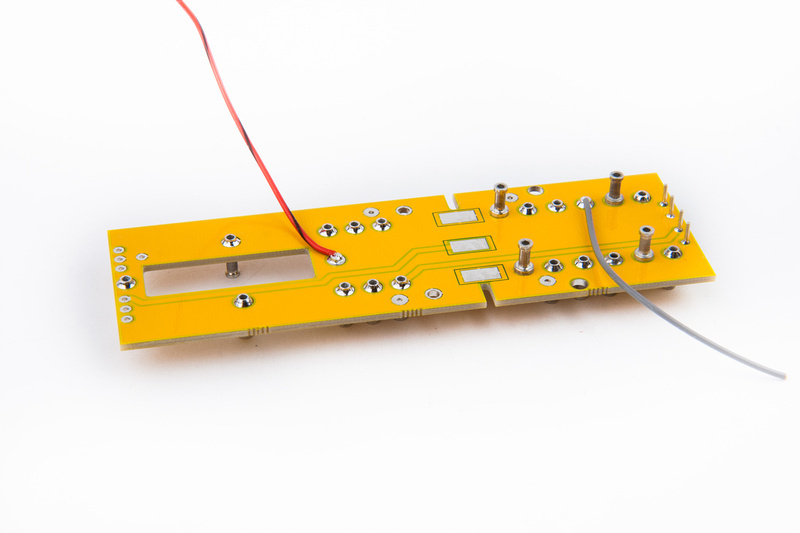 With the PCB removed, we can decide which wires to re-use. 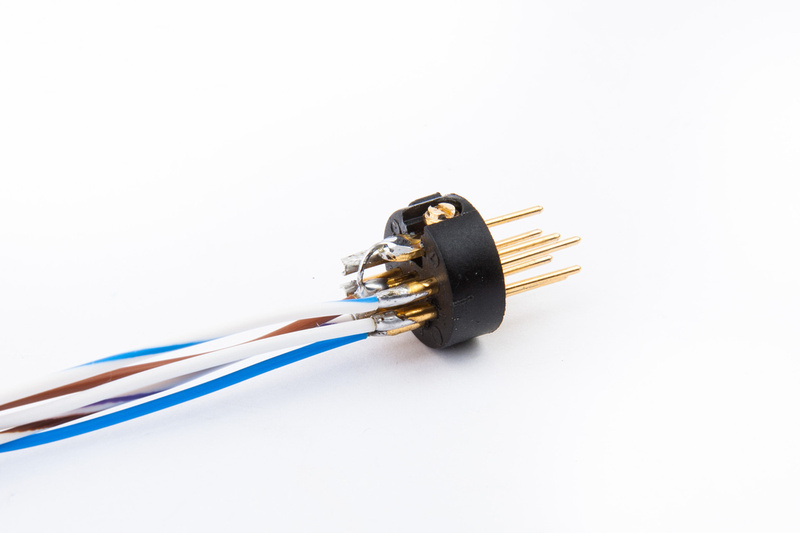 I opt to desolder the 3 pin and 7 pin XLR connectors. The wires that I removed were well soldered and insulated with heat shrink tubing, so it is a viable option to re-use some of these wires, but I like to use new silver teflon wiring throughout. One note here. 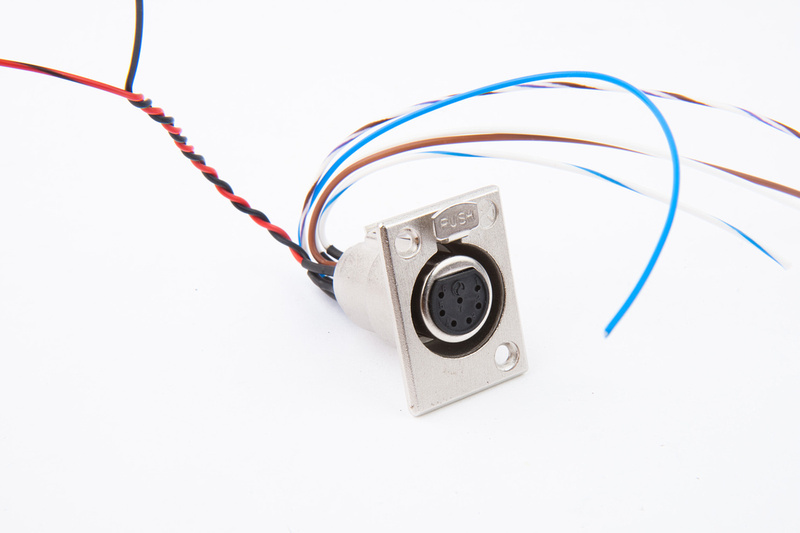 . . the 7 pin xlr connector in the stock PSU is wired with pin 7, pin 4, and the chassis bridged together and connected to ground. 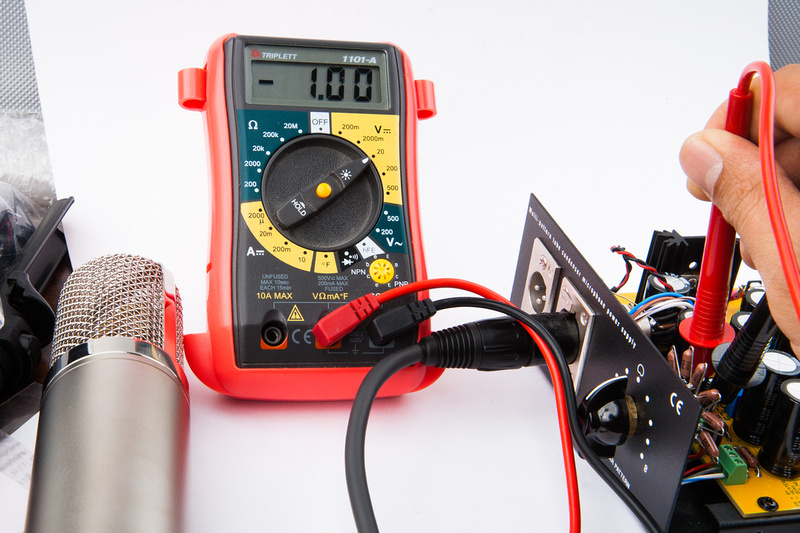 In our new power supply, we will need pin 4 to send our bias voltage to the microphone, so you will need to cut the ground bridge to pin 4 and solder a new wire if reusing the stock wires on the 7 pin XLR. Now, we must decide if we reuse the stock 9 position pattern switch or if we replace it. 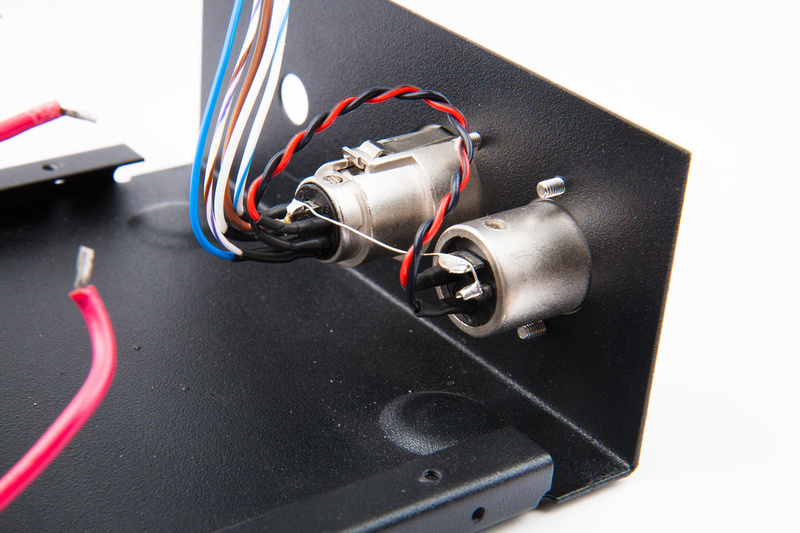 The parts kit includes a sealed Lorin switch, so in this build, we will opt to remove the stock switch and use the kit supplied replacement. 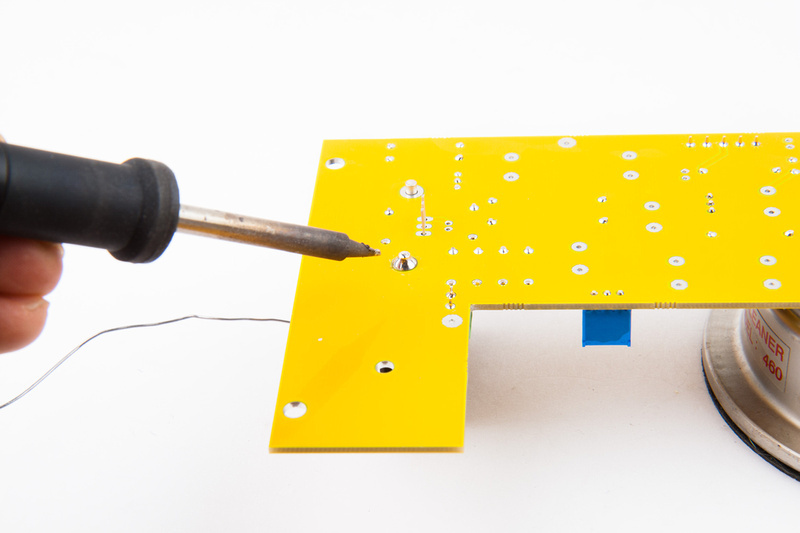 There is a lot less desoldering involved and if you do not own a Hakko 808, I would strongly recommend using the new switch. 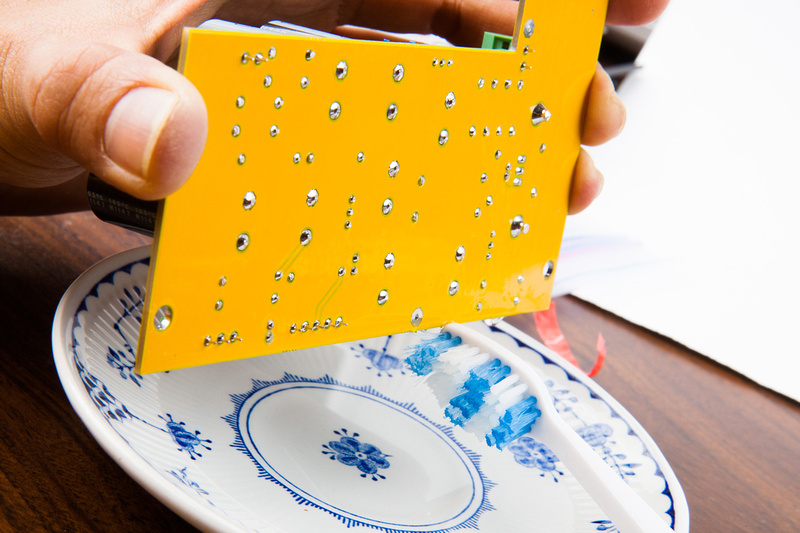 If you have good desoldering capabilities, it is a tossup. Both of the previous prototype builds used the stock switch without any issues whatsoever. 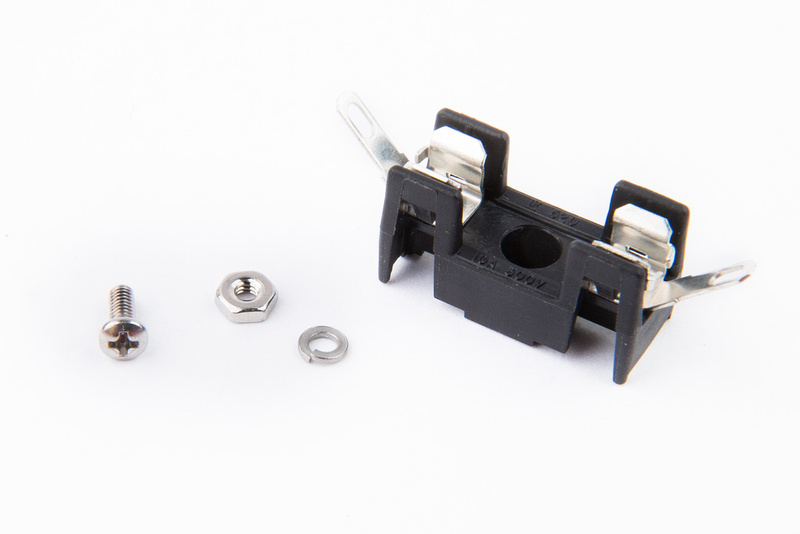 Mechanically, it is a bit stronger than the plastic-bodied Lorin switch, but the contacts are not sealed and are probably not as solid. To remove the stock knob, first pry off the top cover to reveal the tensioning nut. A special keyed tool is needed to remove this knob, so in the interest of time, I bring out my own special tool. . . a dremel cut-off wheel. The smell of melting plastic is a wonderful thing. 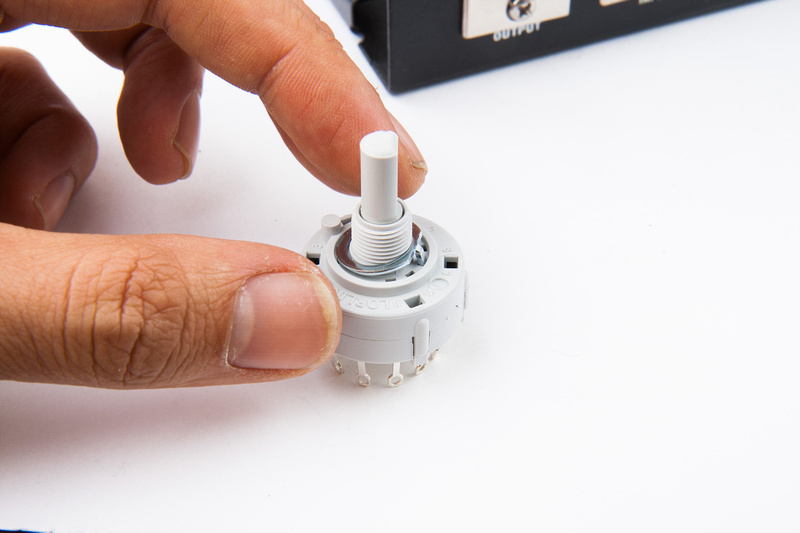 . . it only takes seconds to cut around the perimeter of the plastic knob to access the knob-setting screw. 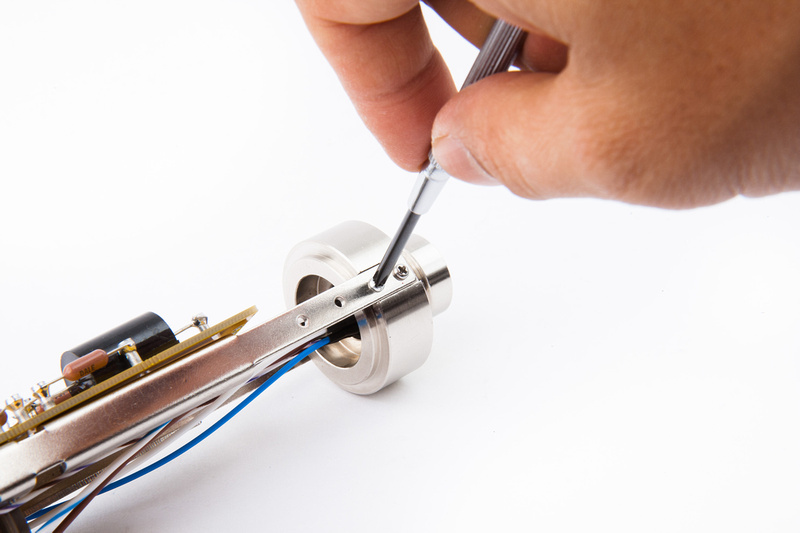 Once the plastic is clear, normal tools can be used to easily remove the knob. The stock switch comes out. The Lorin switch can be found in this baggie. Remove the nut and lock washer to access the stop ring. We will place the stop ring's pin into this slot for our 9 position configuration. Next, pull the 8 402K switch resistors. They can be found in this baggie. 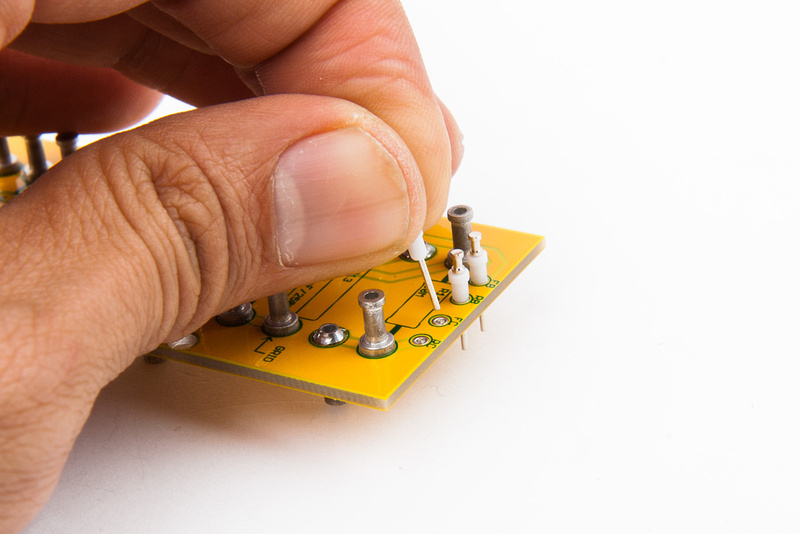 Use a small screwdriver to bend the leads on the resistors. 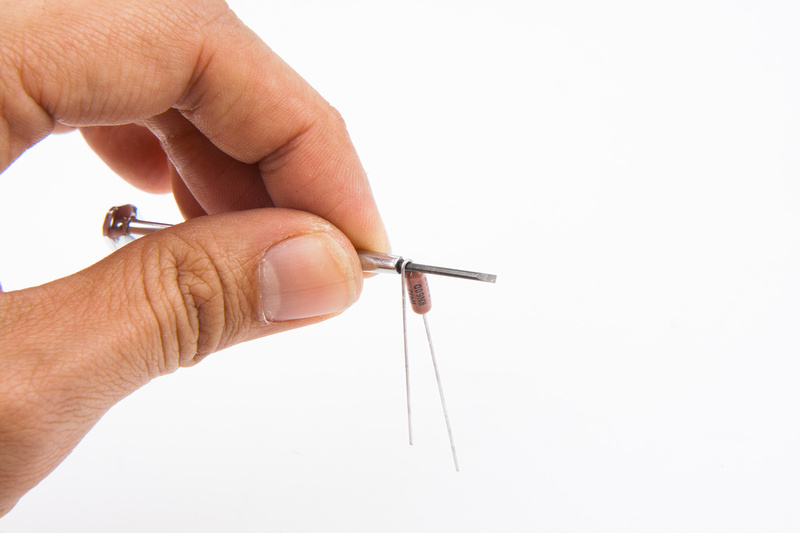 Place a wire into the pin 1 slot and position the first resistor between pin 1 and pin 2. . . and another resistor between pin 2 and pin 3. We will go around the switch in this fashion.
. . . and go around until we get to pin 9 where we will add another wire. In this case, I use red. I also add a grey wire to the center switch terminal. 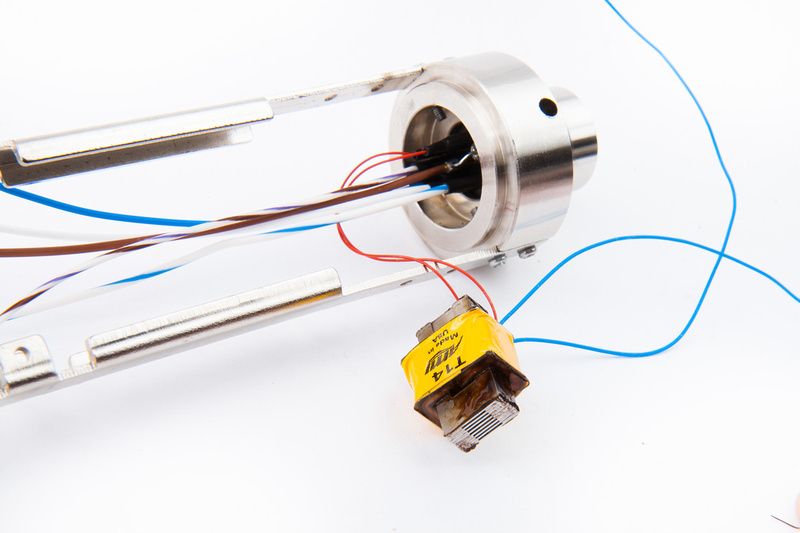 I attache another wire to the center pin and test the switch for function. We should have 3.2M ohm between the red and white wires. . . and between the white or red wires and the center terminal, we should have nice 400K steps all the way around. 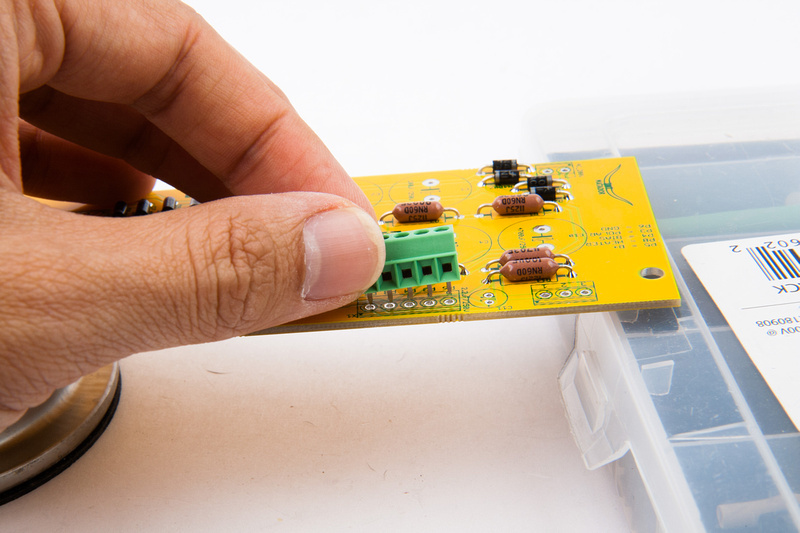 If you opt to reuse the stock switch, I found that it is possible to desolder all of the stock resistors and replace them with the kit resistors and new wires without removing the switch. 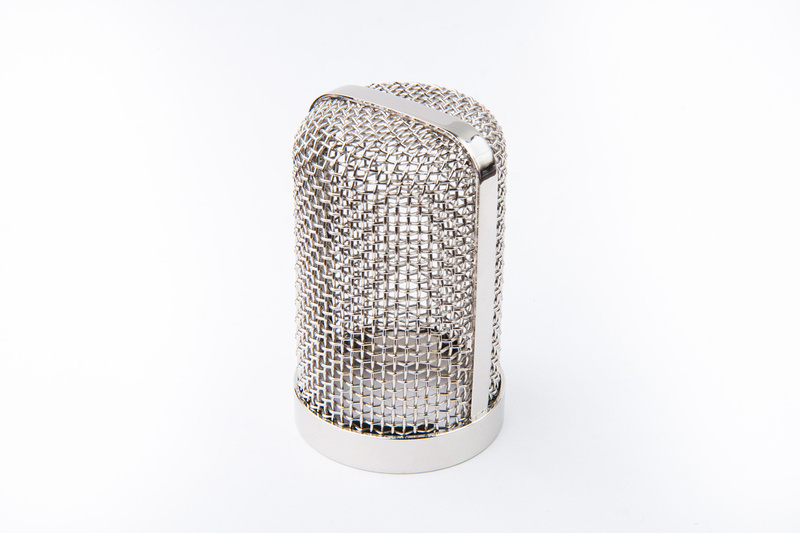 . . this way, the stock knob can be retained without destroying it upon removal. 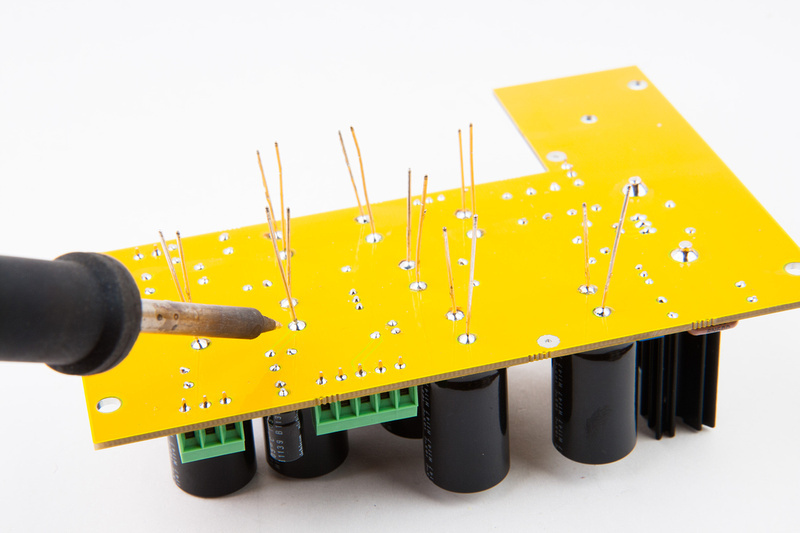 As mentioned above, without good desoldering tools, this could be a very difficult operation as the plastic parts in the stock switch melt quite easily. 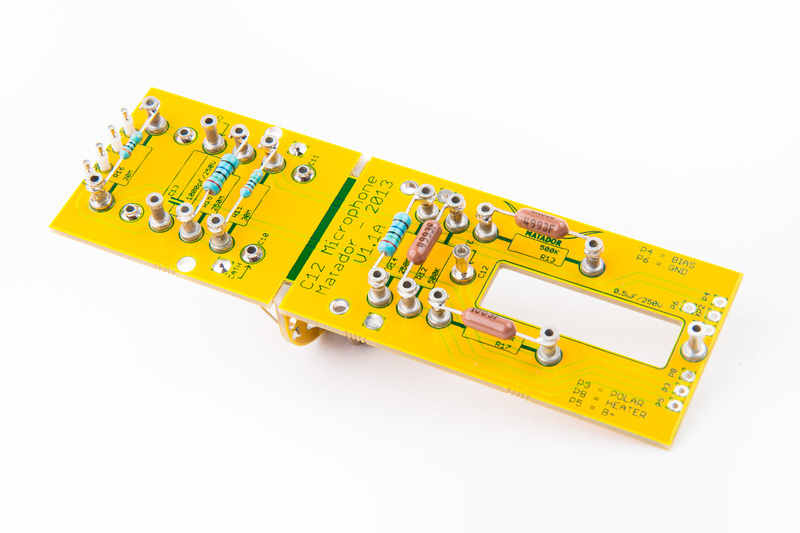 The stock switch with resistors and wires replaced would look like this. 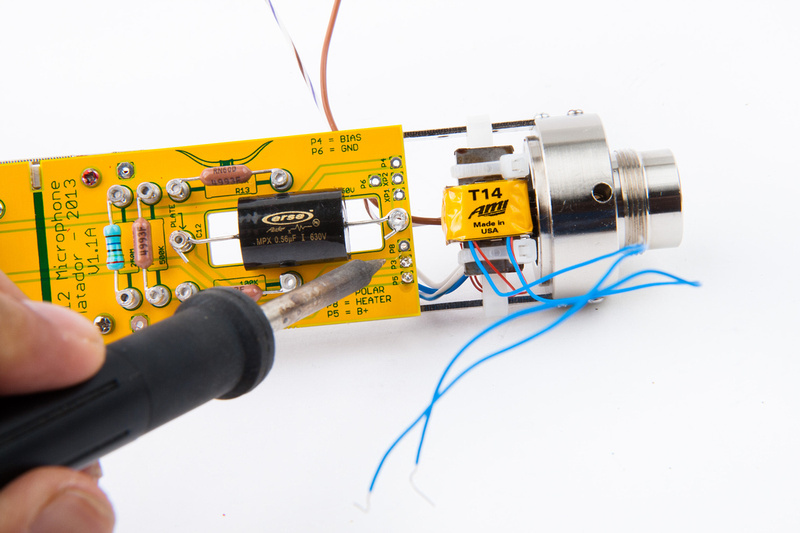 Next, I cut the power supply pcb loose from the PCB set with a cutoff wheel. A file can be used to quickly touch up the protruding tabs. And we can now test fit the new pcb into the case. 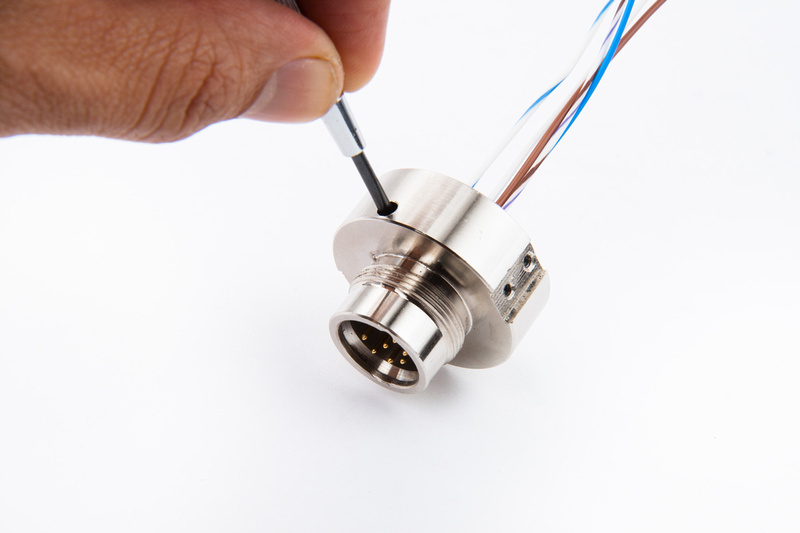 Because I decided to desolder the stock XLR connectors, I use 22 gauge silver teflon wire to rewire the jack. The colors chosen have no particular significance. 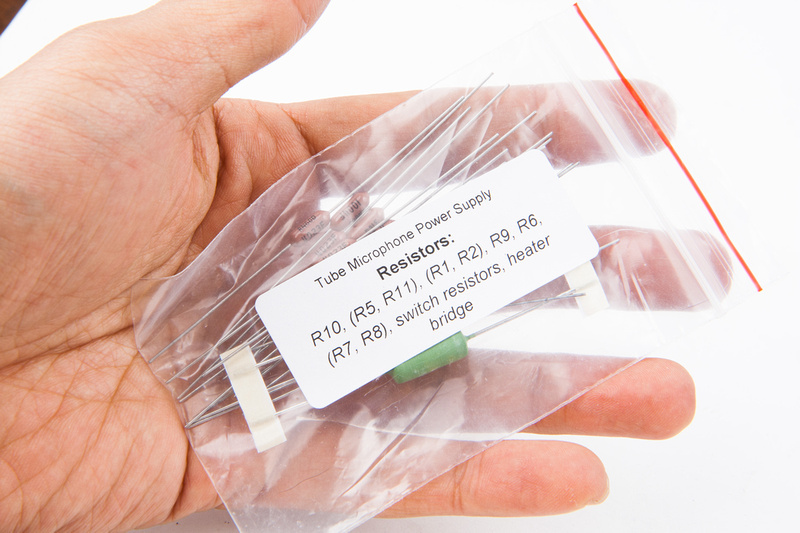 They are just what I had on hand and selected so I can differentiate easily between the various pins when wiring up the psu. It never hurts to keep builds clean. 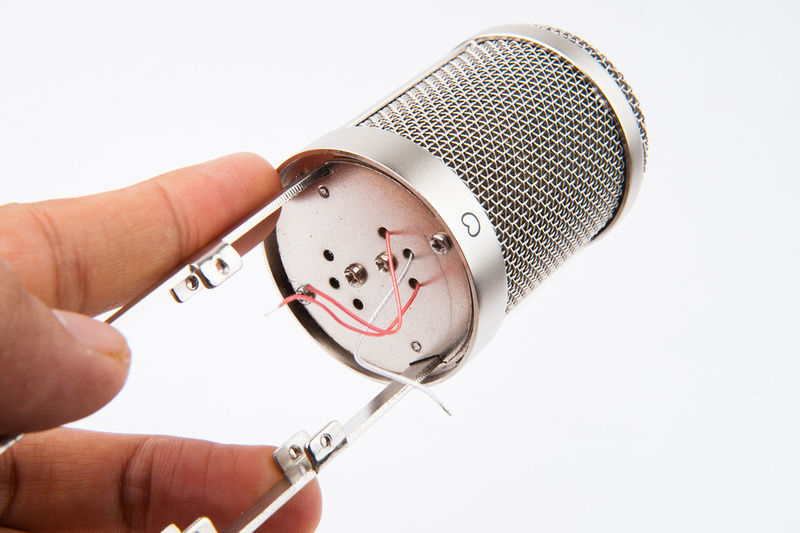 Since building microphones, I've been extra obsessive about it. 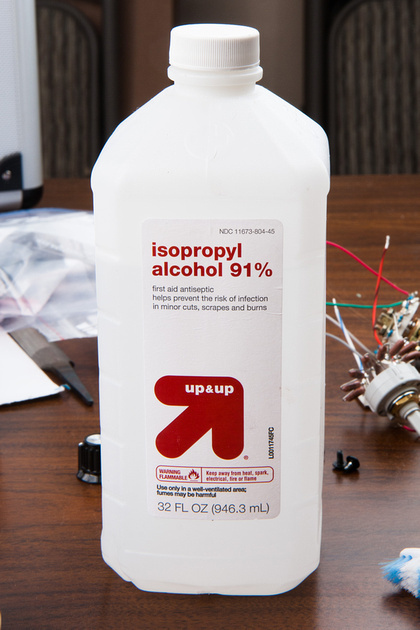 Most local drugstores would have 90% isopropyl alcohol, and along with a toothbrush, this seems to work quite well cleaning flux off of my solder joints. It dries quickly and does not leave residue. So, I start by giving the bare pcb a good dunk and scrub. 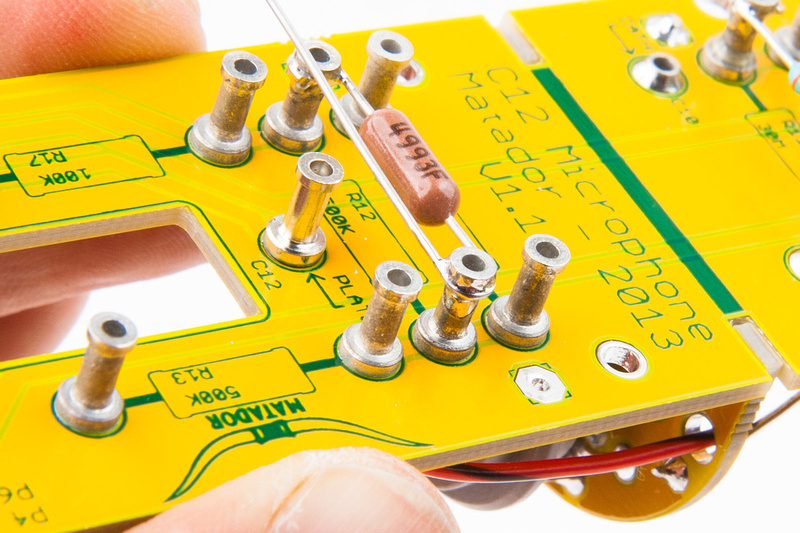 Since we already have the resistors out, I start by populating the metal film resistors on the PCB. 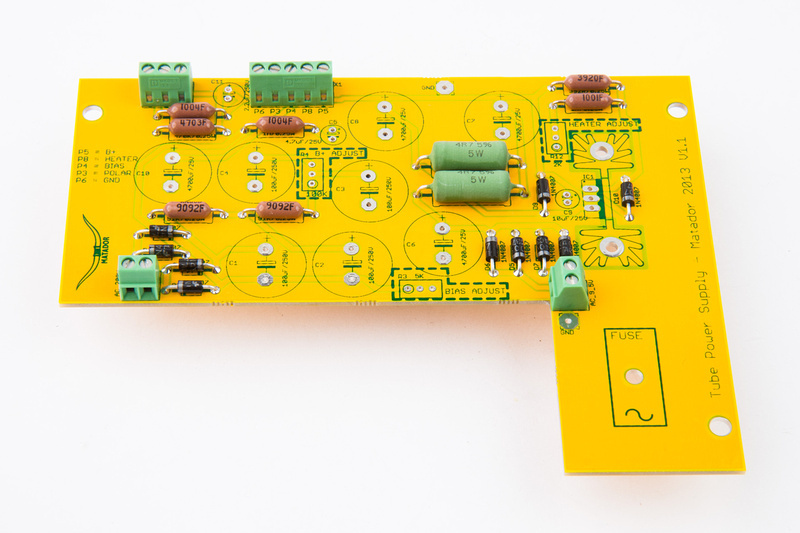 All parts are clearly marked on the PCB. 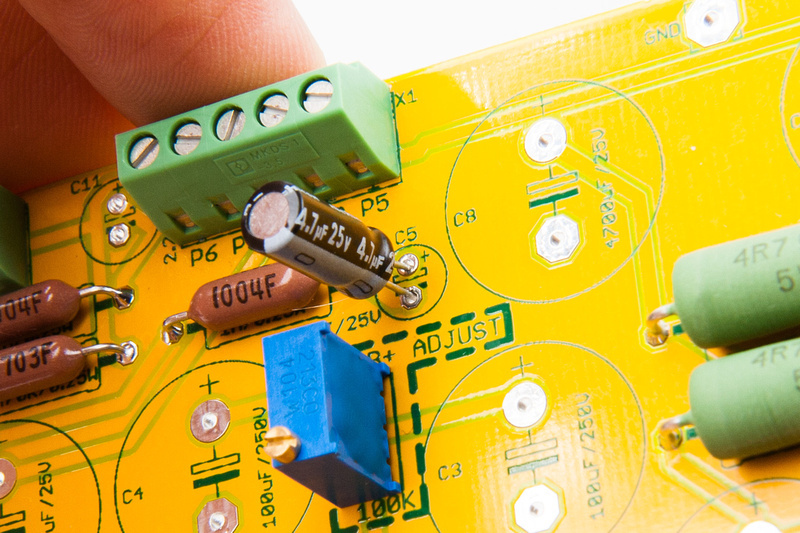 Note: The current revision PCB's do not have values listed on the components. 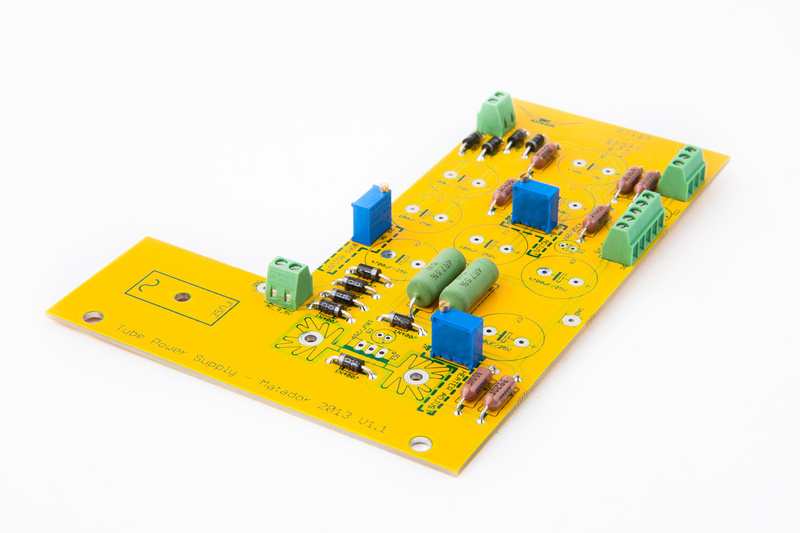 Please refer to the BOM and schematic to verify the value of each component indicated on the PCB. 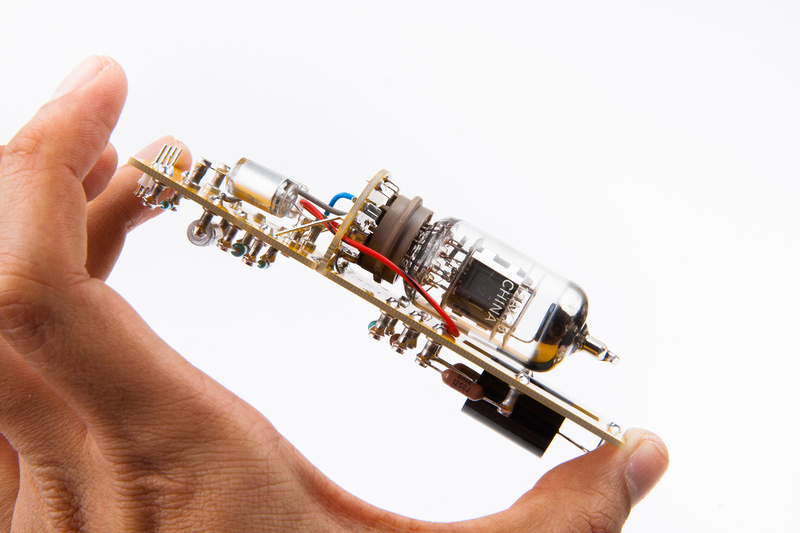 All other components are the same as 1st revision. 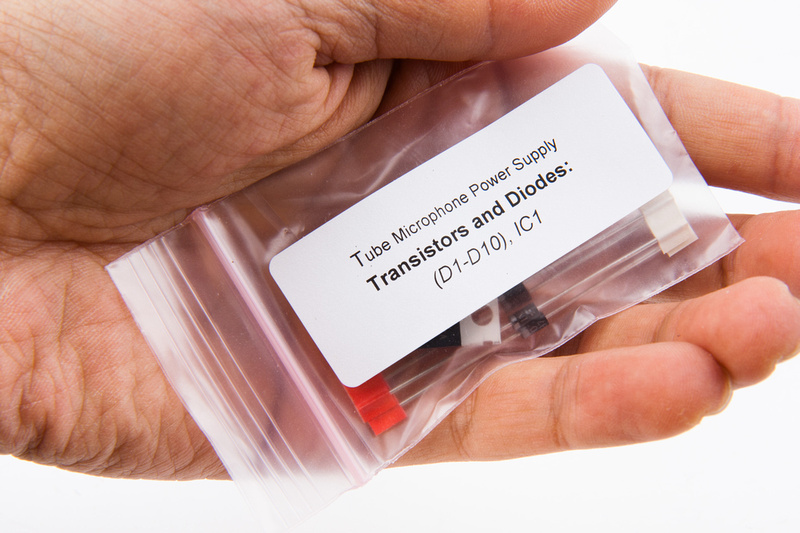 For builders who wish to use the 12AT7 tube in their build instead of the original 6072A tube, 33K resistors should be substituted in the R1 and R2 positions. 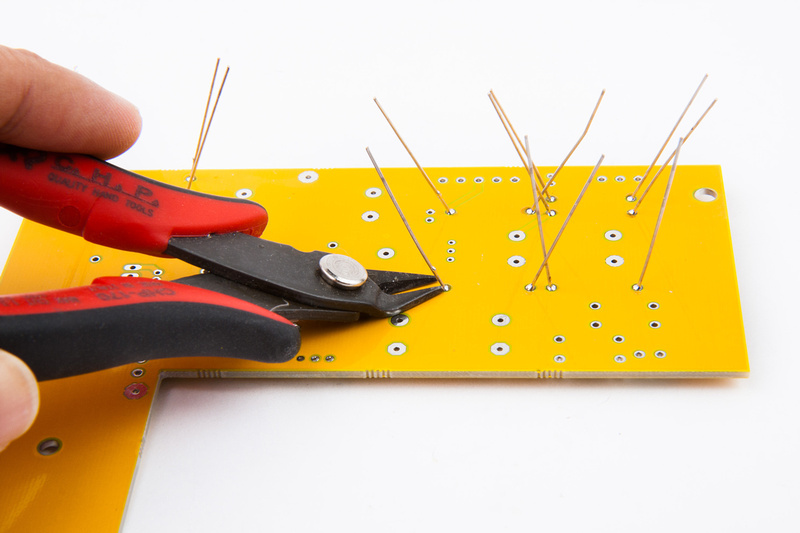 After placing all the resistors, bend the leads out to keep them in place, flip the board over, and solder. And populate them making sure to heed the polarity indicated on the silk screen. 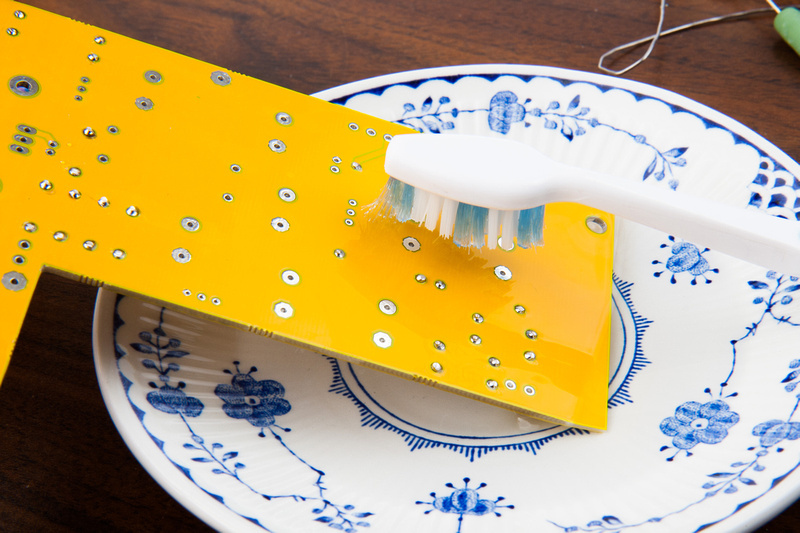 And, another trip to the cleaning dish to clear the flux from the solder joints. 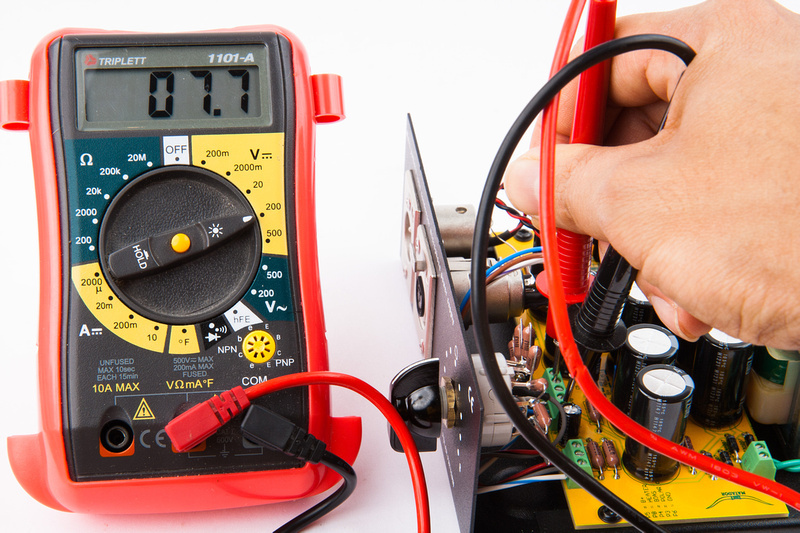 It's not a bad idea to triple check to make sure everything is in the correct polarity. 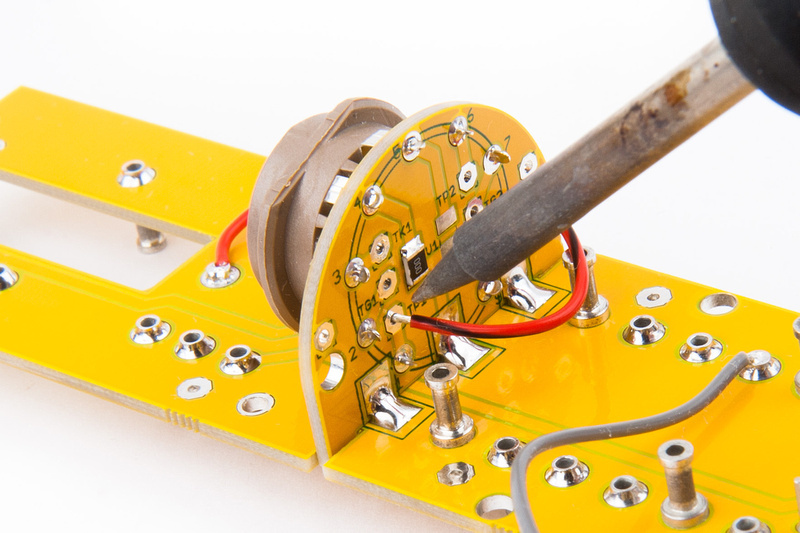 Next, place the wirewound resistors. And populate the terminal blocks. 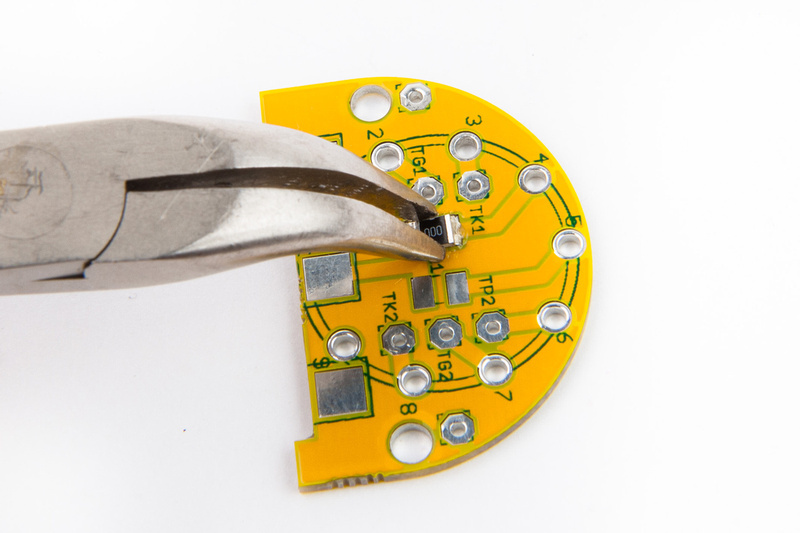 I find it easiest to solder one lug and then check to confirm the block is seated flush to the PCB. 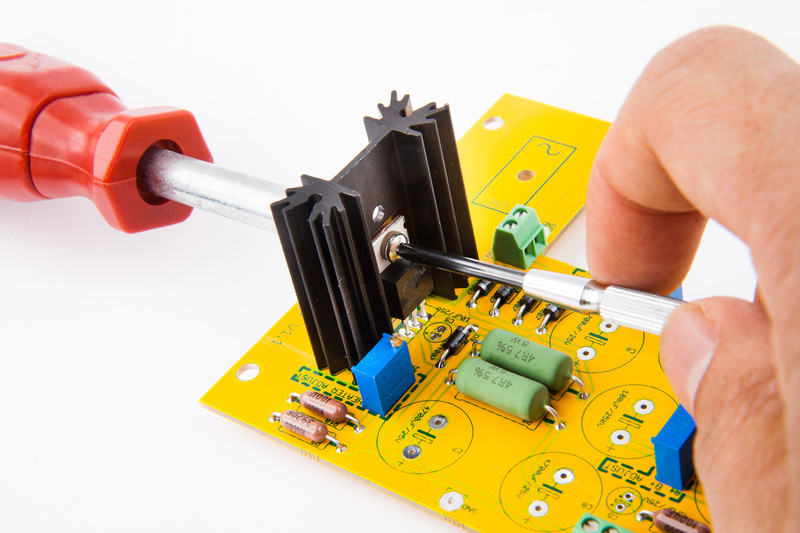 If not, pressure can be applied to the block while re-heating the single solder joint to position the block. And terminal blocks are in place. Next, pull the trimmer pots. Note: all 3 of these trimmer pots are different values. 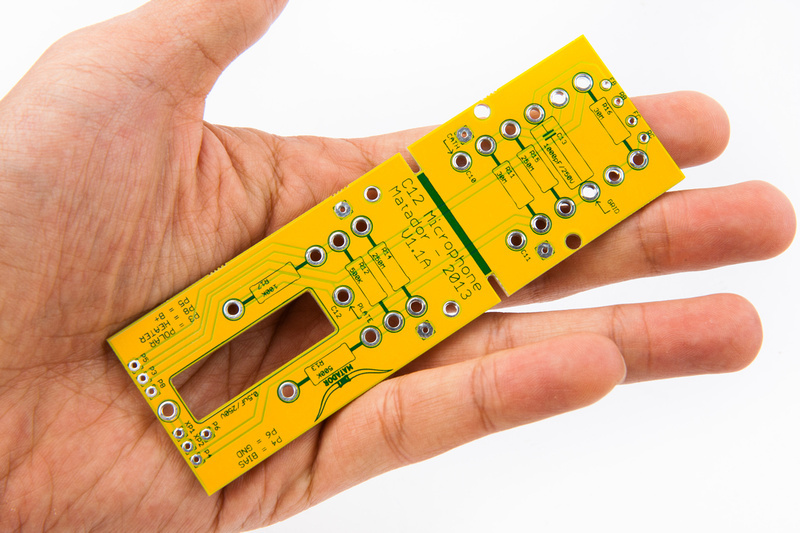 Please refer to the BOM, schematic, and the silk-screen print on the PCB and make sure the trimmers are placed in the correct positions. Switching these up is a very common build error. And install in the same manner as the terminal blocks. 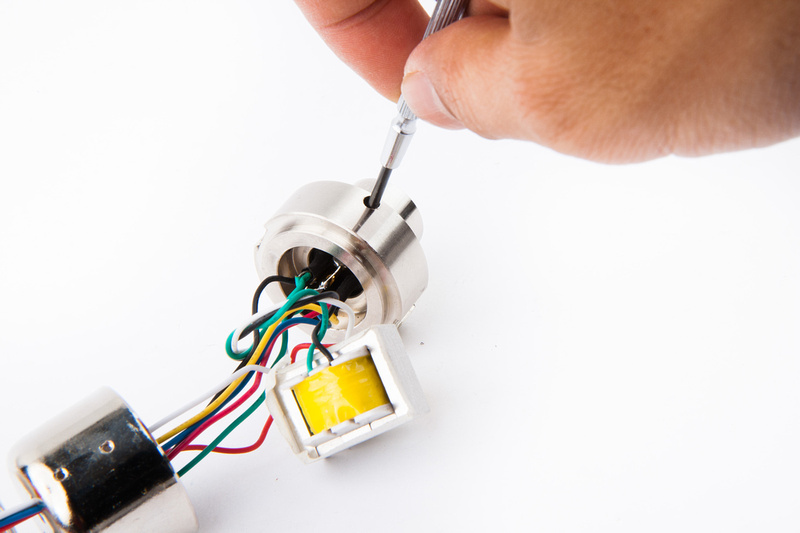 Values can be checked with a DMM by probing the outer 2 legs of the pots. 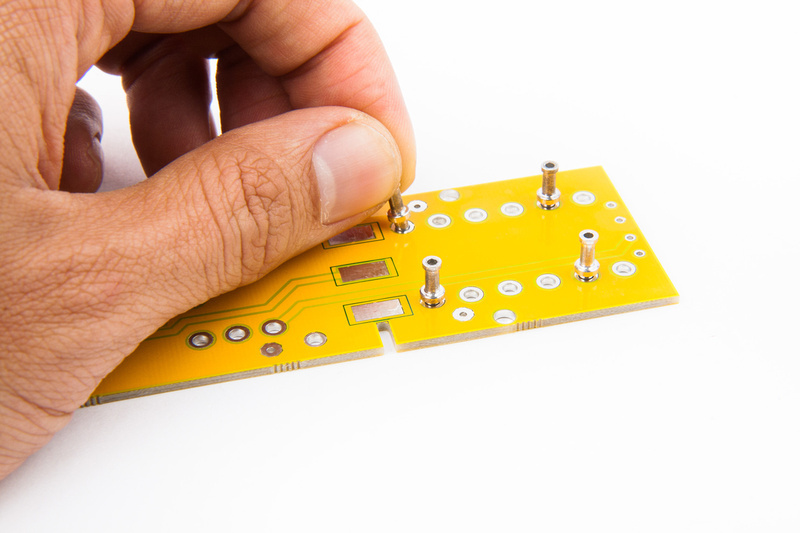 Next, pull hardware for mounting the heatsink and LM317 regulator. Position the insulating pad on the heatsink. 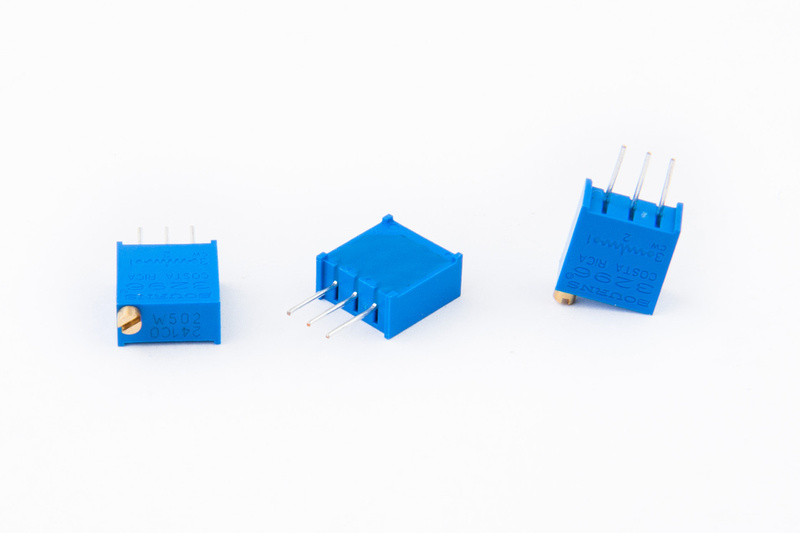 Place the plastic shoulder washer in the LM317. Put the 4-40 screw through the shoulder washer. 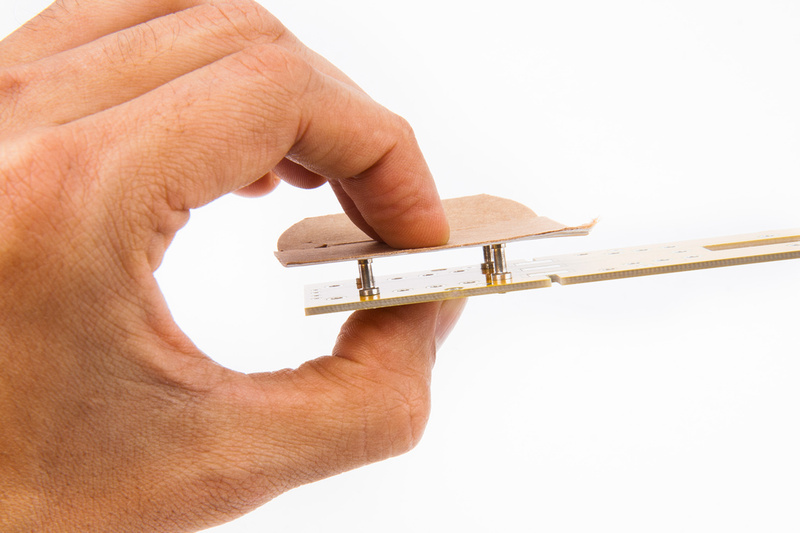 And place the assembly on the heatsink. On the back side, the flat washer goes first. And finally the nut. Fit everything together loosely right now. 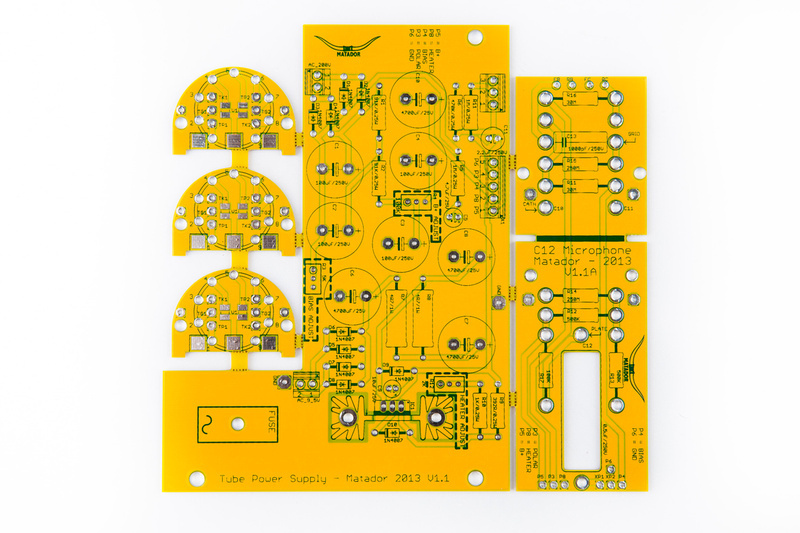 Next, with the LM317 free to wiggle still, place the entire assembly on the pcb. Set your soldering iron to the nuclear setting if you have that. 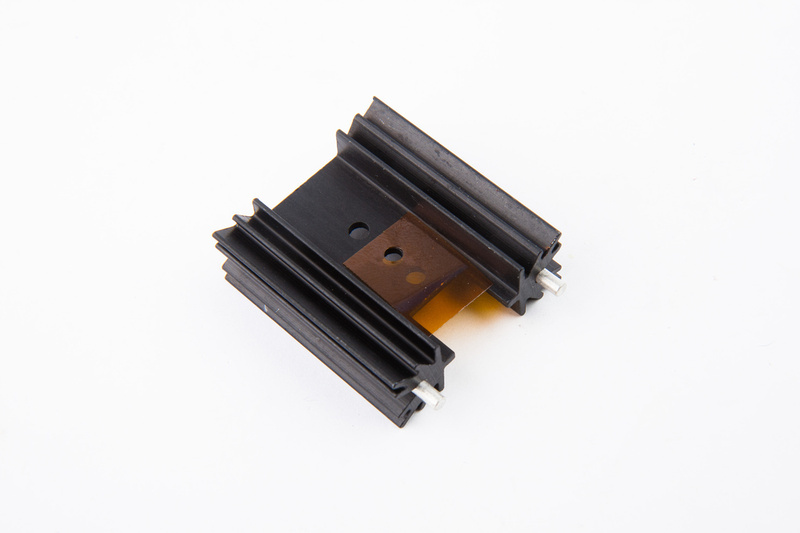 .. the heat sink is very efficient at, well, dissipating heat, a bit more juice than normal might be needed to get a nice joint. 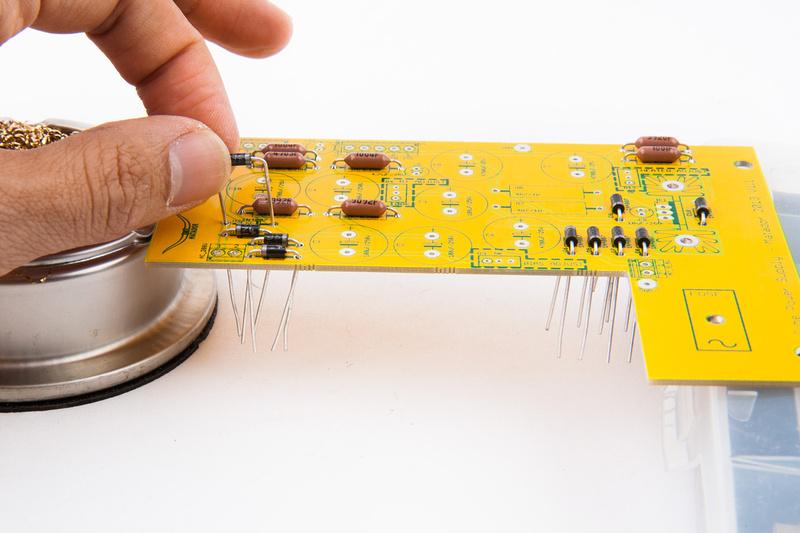 Solder one leg while simultaneously pressing down firmly on the heat sink to seat it flush to the pcb. 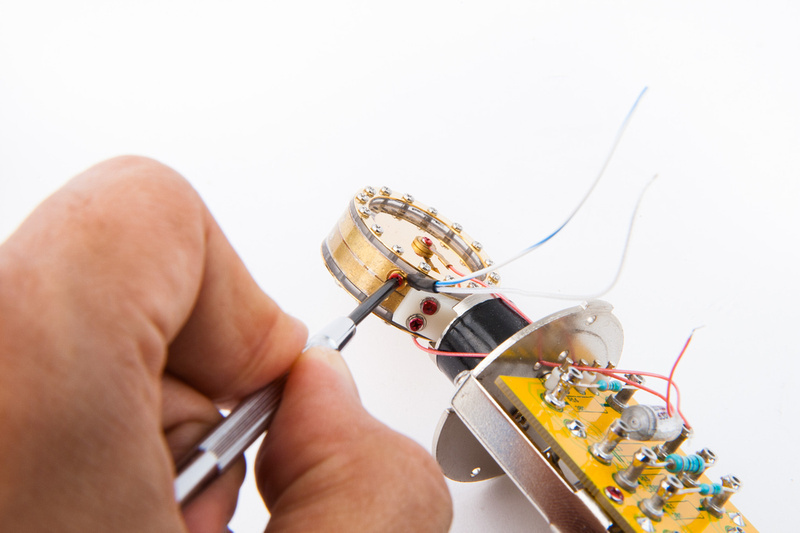 After verifying the heatsink is sitting where it should, solder the remaining leg into place and tighten the LM317 to final torque. 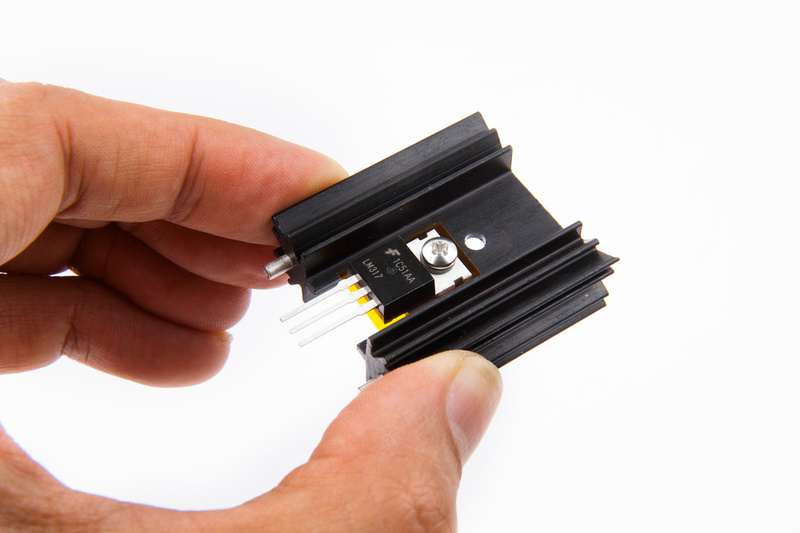 It should press firmly against the heatsink. 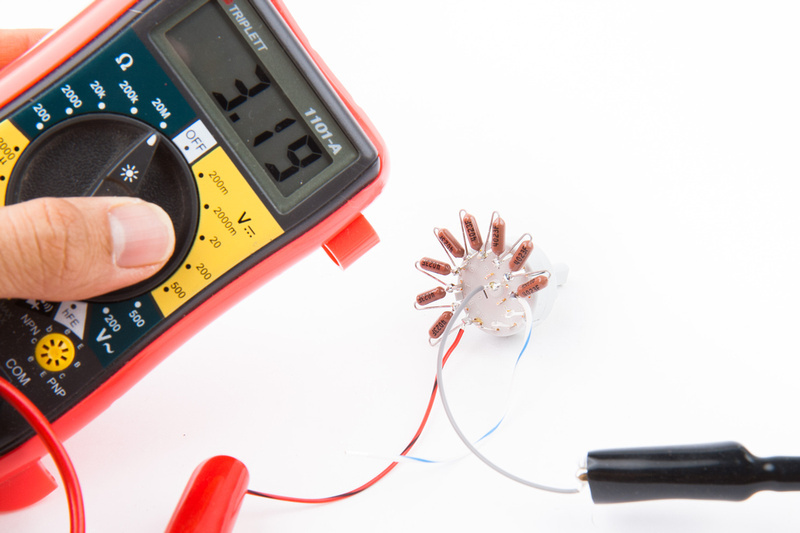 Next, verify with a multimeter that the heatsink is in fact electrically isolated from the metal face of the LM317. 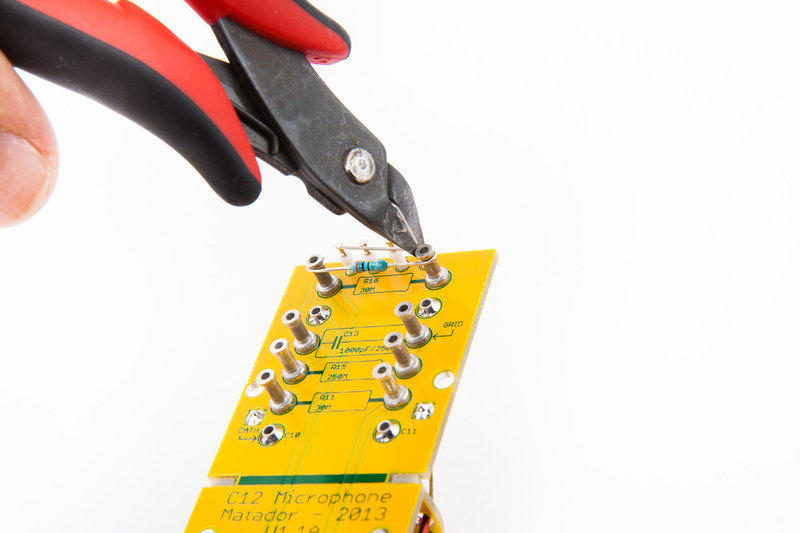 And solder the LM317 into the pcb. And, because I'm obsessive compulsive, I take the opportunity to scrub the pcb again with denatured alcohol to remove flux. 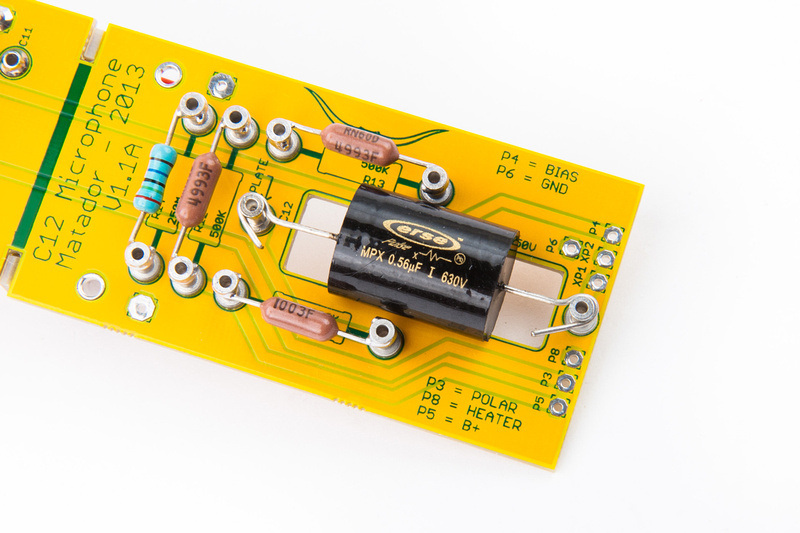 Next, pull the electrolytic capacitors and populate them on the pcb. 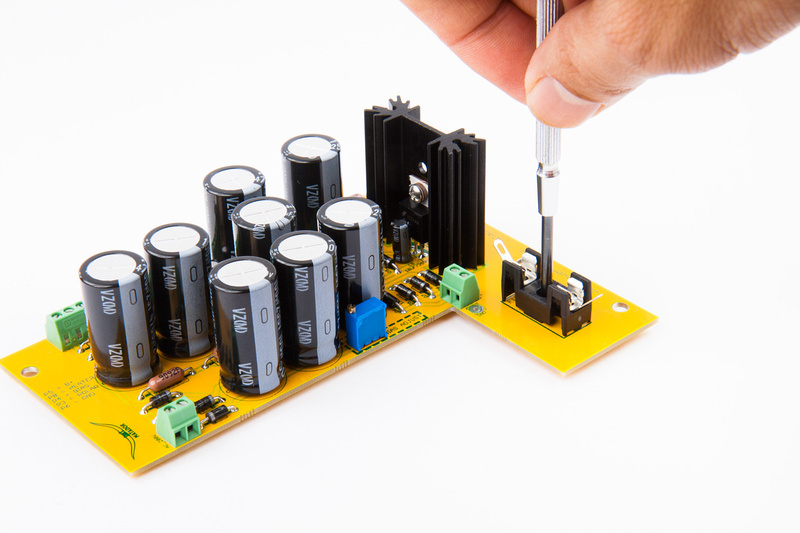 Special Note: Pay particular attention to the values of the small electrolytic capacitors. Even though they are the same size, the values are different. 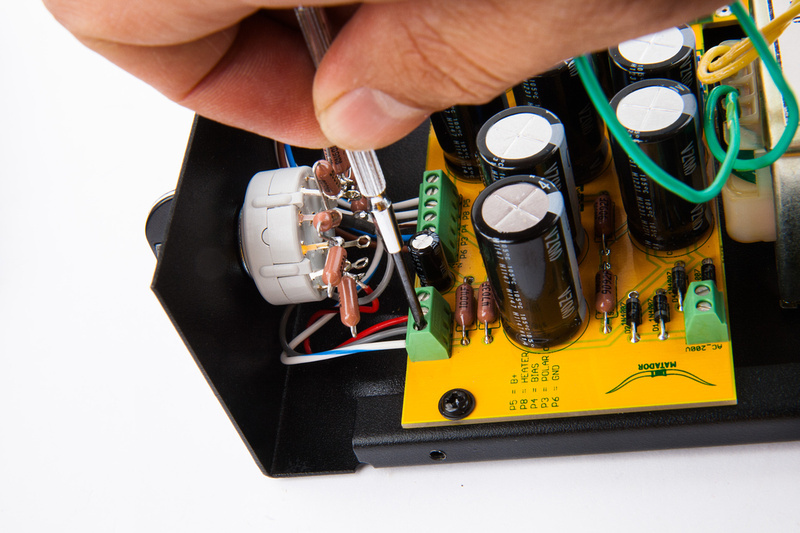 Please heed and double check the small value markings on each capacitor carefully before installing. 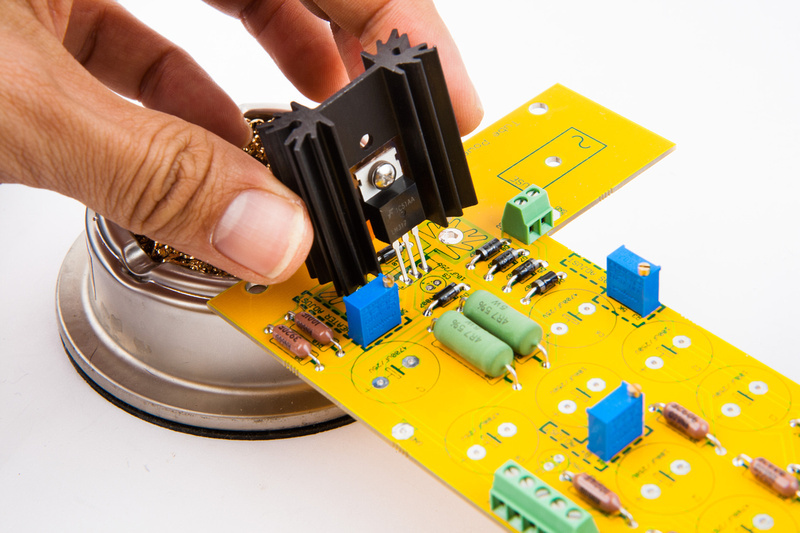 If accidentally switched on the PCB, can result in smoke, lack of B+ voltage, overheated transformer, and other unpleasantness. We have had 2 instances of this particular build error reported. The small one near the heatsink seems like it would be most difficult to install if other tall parts surround it, so install that one first. 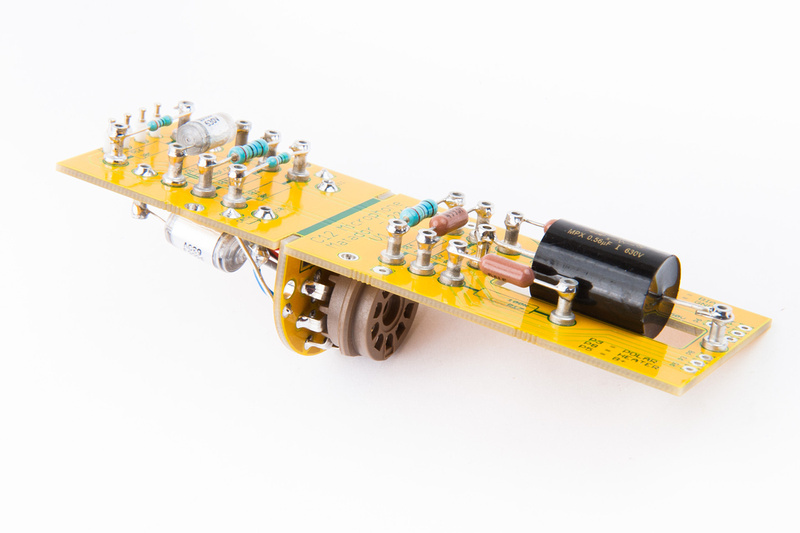 Polarity matters on these capacitors so make sure the long leg goes into the "+" side and the side indicated by the white stripe goes on the "-" side. The silkscreen clearly indicates a "+" symbol as a guide. Also, all of the capacitors orient the same direction on the pcb, so all of the white stripes should end up facing one direction. 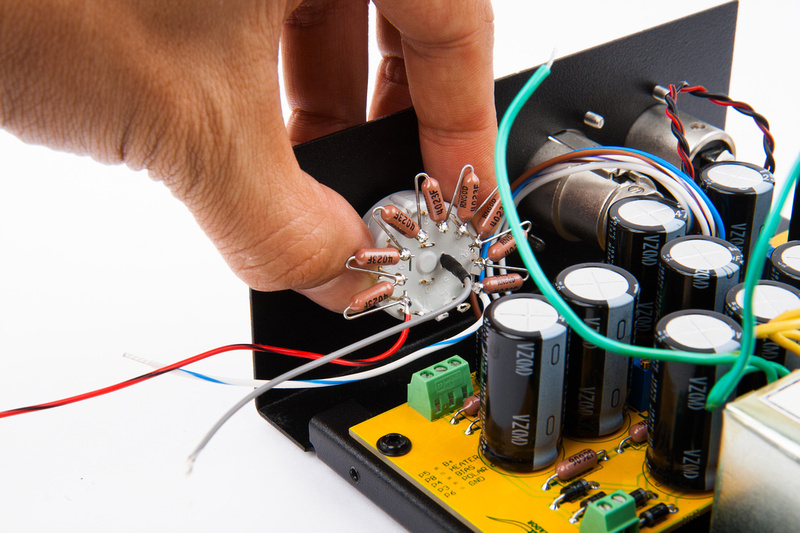 Place all of the capacitors in position. And, I take another cleaning break. Next, pull the fuse holder and the 2-56 screw, nut, and lock washer. 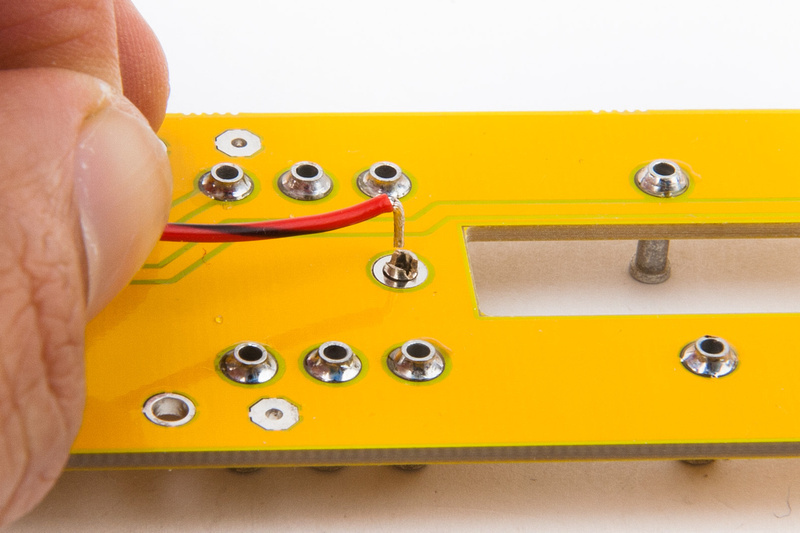 The lock washer and nut install on the back side of the pcb. 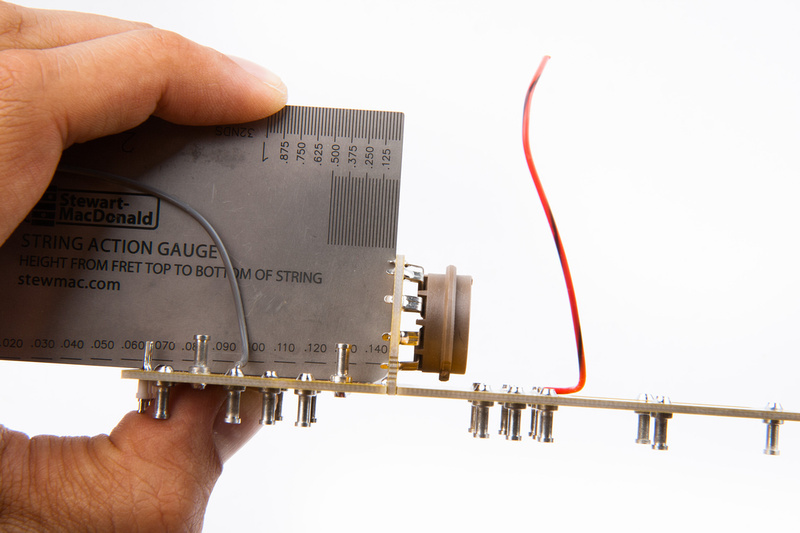 And once the fuse holder is aligned with the silkscreen, tighten to final torque. 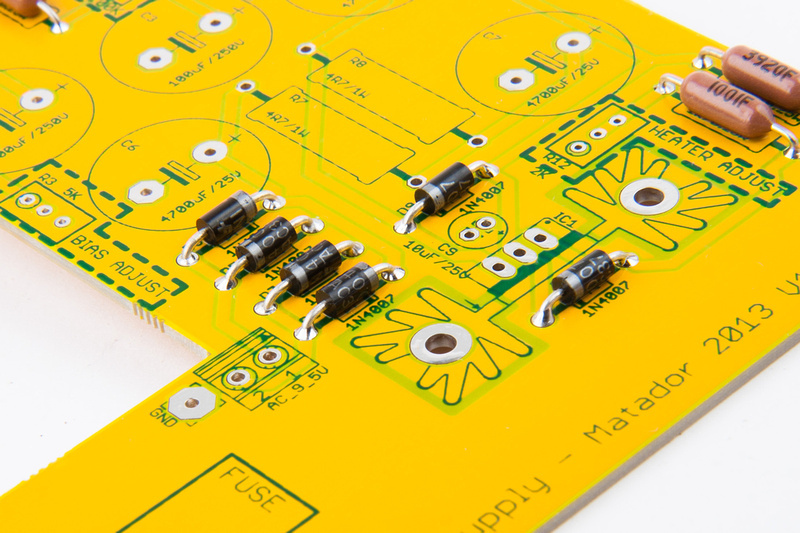 And, the power supply pcb is now fully populated. Next, begin installing components back into the chassis. 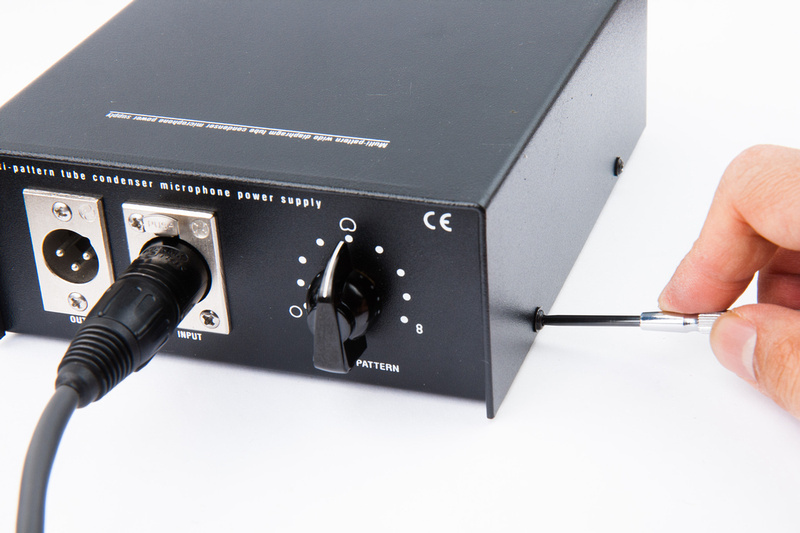 Start with the 7 pin and 3 pin XLR jacks. 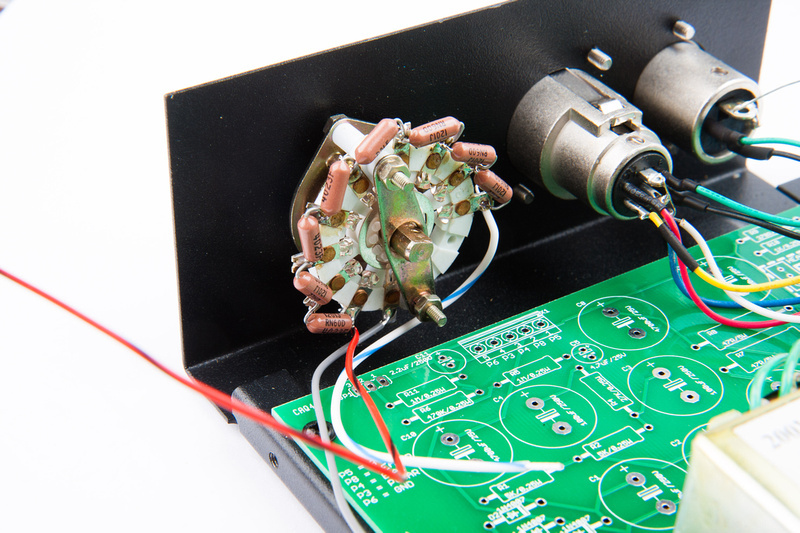 A quick test fit of the populated pcb informs the wire path. Next, because I foolishly disconnect the stock wiring, I need to re-solder the 3 pin xlr. 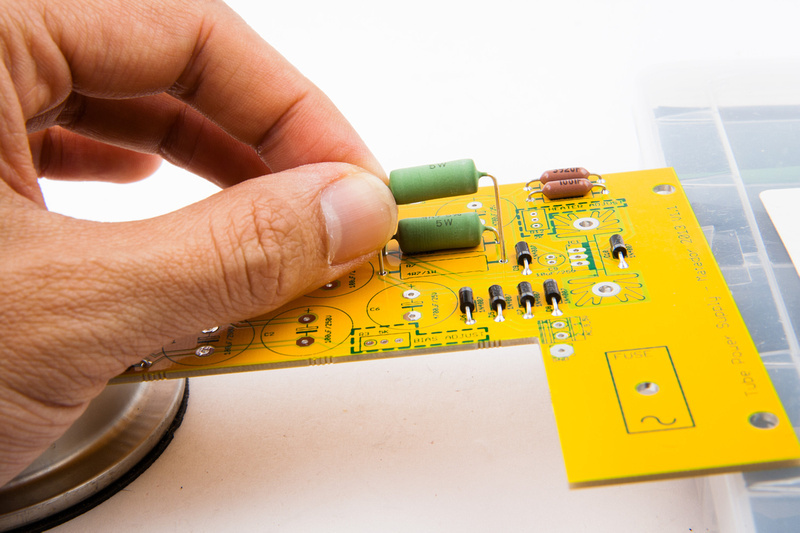 At this time, the pcb can be fitted for final installation. And the wire leads on the 7 pin XLR trimmed to length, stripped, tinned, and installed. Next, install the pattern switch. 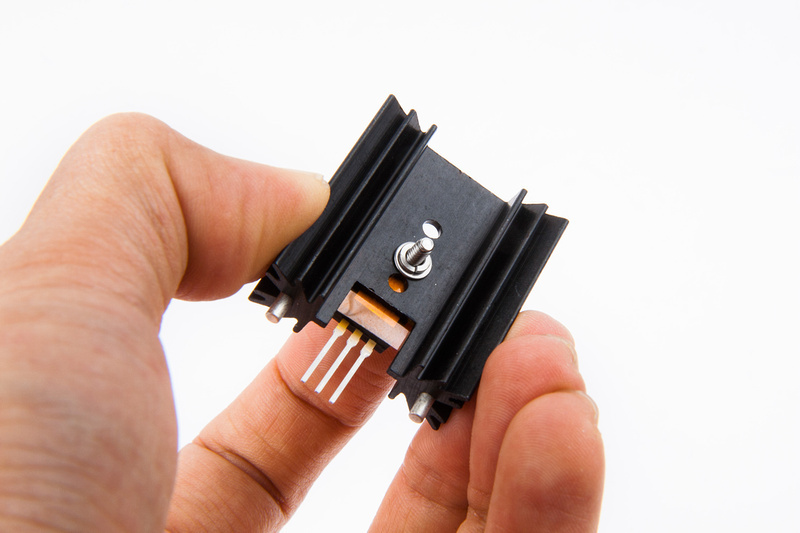 I opt to cut the position pin from the switch chassis. 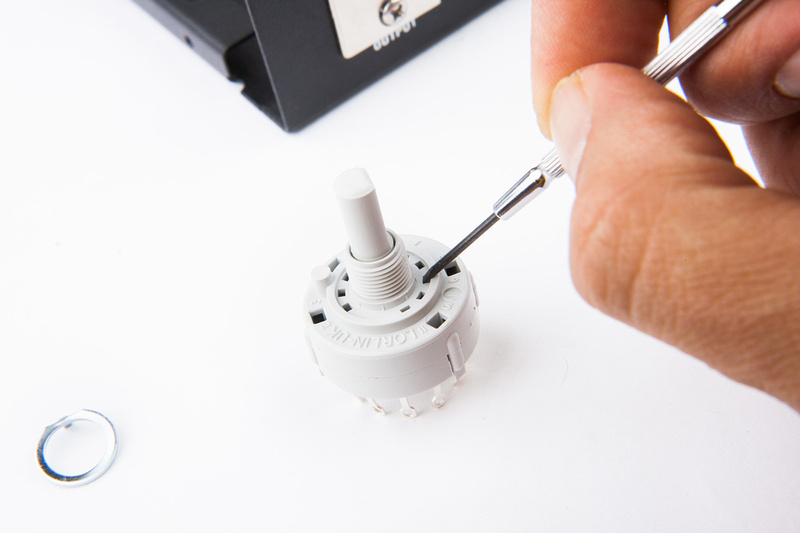 I considered drilling a hole in the case to use the stop pin, but the hole would not have been completely hidden behind the knob I chose to use, so I decided to simply cut the pin and trust the lock washer to secure the switch from rotating after installation. 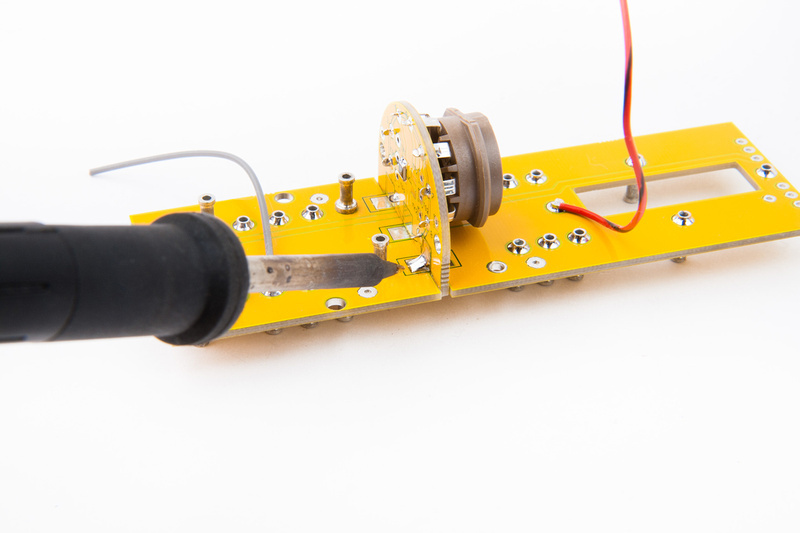 The Lorin switch is a little bit long for the knob, so I use a cutoff wheel to shorten it a bit. And, the knob is installed. Trim the switch leads to length and tin the tips. And install the wires into the terminal block. And the DC side of the psu is now all wired up. Next, install the 9.5V and 200V A/C leads from the power transformer in the corresponding terminal blocks. And solder the fuse holder terminals to the power switch. Install the slow blow fuse. And the power supply is now complete. OK. . . time to power it up and see if anything smokes or explodes. No smoke. 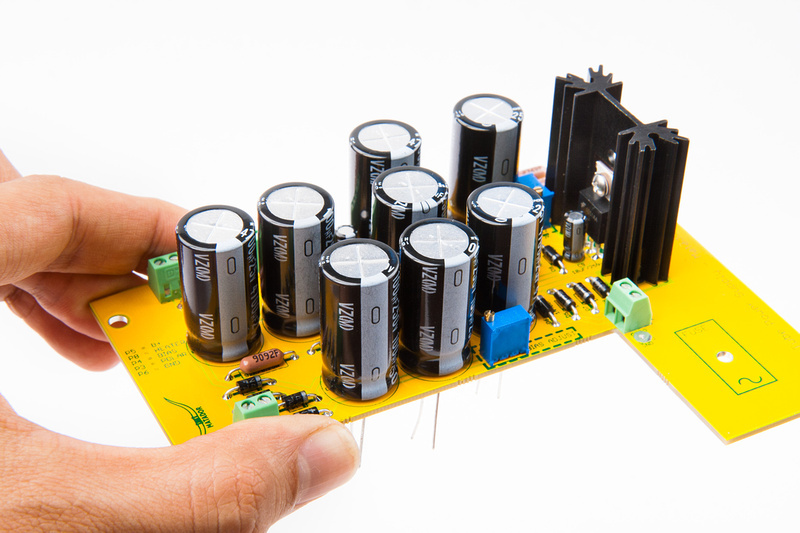 No exploding capacitors. These are very good signs. With no load, B+ is at 195V out of the gate. Heater is sitting at 7.7V. And our bias is sitting at -1.03V. 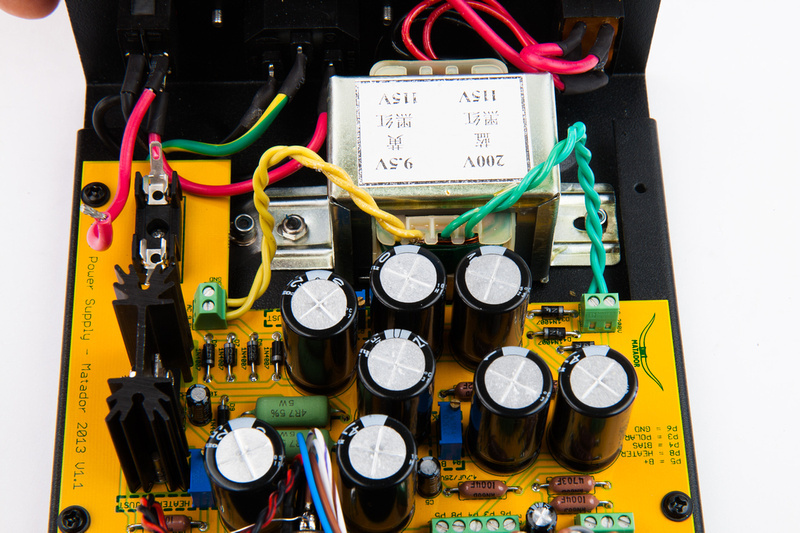 Since I know the heater in this power supply is regulated, I adjust that without load to 6.3V with a few turns of the trim pot. 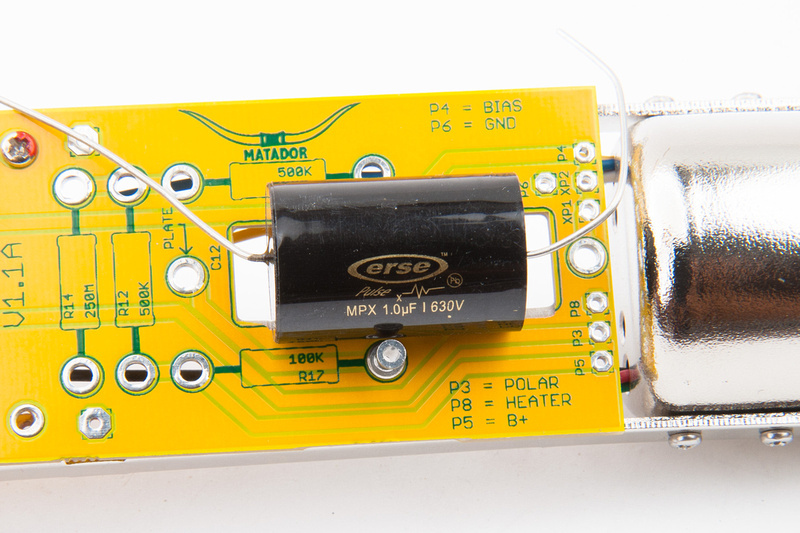 Matador recommends strapping a 180K resistor across B+ and Ground to calibrate B+ and the bias voltage within a reasonable approximation. 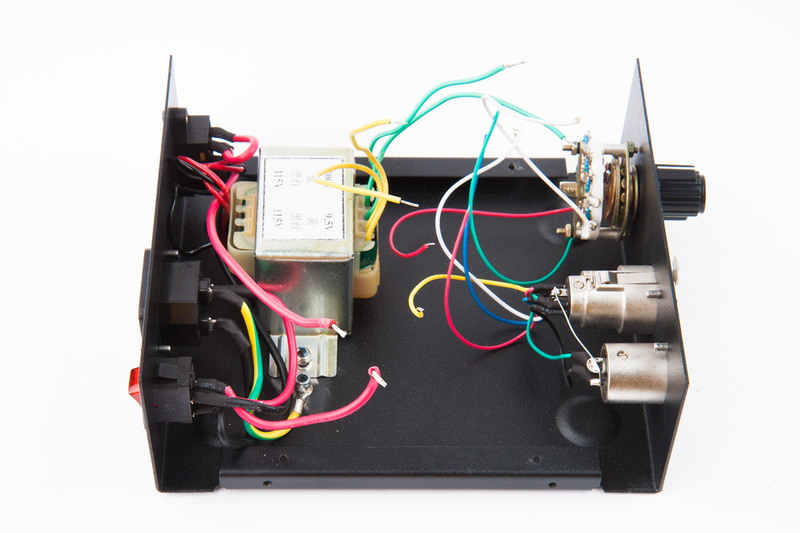 I plan to fire up the microphone with the stock Alctron capsule connected, and the original power supply has a B+ specification of 200V. 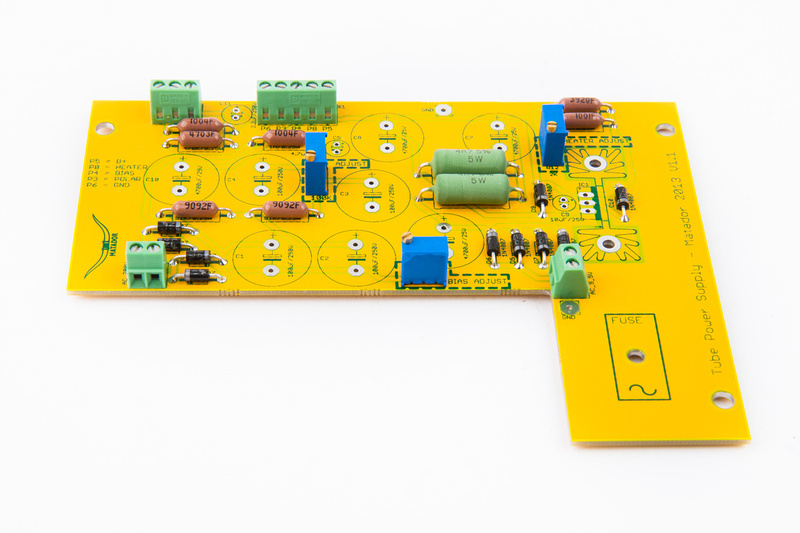 Because the B+ section of our new power supply is completely passive and sitting at 195V unloaded, I know for certain when connected to a load, it will settle at something lower than 195V which should be within the operating range of the stock capsule. 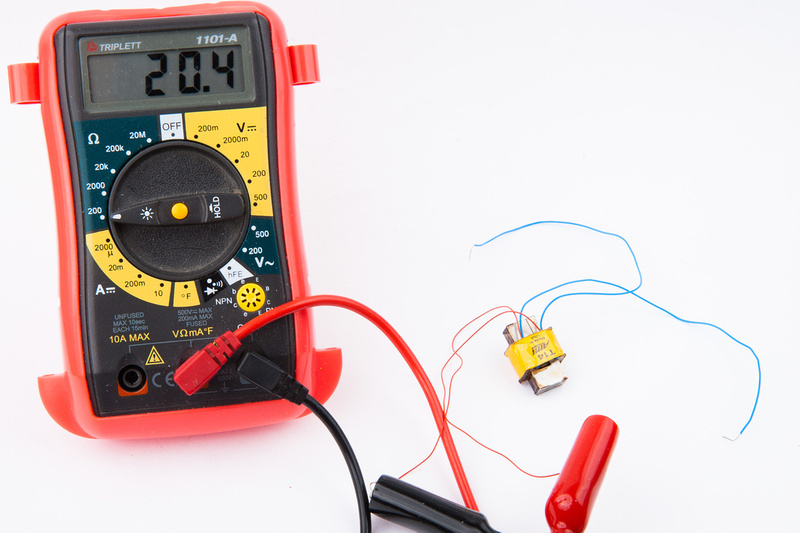 Note here, for the final installation of Tim Campbell's CT12 capsule, the B+ voltage should never exceed 120V. 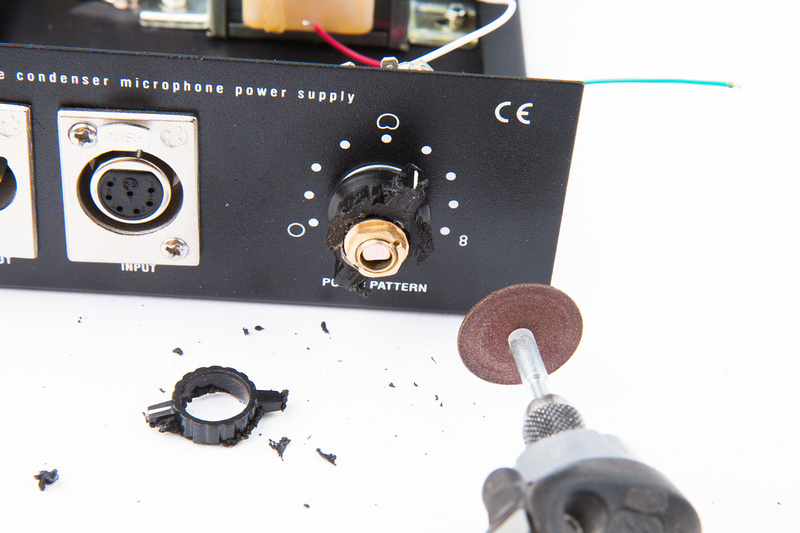 Next, pull the pcb and electronic parts for the microphone preamp. There are really not that many parts in this part of the build, so sorting and locating parts should be pretty straight forward. 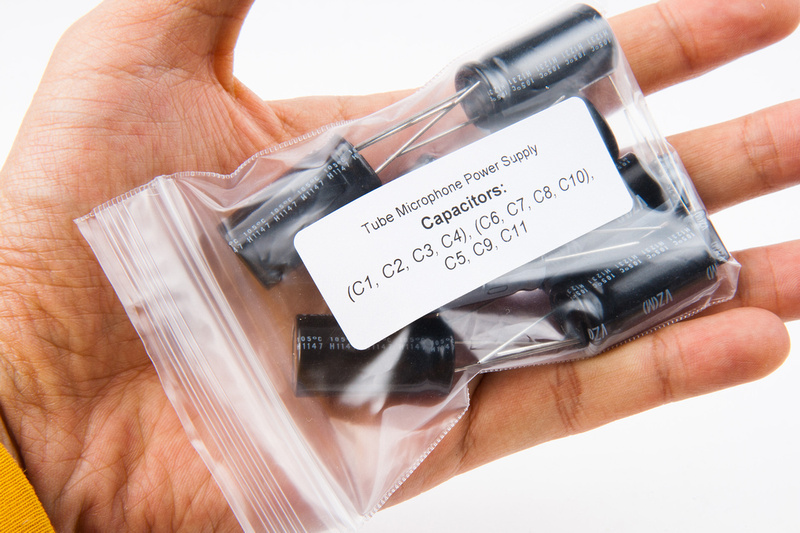 Special Note: For kit builders using the 1uF capacitor option. 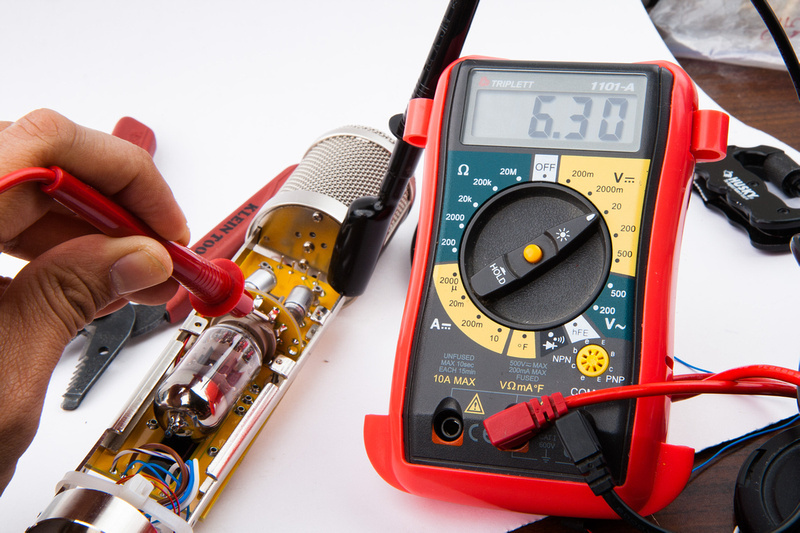 The kit supplied .56uF original value capacitor does not need any modification to fit. 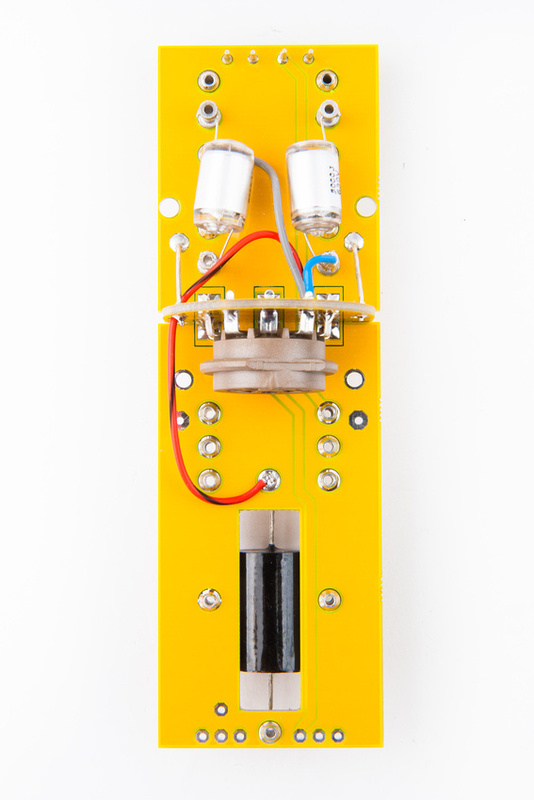 Erse changed the specs on this particular 1uF capacitor that is supplied in kits ordered after 9/6/2013. 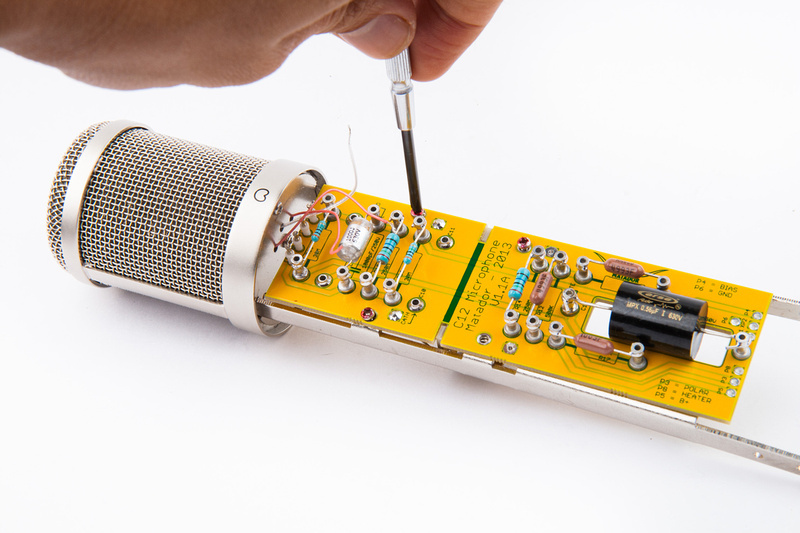 To accommodate the larger diameter capacitor, file the relief slot in the microphone pcb at a 45 degree angle to allow the capacitor to sit slightly lower towards the center of the microphone. The relief cut looks like this when finished. 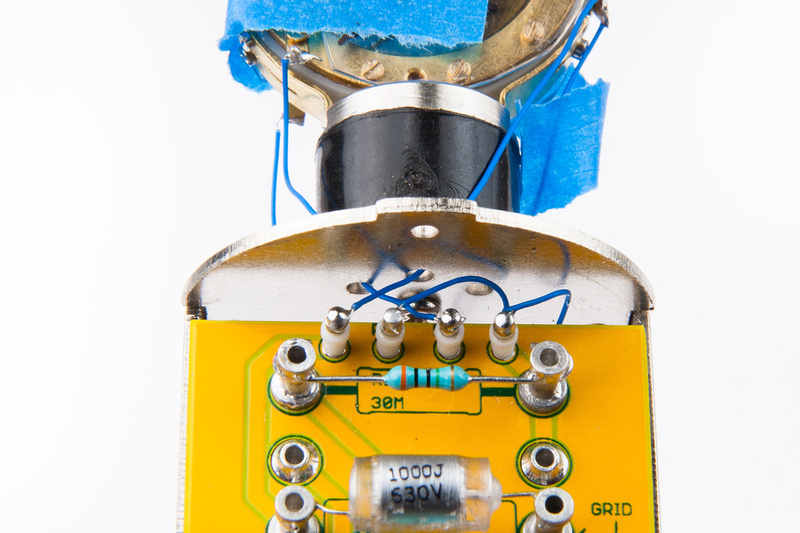 The final fit for the capacitor does not leave much wiggle room, but this maximum dimension capacitor fits. 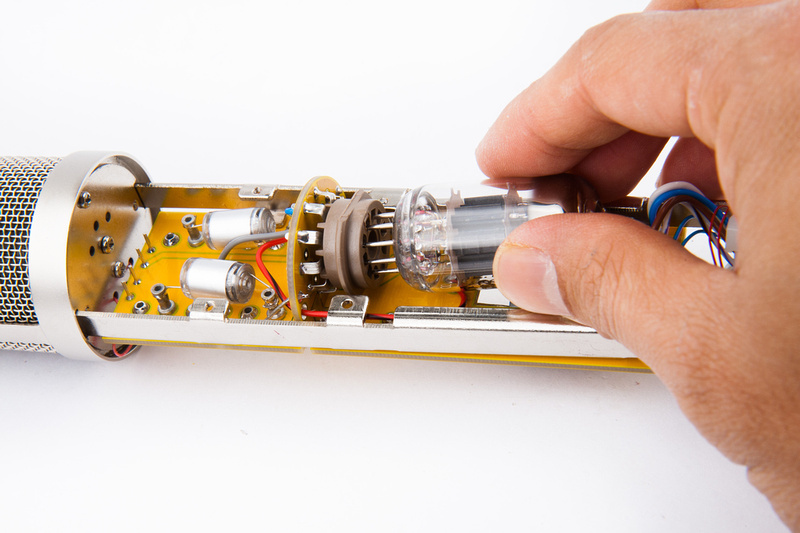 Be careful soldering around the R17 turrets and they are very close to the capacitor. 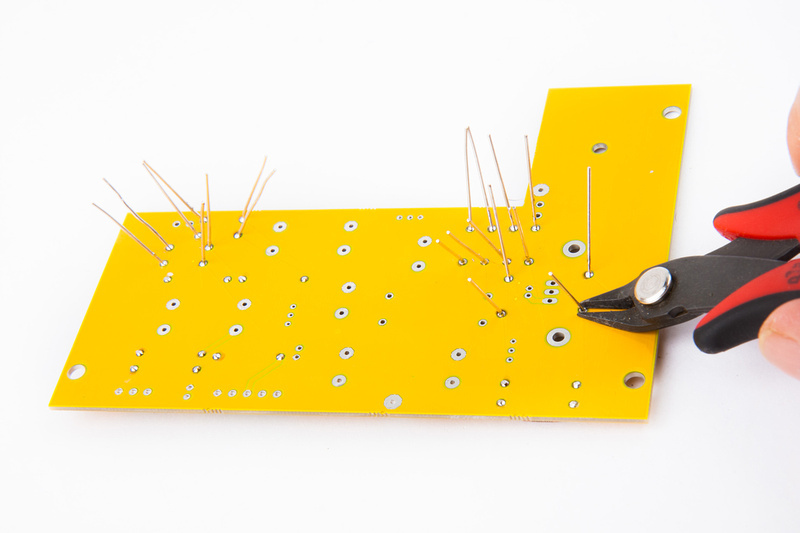 Pull the turrets first to prep the board for mounting the components. 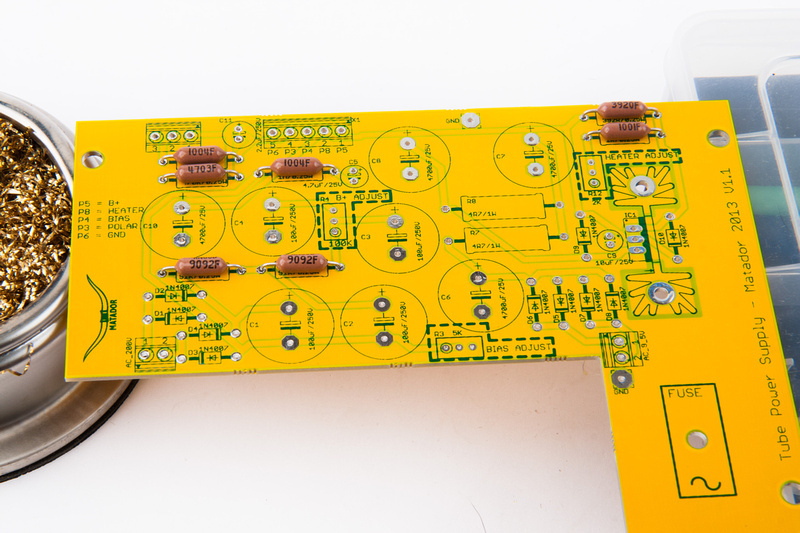 4 turrets are mounted on the back side of the pcb to accomodate capacitors. 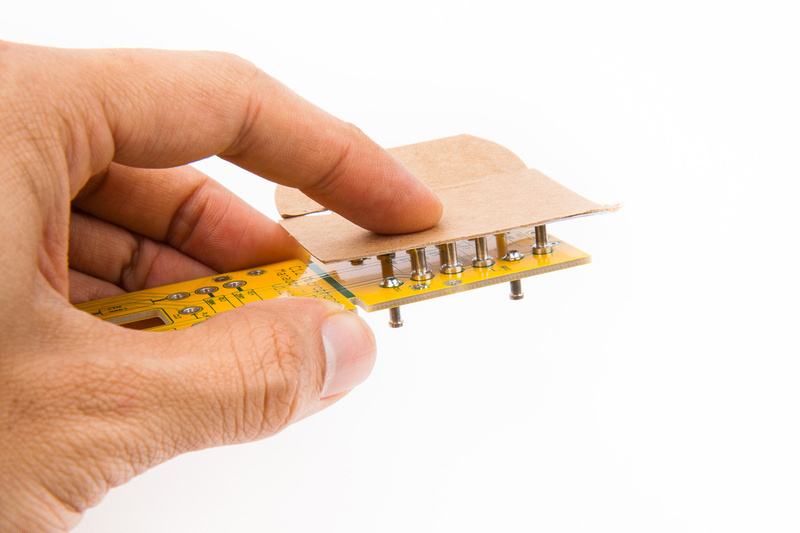 I use a piece of cardboard to hold the turrets in place and flip the whole assembly to solder from the back side. 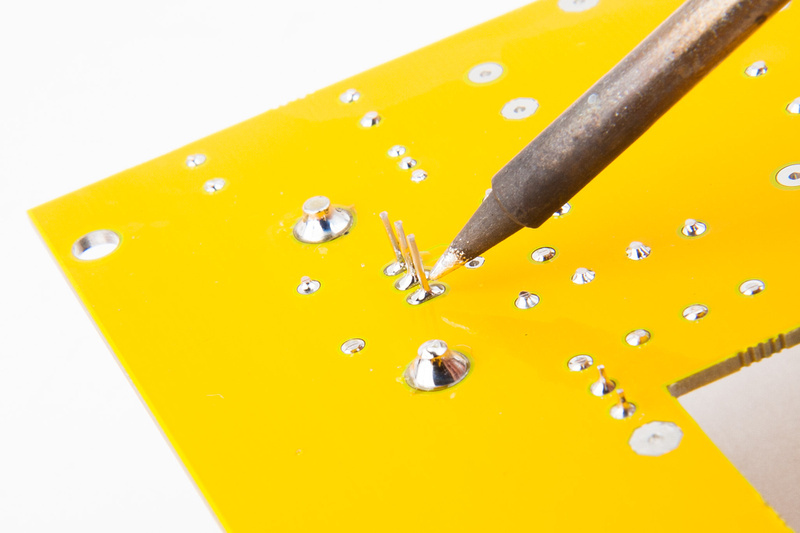 Press firmly down on the pcb while soldering the turrets to make sure they stand up straight and seat flush to the pcb. 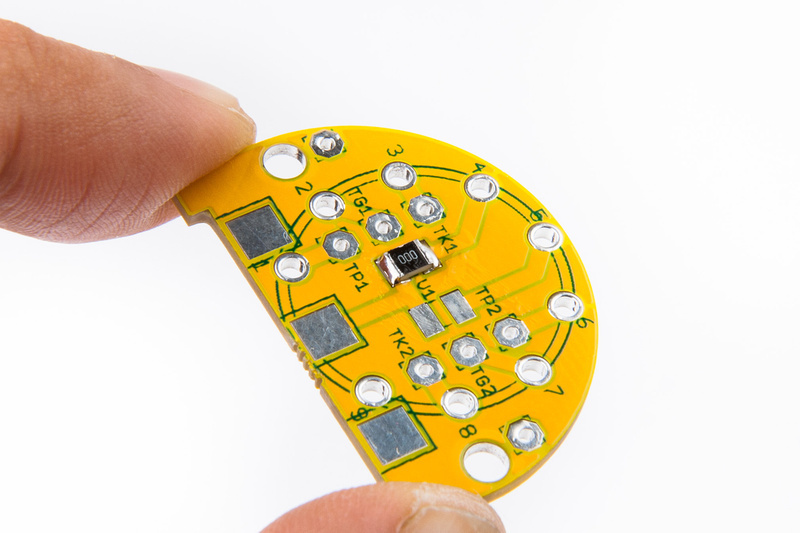 And here are the 4 turrets that mount on the back side of the pcb soldered in. Next, begin installing the front side turrets in the same manner. Because the tube mounts to the back side of the pcb, to improve clearance, modify this turret for the C12 capacitor before installing. Using a cutoff wheel on the dremel, cut a notch into the bottom of the turret. A wire will fit into this notch and allow the tube to have a little bit more clearance over the top of this turret. 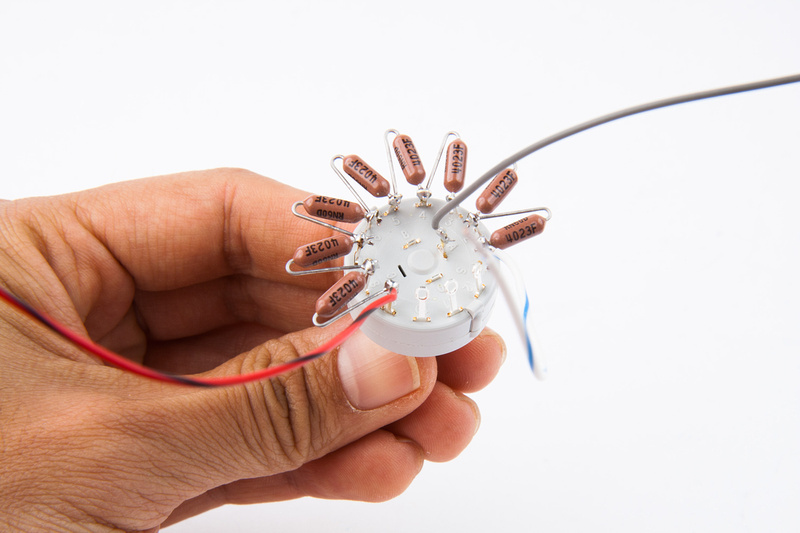 Next, install the 4 capsule connection pins to the pcb. 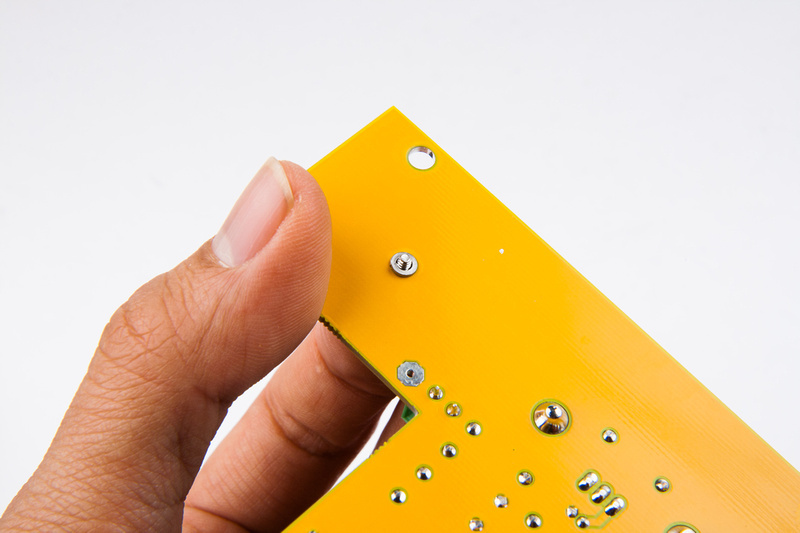 In this build, we solder these in from the back side. Connect a length of wire to the bottom of the turret labeled "grid". I select a gray wire. At this stage, it is a perfect time to scrub the board down with some 90% isopropyl alcohol to clean off flux residue. 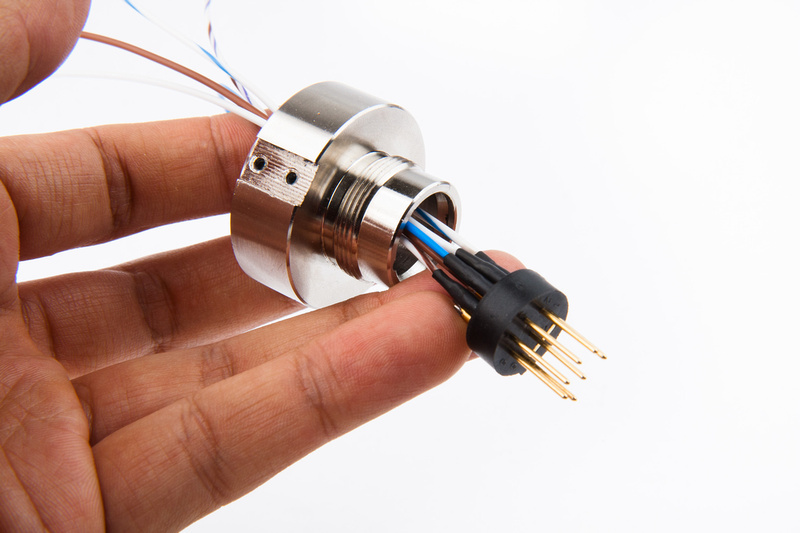 If there is a part that is most important to clean, it is at the base of these turret connections and around the tube pcb that we will install next. This is a non-optional step. 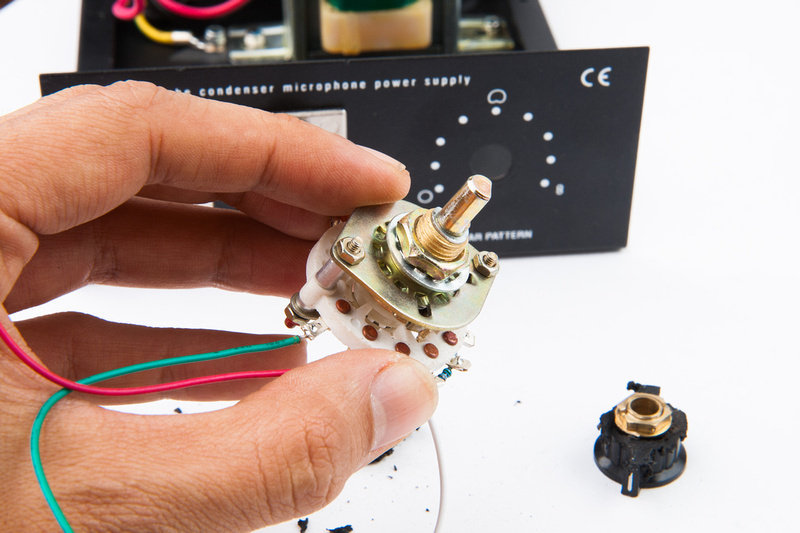 Unlike the power supply, the high impedance sections of the microphone pcb need to be kept impeccably clean in order to avoid any leaks that could lead to noise and other problems. 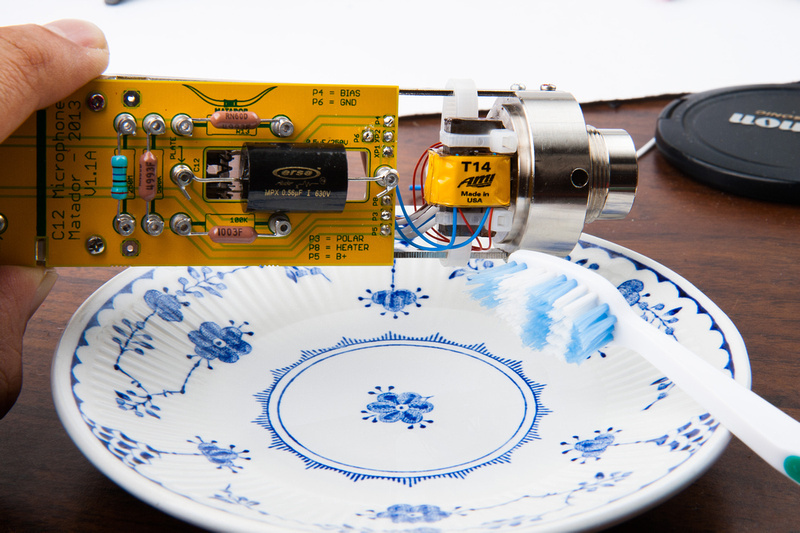 Liberally dunk the assembly into the alcohol and use a brush to mechanically loosen and dissolve all of the solder flux. 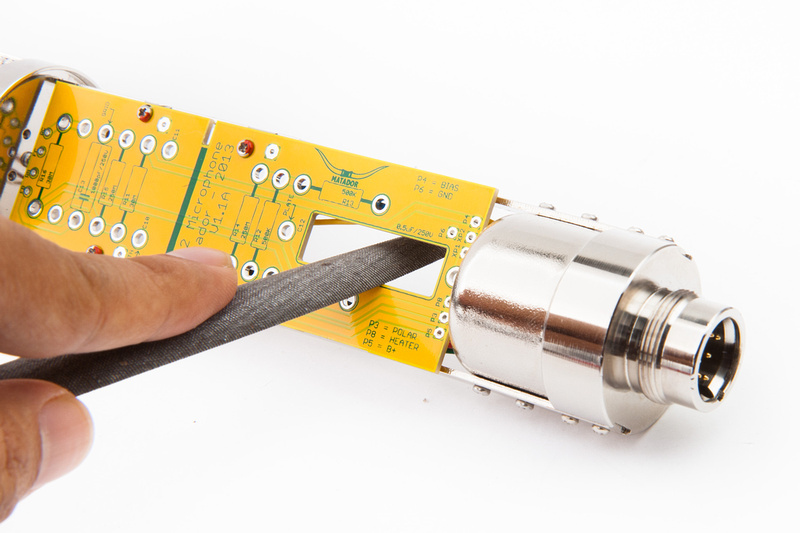 Next, pull the tube-mounting pcb. 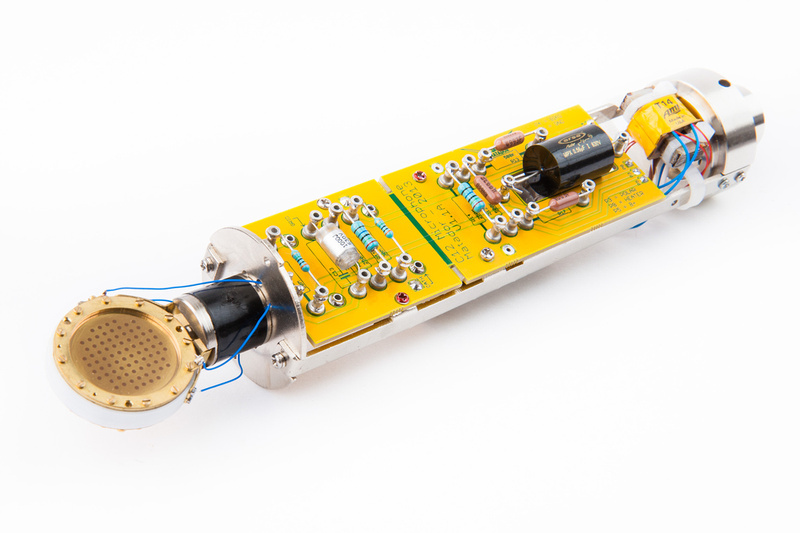 Important note: The plate follower topology of this microphone circuit only uses one half of the tube. We can choose to use either the left side "TK1, TG1, TP1" or the right side "TK2, TG2, TP2". 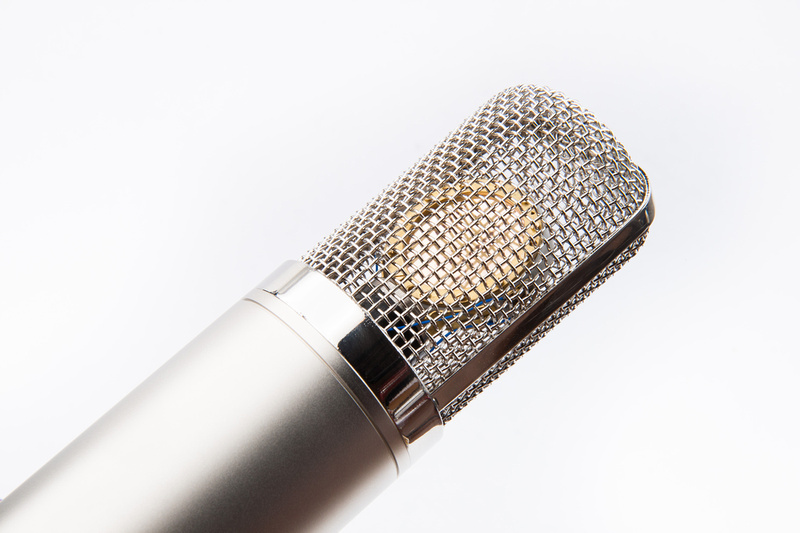 If using expensive and increasingly rare NOS tubes and building more than one microphone, I strongly recommend wiring the microphones to utilize opposite sides of the tube. 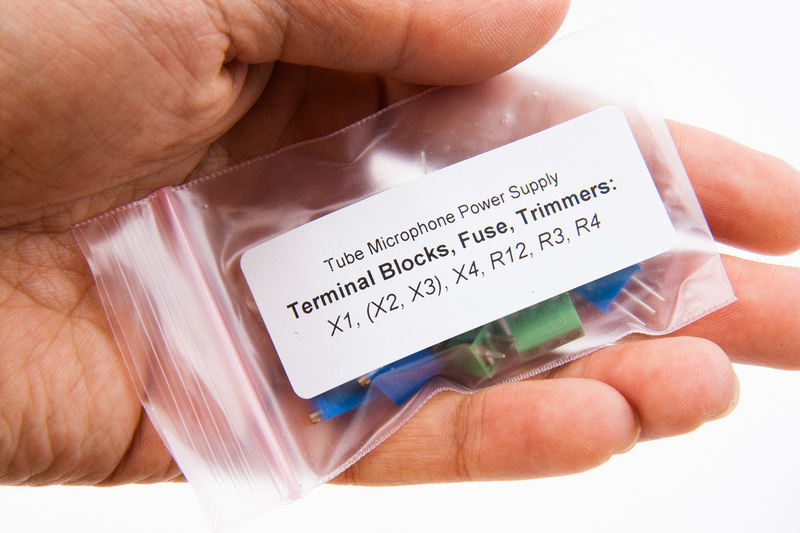 This way, the tubes can be switched between the microphones and the service life of the tubes doubled or at least significantly increased. 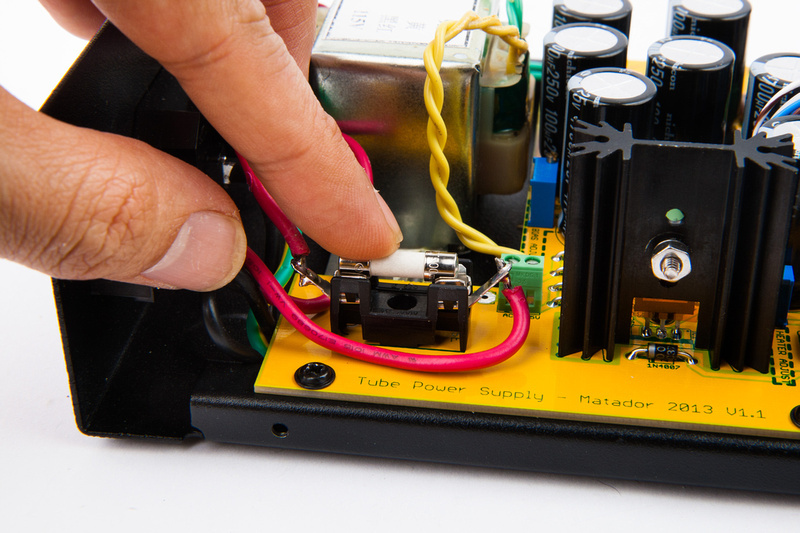 We will need to mount a SMD zero ohm resistor to connect the heater voltage to whichever side of the tube you choose to utilize. I will use the left side "TK1, TG1, TP1" for this build. 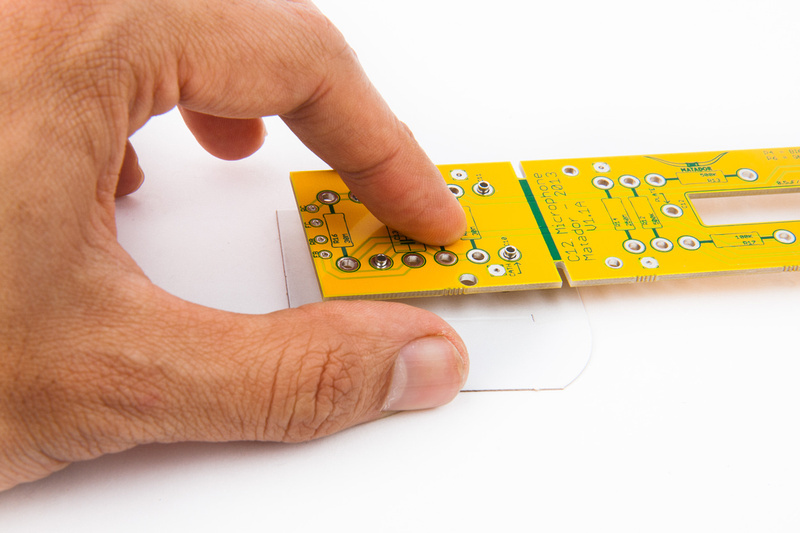 To mount the SMD zero ohm resistor, first apply some flux to the pads. These come in different forms. I use a paste because that is what i have in my toolbox. 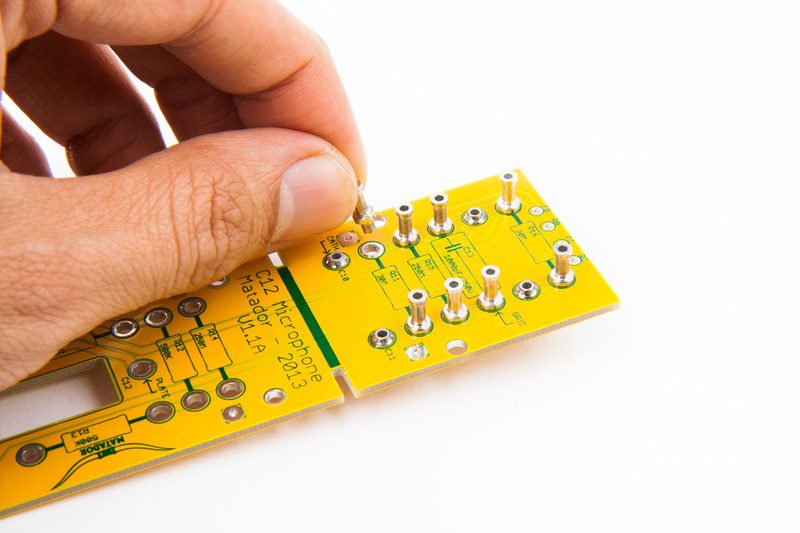 Apply a small amount of solder to one of the pads. 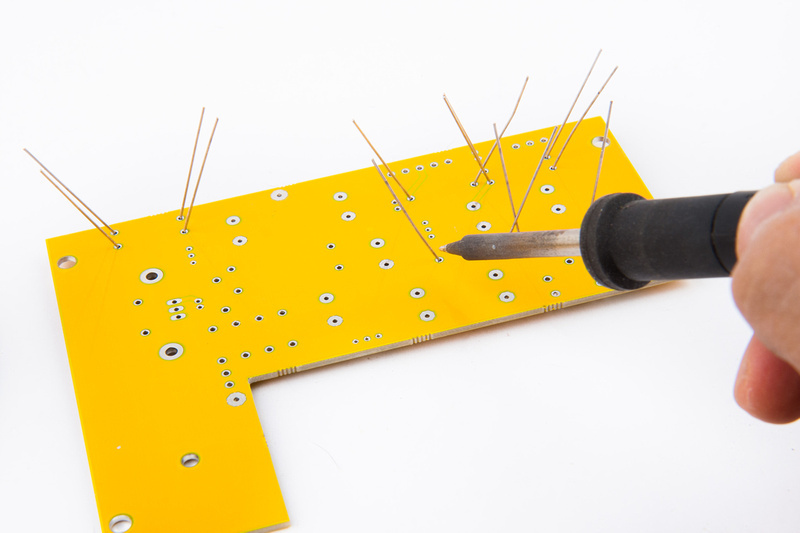 Next, re-apply flux to the pad and use tweezers or in my case some small needle nose pliers to position the resistor while re-melting the solder that was previously pre-applied to the board. 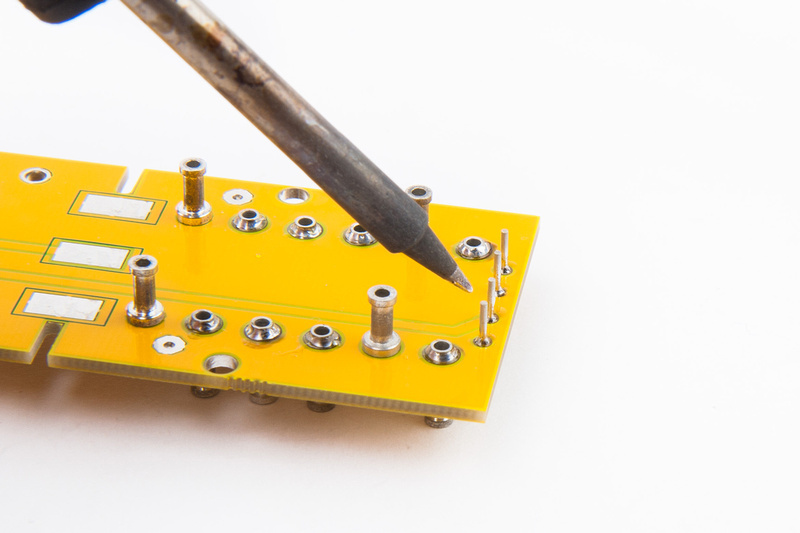 Once satisfied with the position of the component, solder the opposite side as normal. 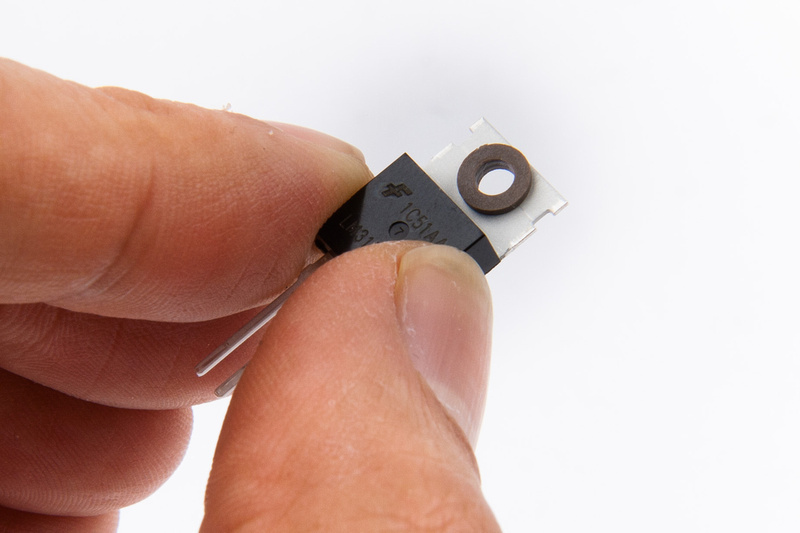 Don't tell anyone, but that was my very first SMD component. . . not as difficult as some make it out to be. Next, install the tube socket. We will need a tube we do not care about at all to loosen up the sockets because they are very stiff when new. 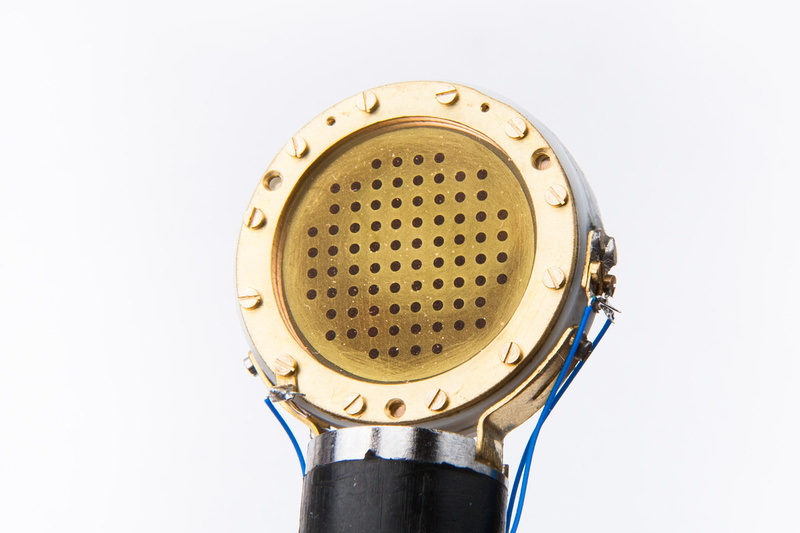 A good candidate is the stock tube inside the HT-11A donor microphone. 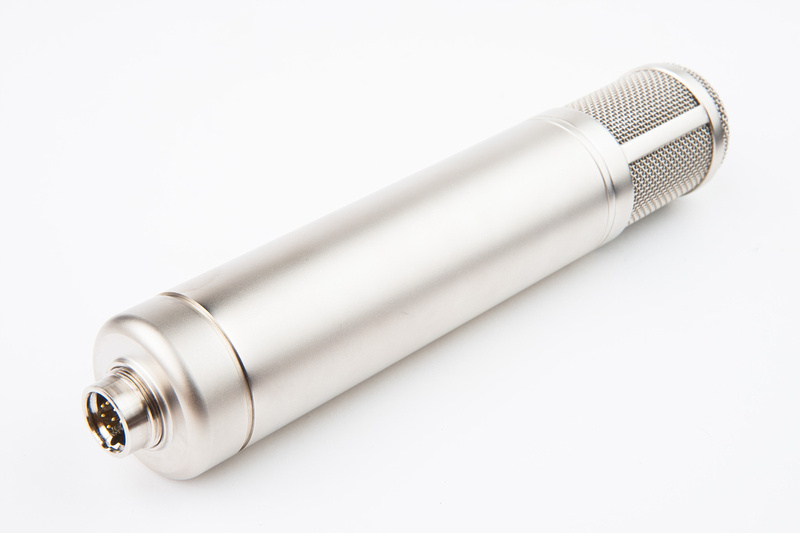 The bottom portion of the spring-loaded tube shock support easily compresses and kicks out the side of the microphone frame. 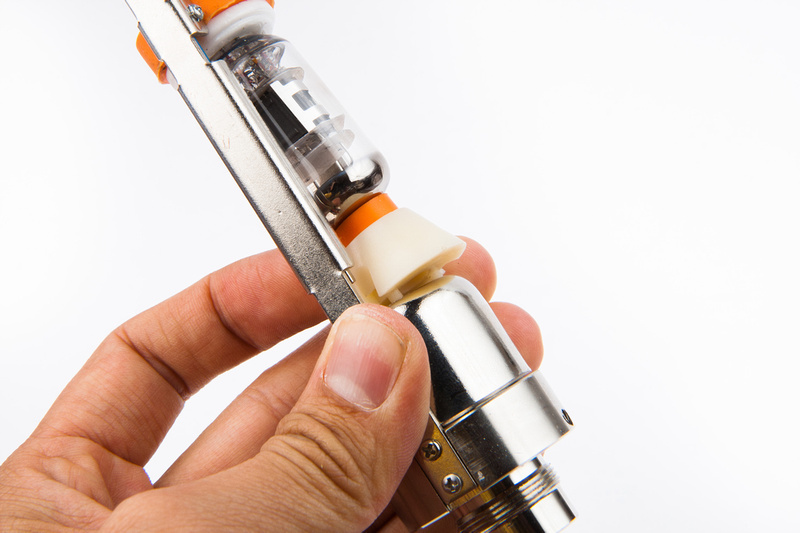 Once the lower support is out of the way, the tube can be easily removed. 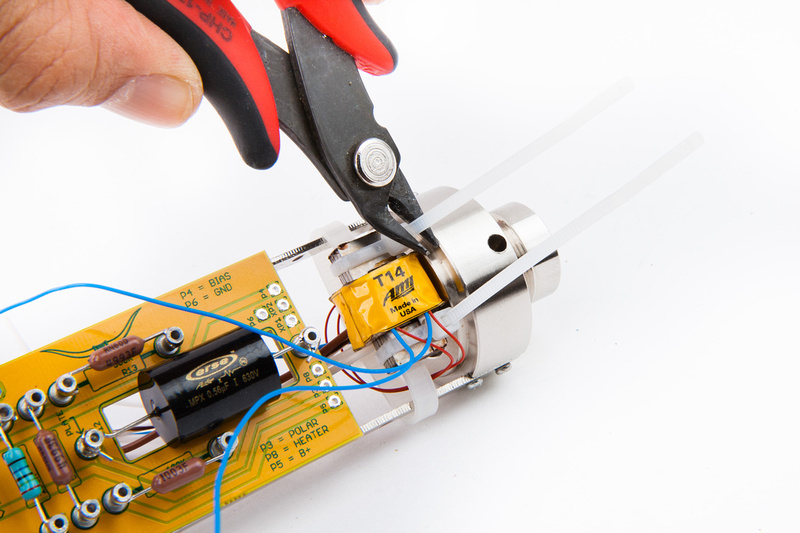 I use a pen to gently loosen up the tube sockets because I could not insert the tube into the socket otherwise without risking bending the solder leads. Do not loosen them too much. 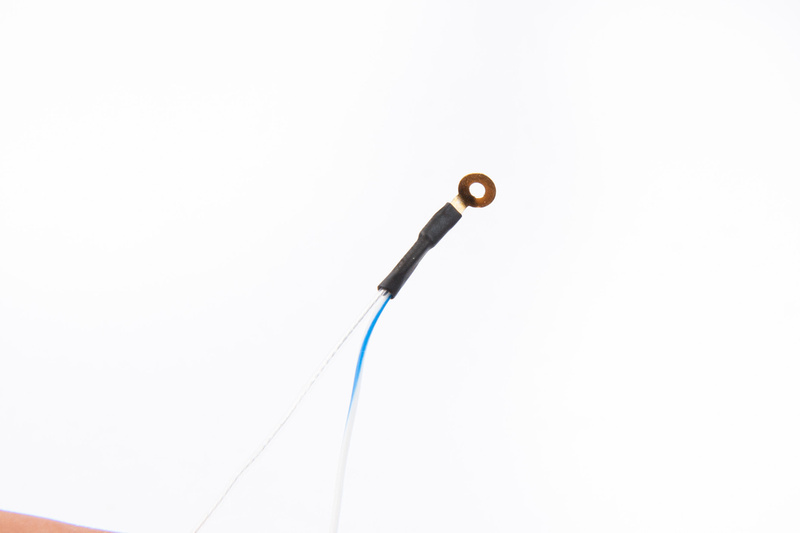 Just enough to allow insertion and removal of the tube but retain a solid grip and contact. And test fit the beater tube to the socket. Next, I dunk and scrub the pcb in alcohol. 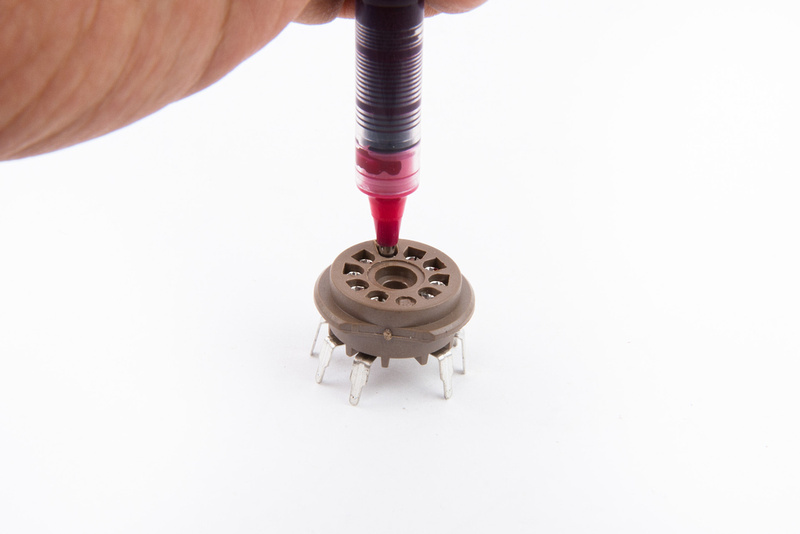 If you pen leaked all over the tube socket like mine did, it wouldn't be a bad idea to clean that also in alcohol before fitting to the pcb. 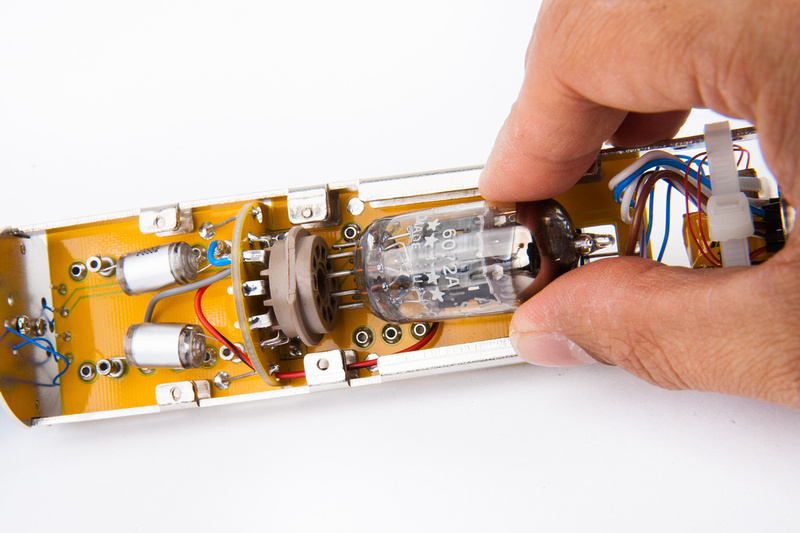 Next, solder the tube socket into position. And clean the flux off. These connections are very important to keep clean. 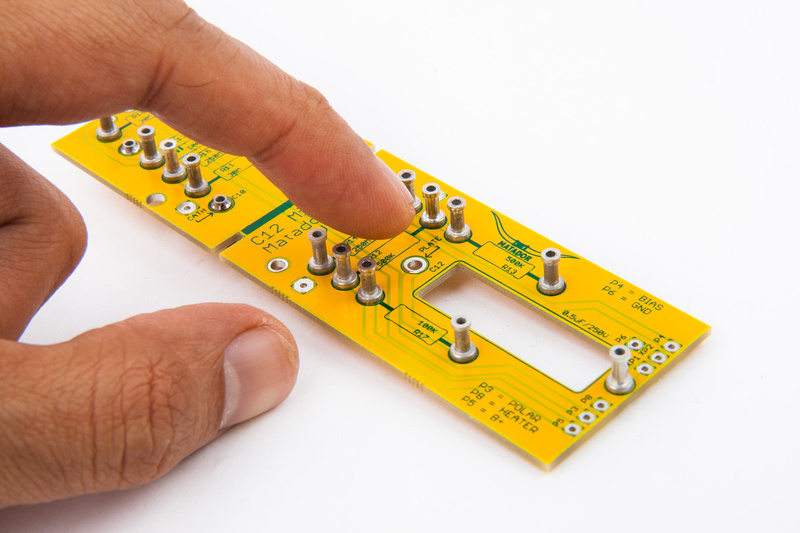 Align the 2 pcb's and solder one tab. 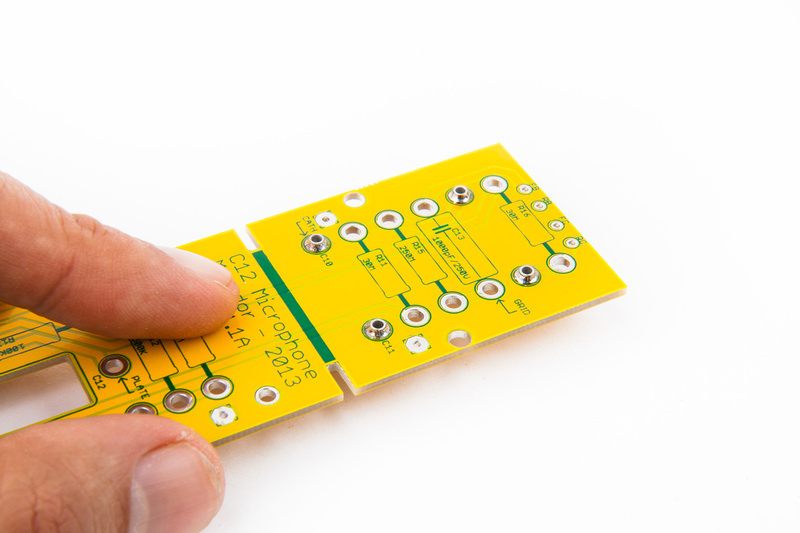 Using a straight edge as a guide, re-heat the pad and align the 2 pcb's to perfectly perpendicular. Once satisfied with the alignment, solder the remaining accessible tabs. 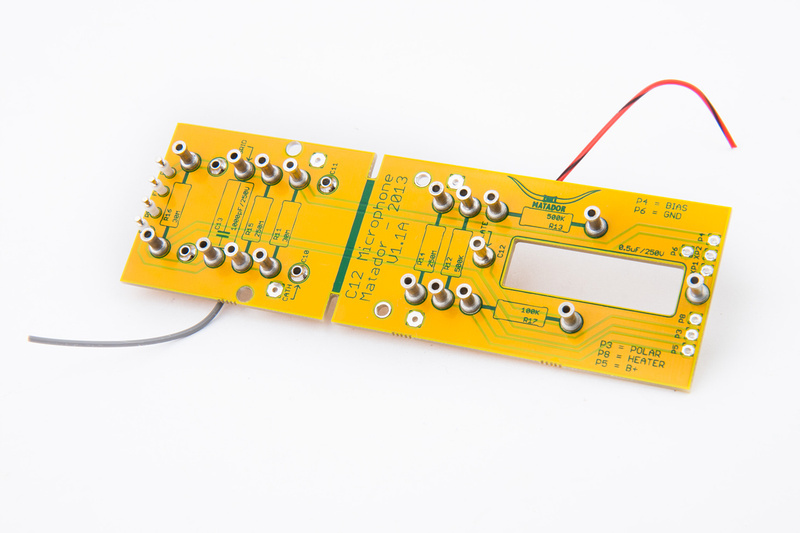 At this point, attach the previously attached red wire to the plate pad on the pcb marked TP1 (or alternately if building the left-side of the tube TP2). 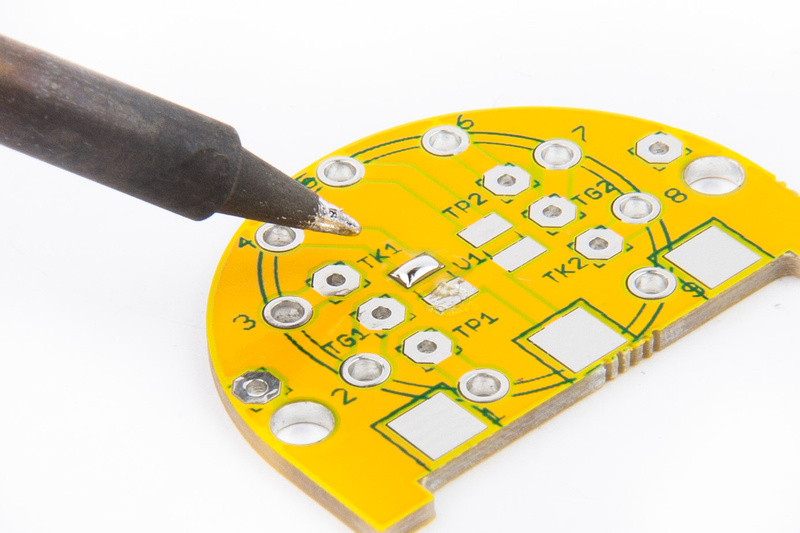 And connect the gray grid wire to the "TG1" pad and install a new wire from the turret indicated for cathode to "TK1"
Next, clean the pcb of solder flux. 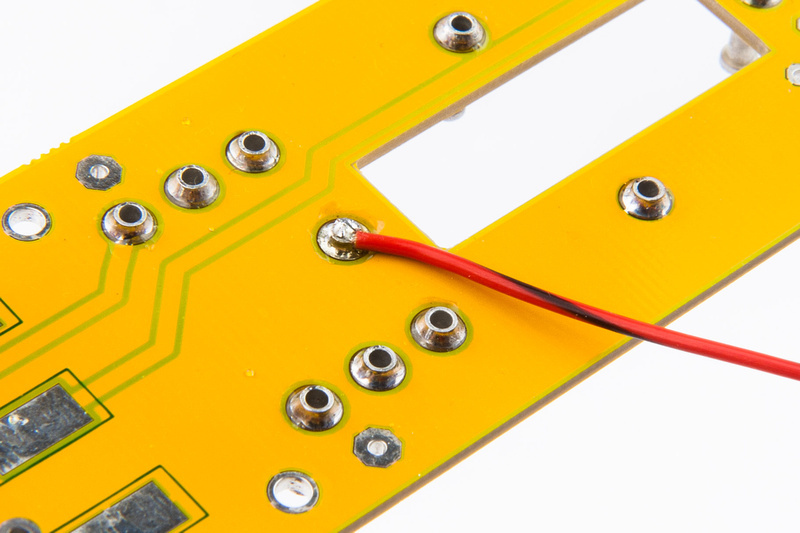 The pcb has provisions for triangulating support braces for the tube pcb. 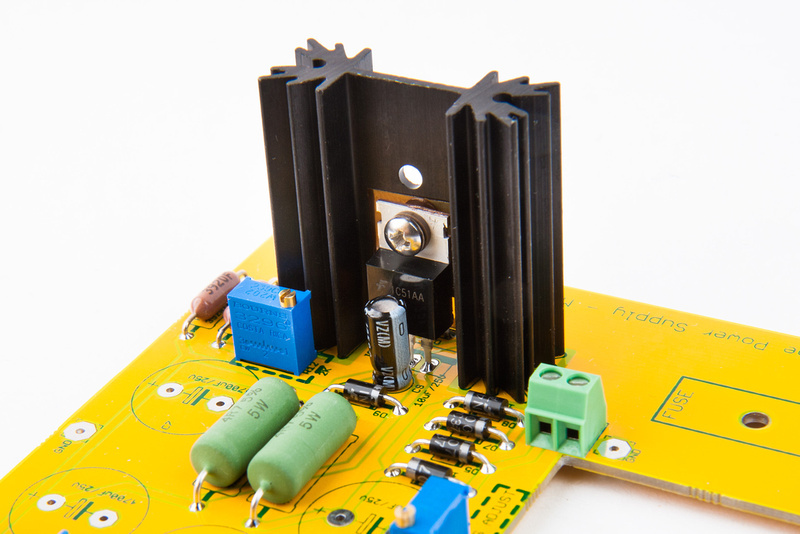 Wire lead cutoffs from the large psu capacitors can be used to create these supports. 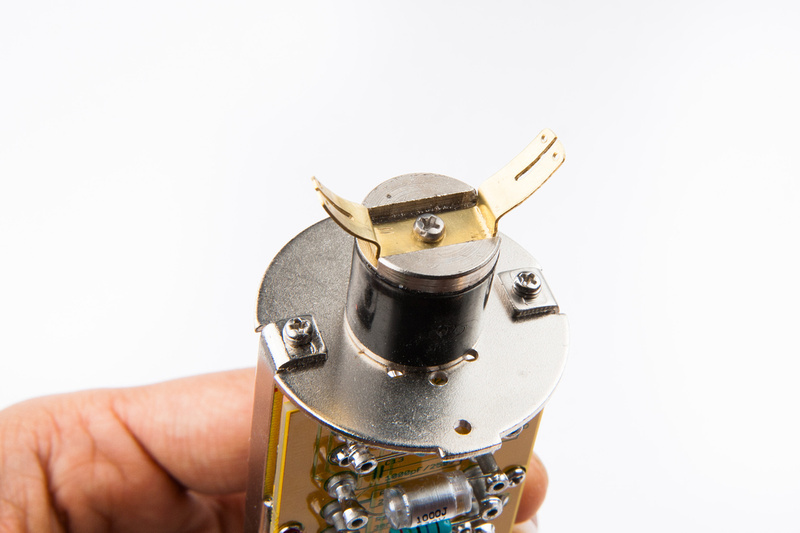 And all turrets are installed at this point and we are ready to populate the pcb with electronic components. 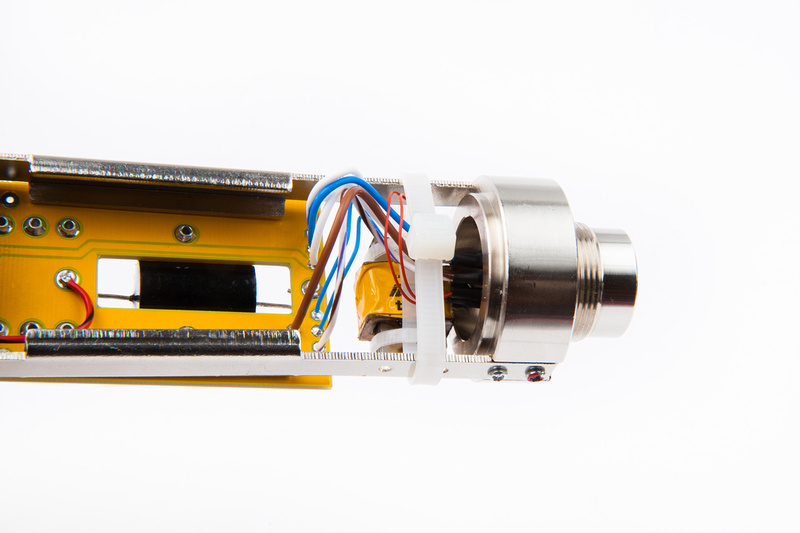 There are many ways to attach components to turrets. I choose to wrap the components around the side of the turret. They can also be inserted directly into the top holes. If wrapping around, mil-spec is to use half of a turn at each connection. Populate the resistors first. 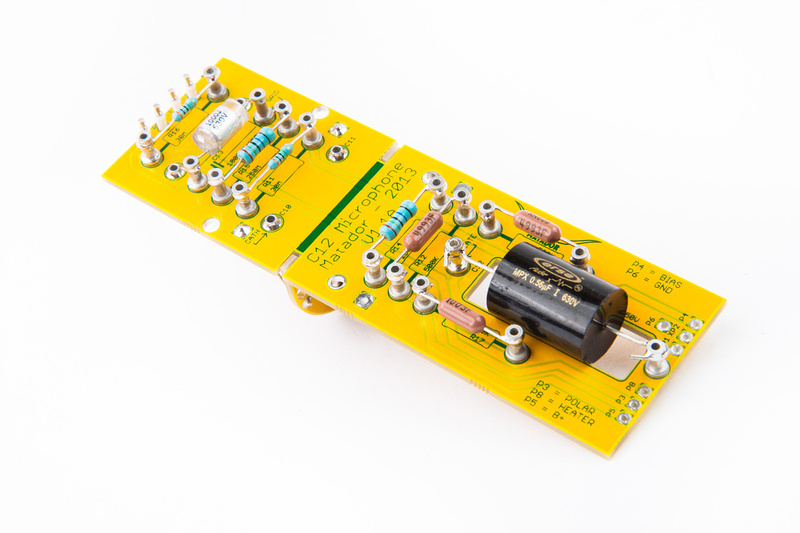 For builders who wish to use the 12AT7 tube in their build instead of the original 6072A tube, a 47K resistor should be substituted in the R17 position. Be careful with the temperature setting on the iron and the length of time heat is applied to the turret. 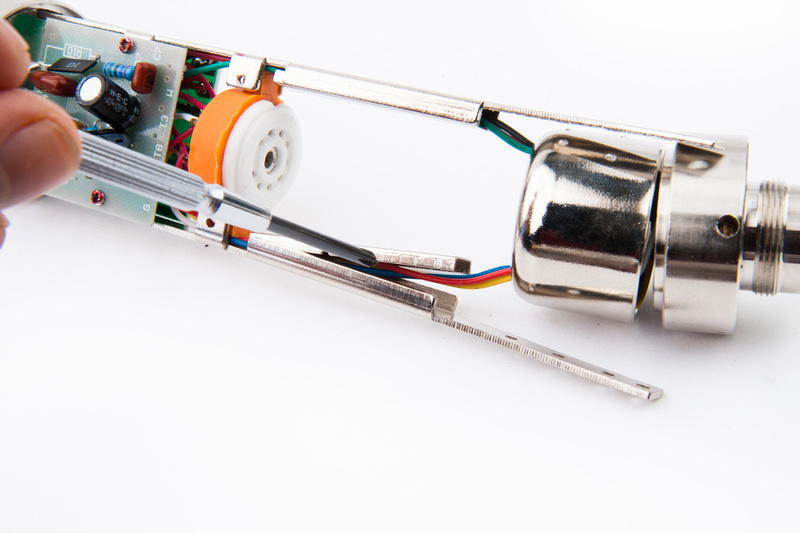 If left on too long, the turrets can come pull away from the pcb and it is a drag re-setting them into the pcb. And resistors are in place. 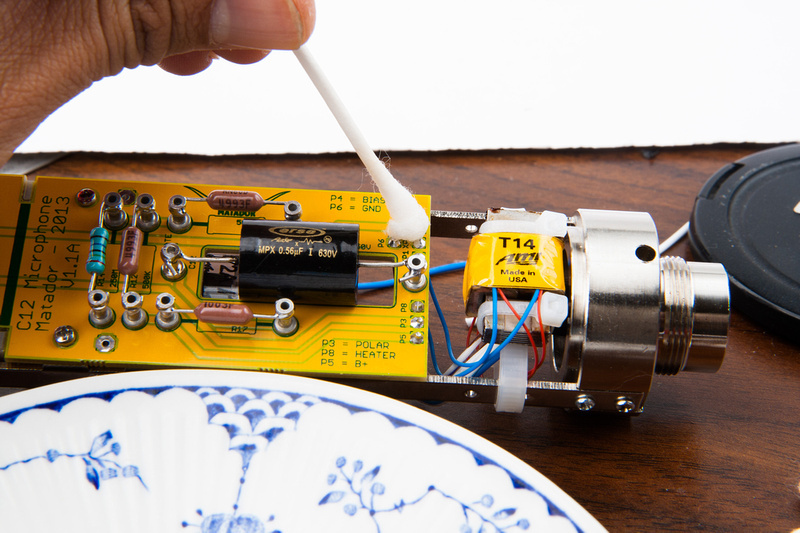 While it is not completely necessary to clean these connections, this is the last chance to really dunk and scrub the board because the capacitors do not like exposure to isopropyl alcohol. Next, I install the output capacitor. Note the configuration of the wire leads. I wanted to make a 100% solid connection while retaining the ability to swap this capacitor easily if I decide to move up from the original .5uF specification to a 1uF cap. I leave enough lead to pull on with needle nose pliers. 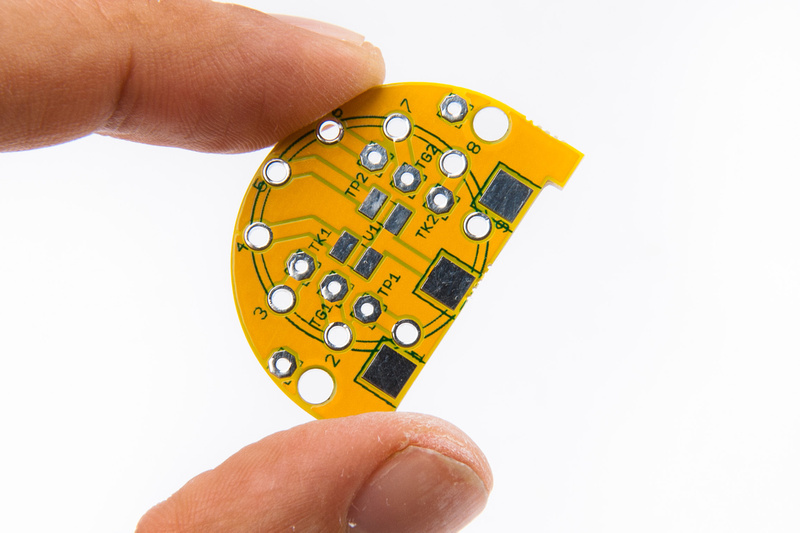 Next, the 5000pf caps are installed on the back side of the pcb. 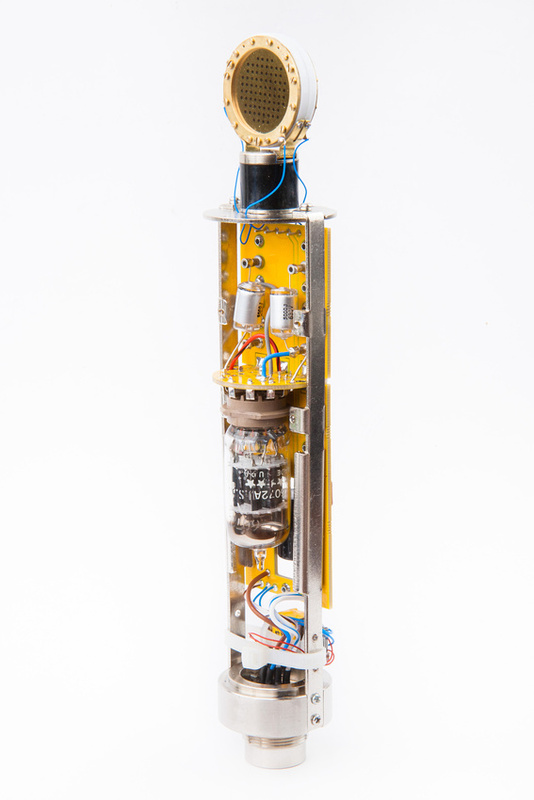 And the 1000pf capacitor on the front side. 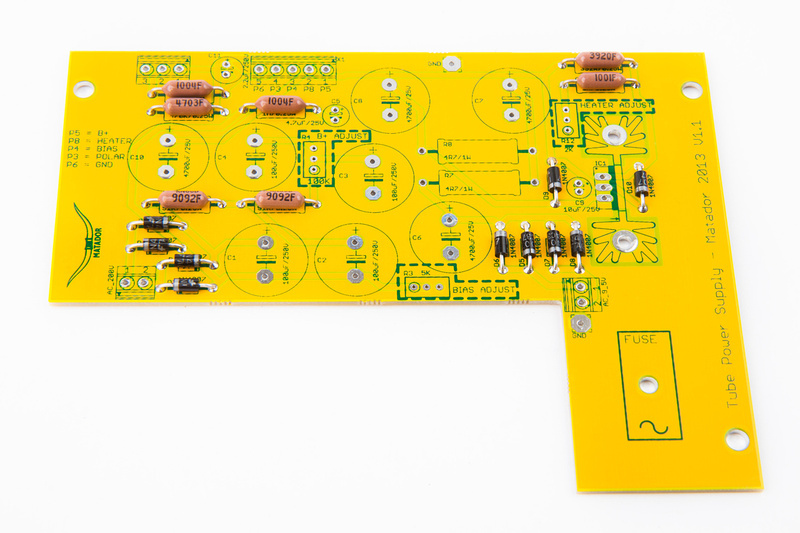 The mic preamp board is now fully populated. 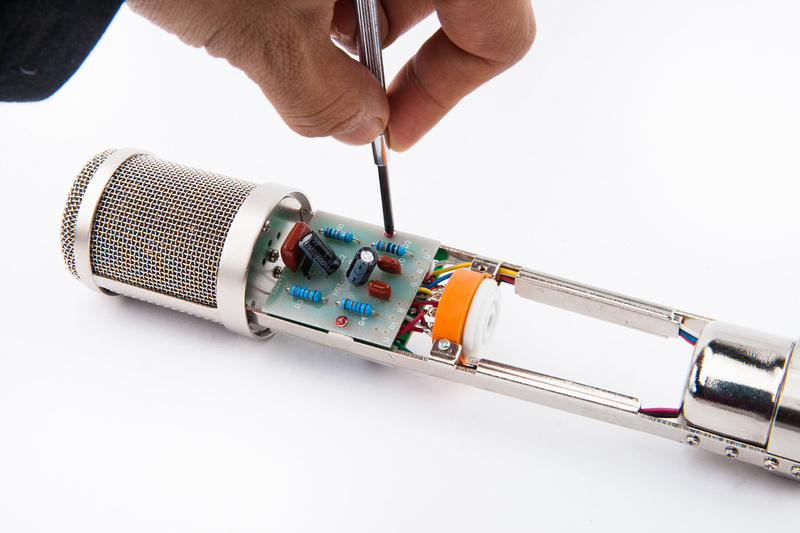 Next, with the preamp pcb assembled, strip the stock HT-11A microphone to prep for installation. 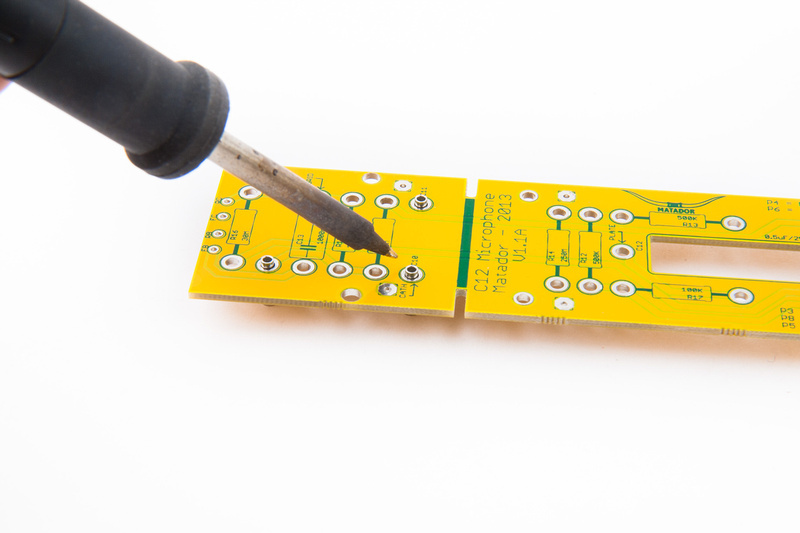 First unscrew the stock pcb's. 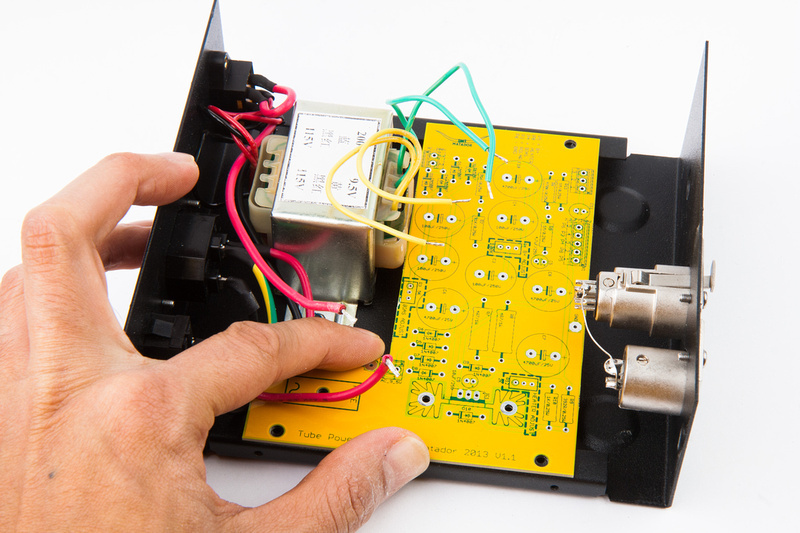 Remove the screws holding the base plate and transformer housing. 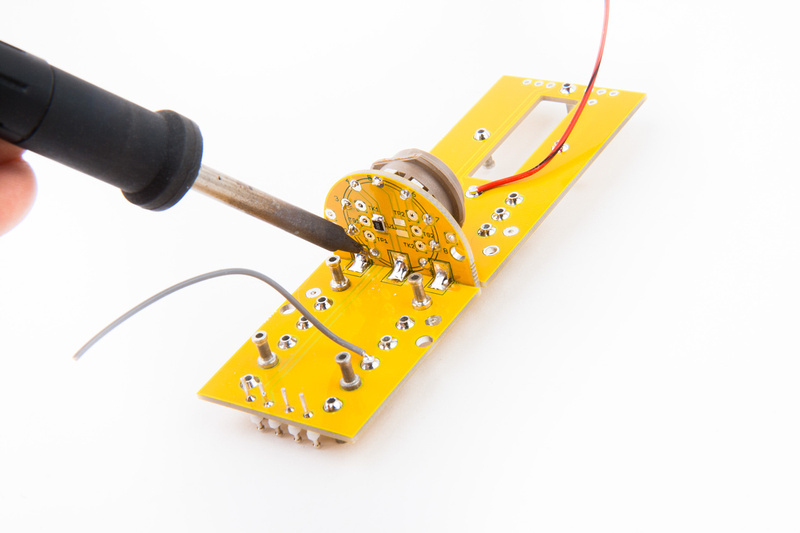 . . the metal plates that secure the wires are easily pried off with a screwdriver. 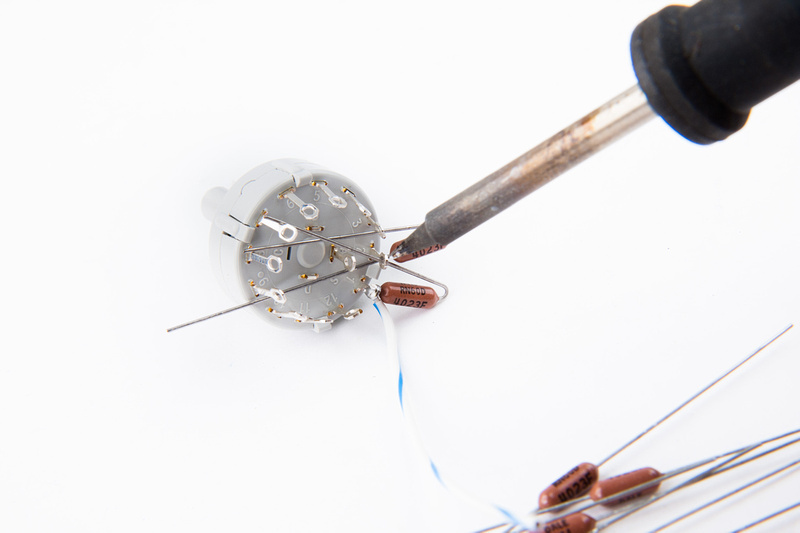 Gently lifting the pcb gives access to the capsule wire solder points. 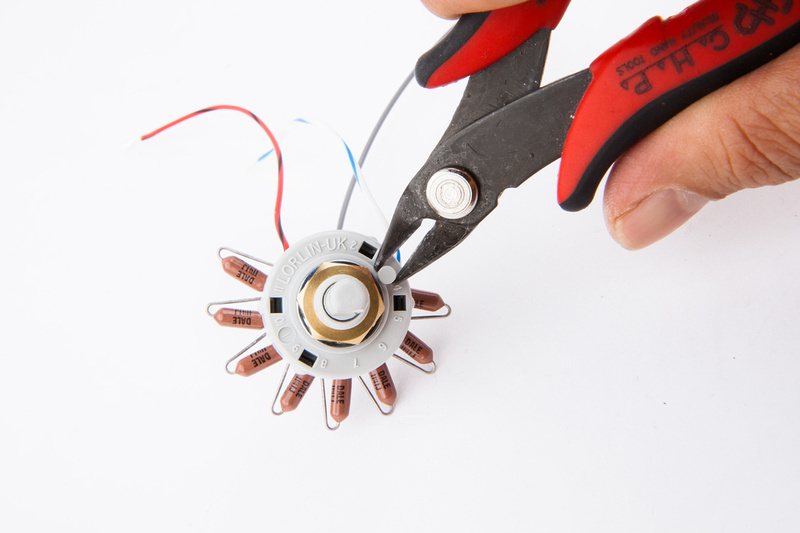 Remove those by unsoldering or cutting year the joint to retain as much of the wire as possible. 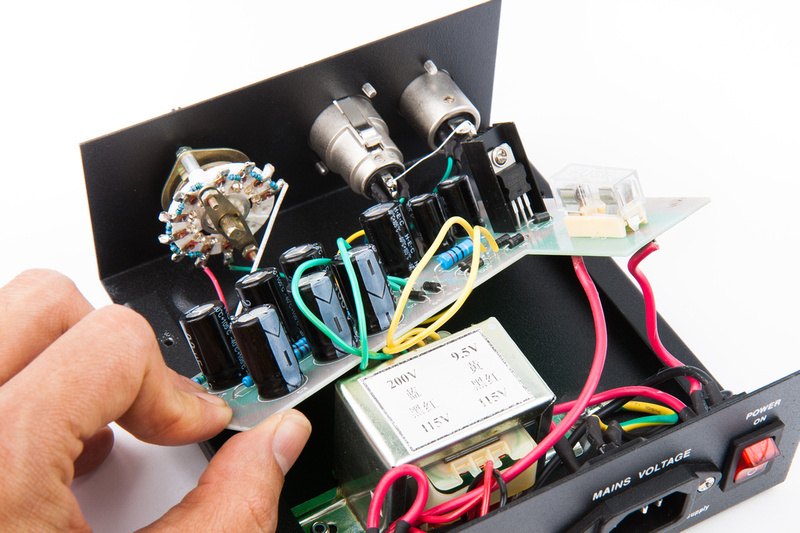 Next, pull the bell-housing clear of the output transformer. 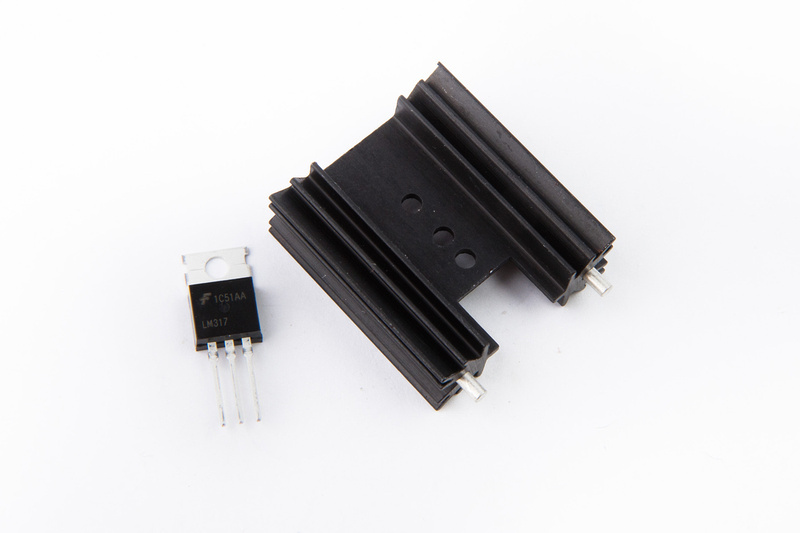 The stock ~5:1 ratio transformer is designed for use in CCDA type cathode follower circuit and is unsuitable for use in the plate follower C12 circuit. 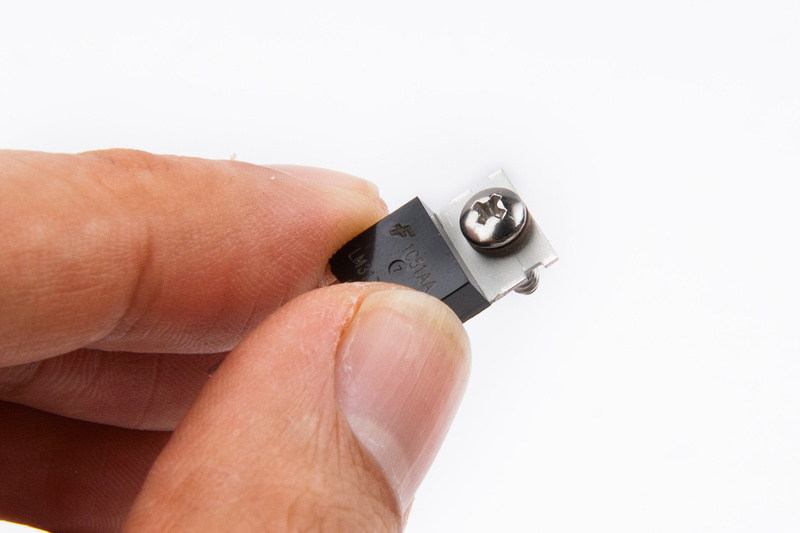 The set screw for the 7 pin XLR connector is located here. 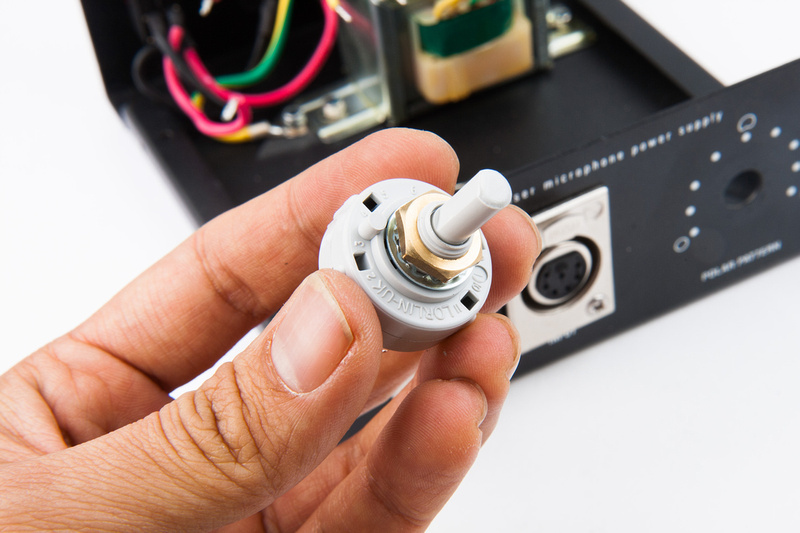 It is a reverse direction mechanism, so to loosen the connector, tighten this screw in all the way. And I opt again to de-solder the XLR connector completely and install new wiring in my microphone. 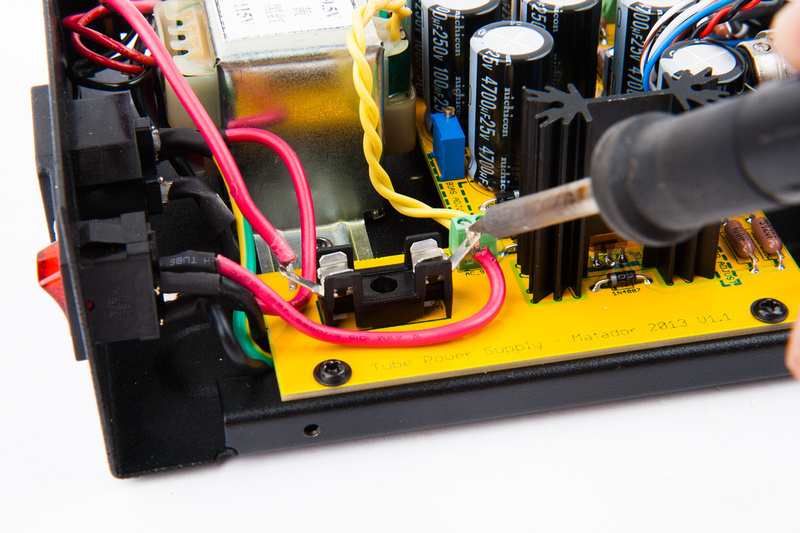 In this instance, the factory original solder joints looked a little bit suspect, so it is not as much of a toss-up as the power supply connector. And new silver teflon wires are attached observing the same color to pin orientation as inside the power supply. 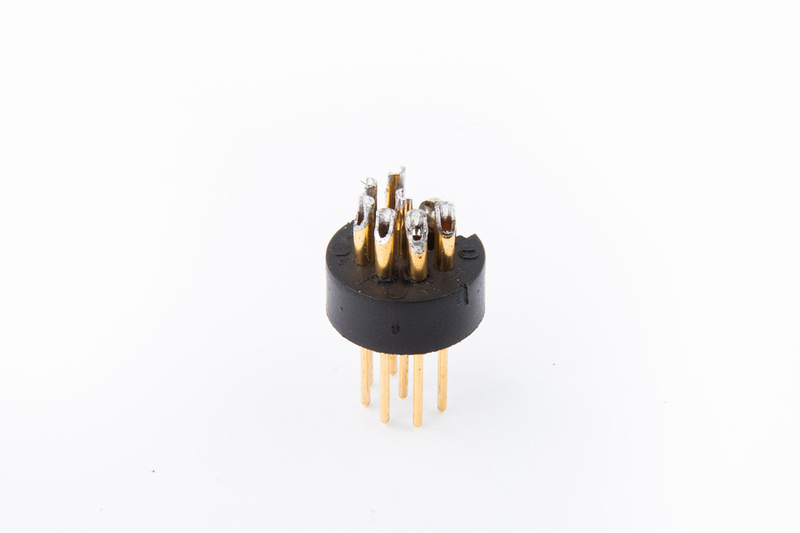 We leave pin 5 and pin 6 open at this time because these connect to the output transformer leads. 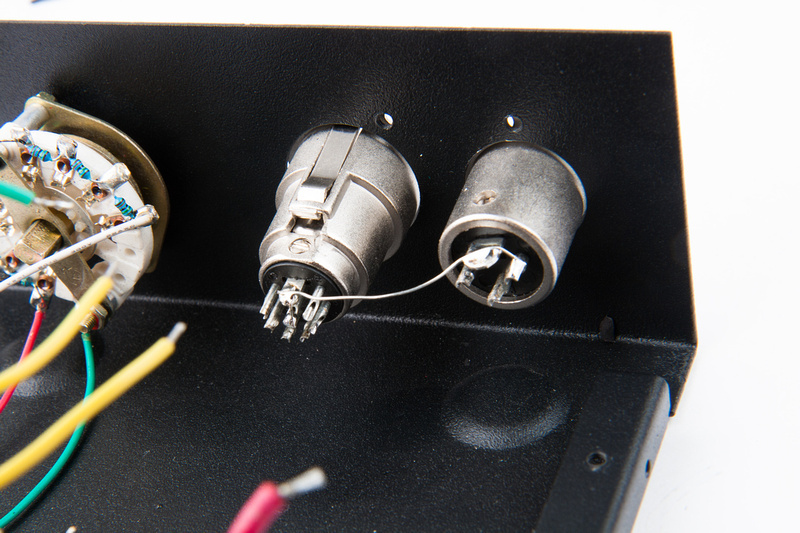 Remember to use shrink tubing at the terminals as these wires can get pushed around quite a bit during installation. 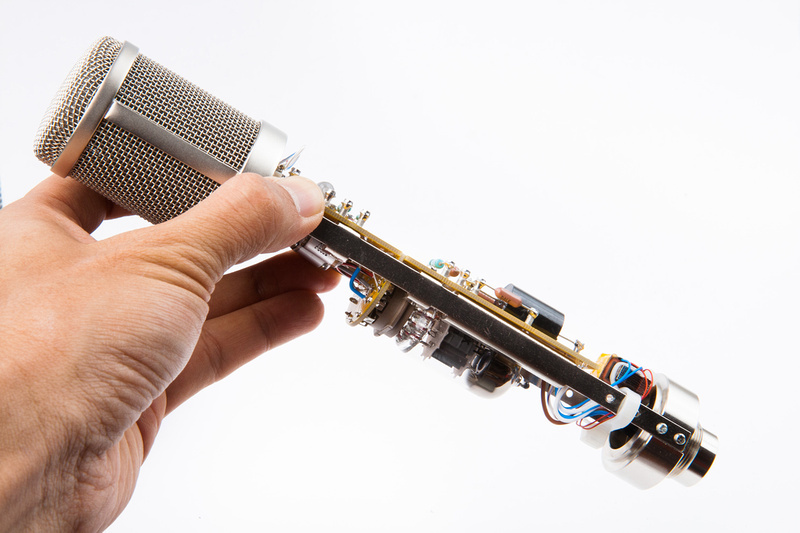 At this point, re-install the newly wired connector back into the microphone base. 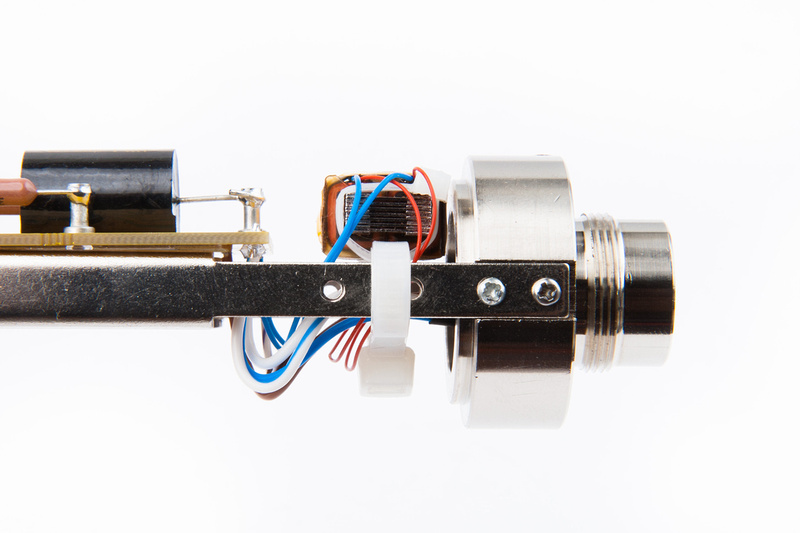 Again, the set screw must be "loosened" all the way to secure the XLR connector into the base. 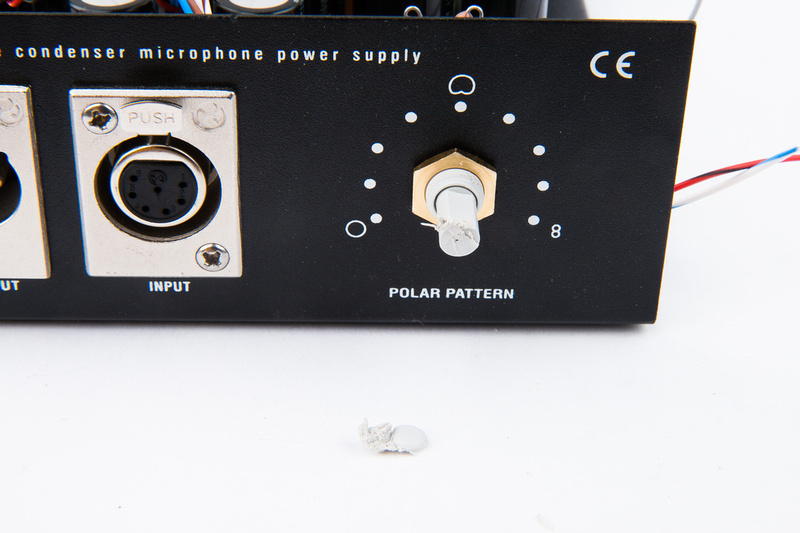 The screw pushes outward against the base making solid contact with the microphone body securing the connector as well as grounding the connector's ground lug to the mic body. 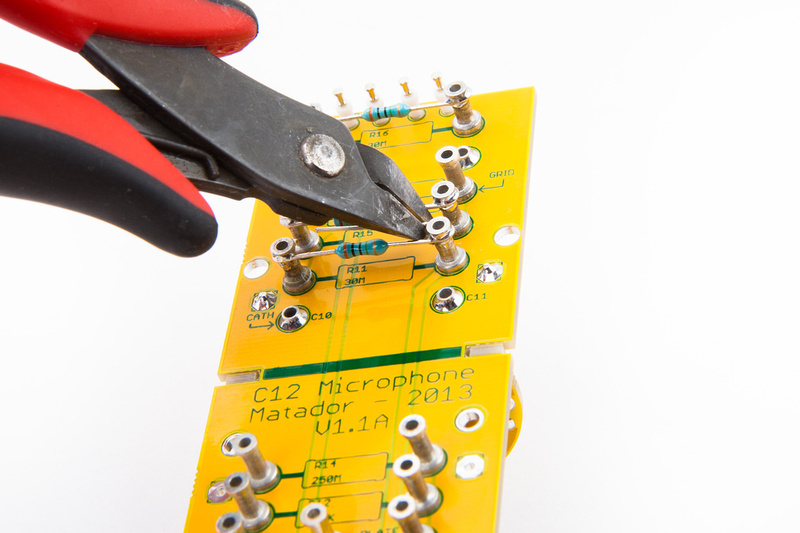 Install the preamp pcb into the microphone body. 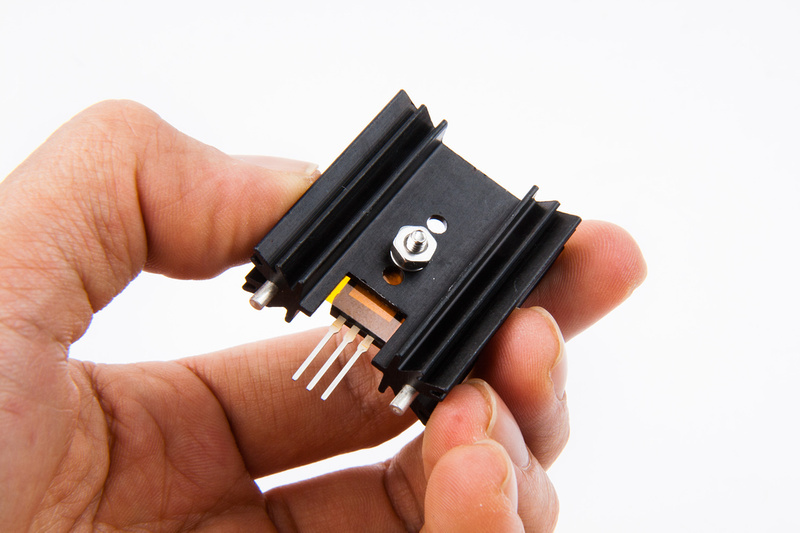 One of the pcb screws will need to be switched to a 12mm long M2 screw which is included in the kit as the frame rail has a through hole in that location to accomodate the stock tube socket. 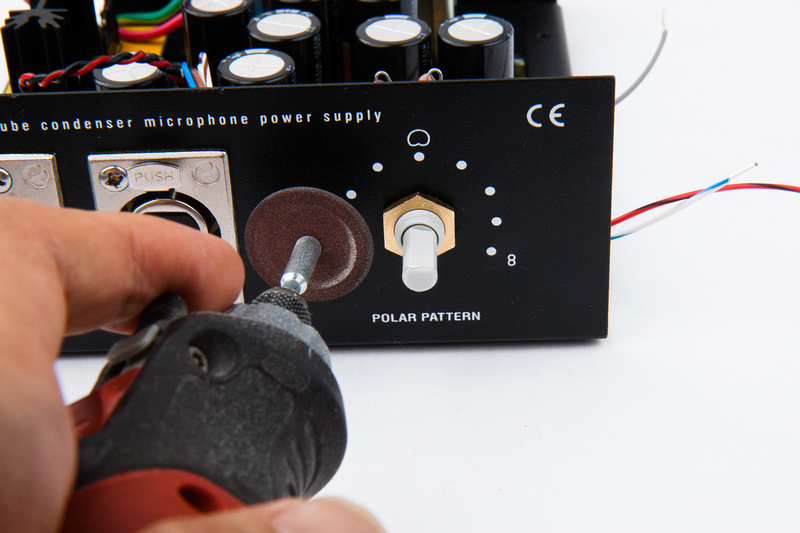 Next, re-attache the microphone base and bring out the output transformer of your choice. 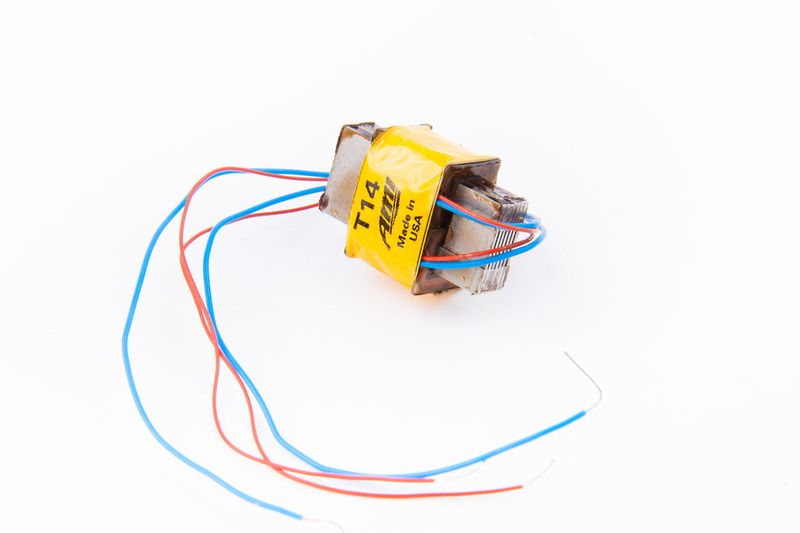 In this build, we will be using AMI's T14 transformer. 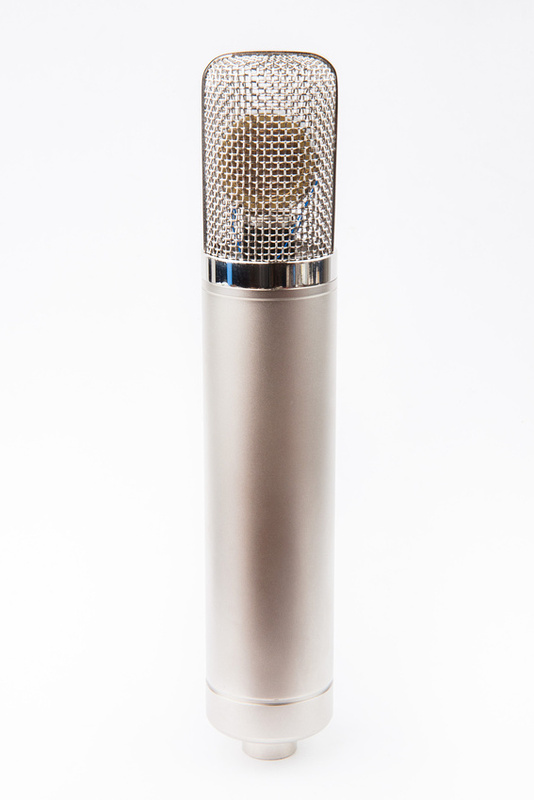 Alternately, the Cinemag 2480 will work well in this microphone. These are both premium quality transformers with the Cinemag being significantly less expensive. I would venture to say the build quality on both are on par with each other. They are just wound and spec'd slightly differently. It is completely possible and a clean build option to re-use the original metal bell-housing to encase the new output transformer and there may actually be some benefits in terms of isolation to be had in that scenario, but I opt to mount the transformer simply with 3 zip ties because I prefer not to leave slack an then blindly stuff all of the wires into the bell housing and press them against the 7 pin XLR connector. 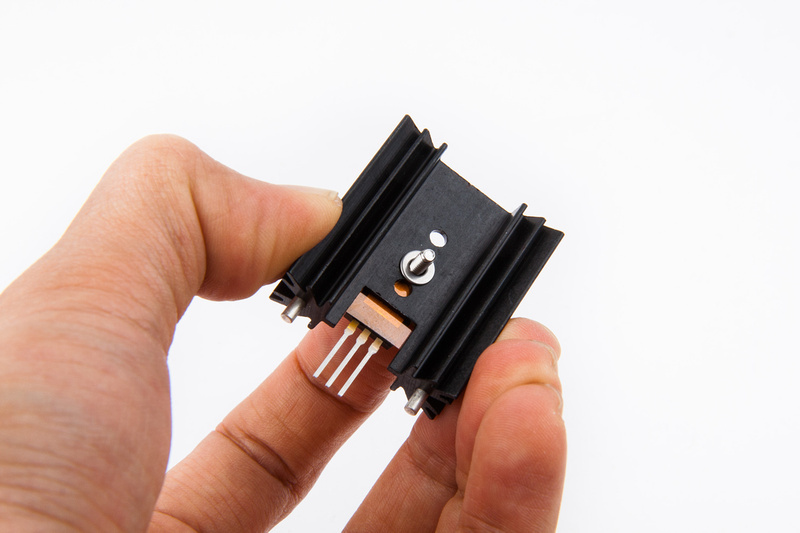 I'm sure it would work great, but the wires connected to the T14 transformer look to be a bit fragile, so I choose to have all the wiring visible for inspection and trouble-shooting if necessary. 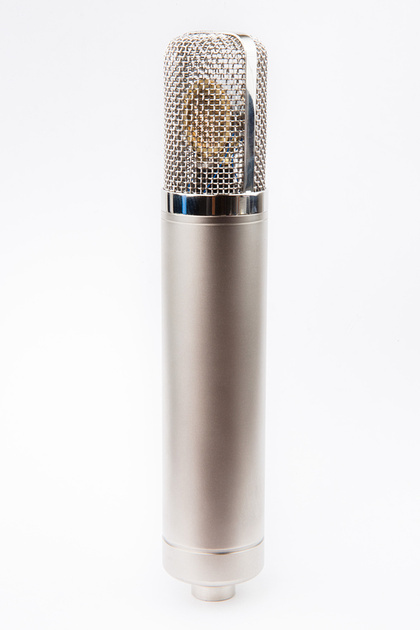 Plus, I might very well forget which microphone this is and need a visual confirmation of what transformer I actually put in there in the future! 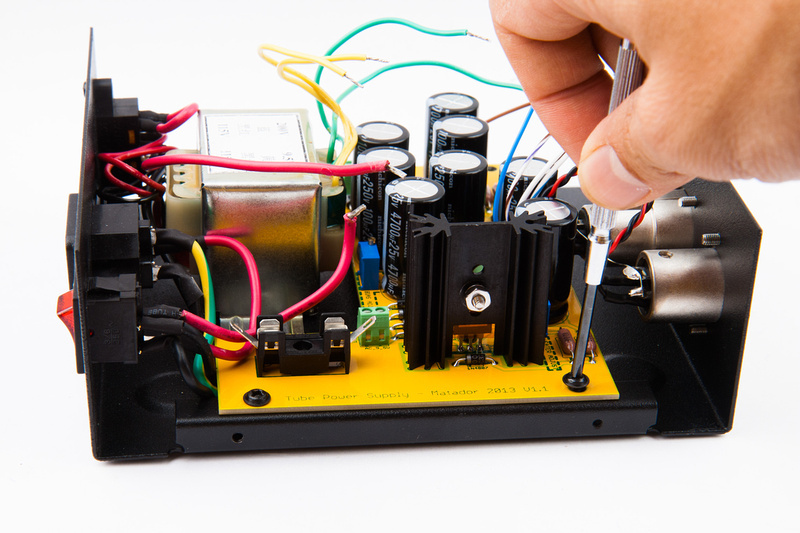 Before installing the transformer, do a quick test to verify which side is the capsule side and which side connects to the pcb and which side connects to the output XLR connector on pin 5 (-) and pin 6 (+). 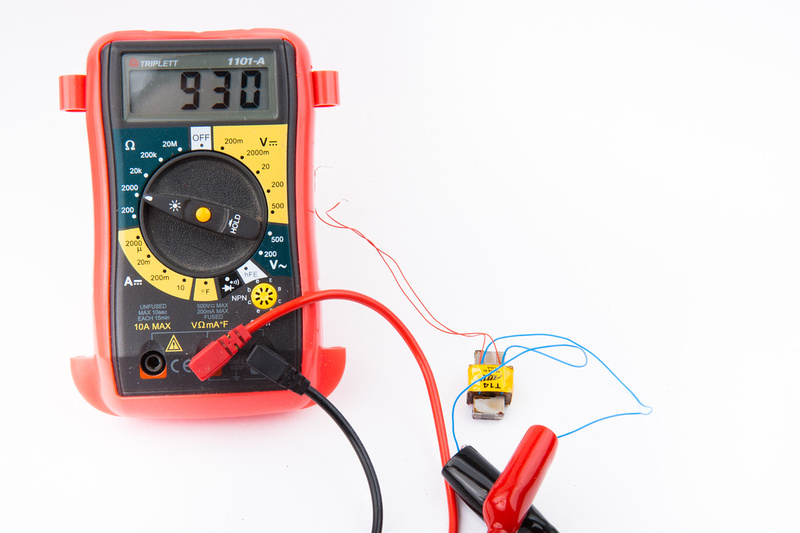 The red wires in this instance read 20.4R on my multimeter and are my output side which will connect to the XLR. The blue wires read 930R and will connect to the pcb to the terminals labelled XP1 (+) and XP2 (-). 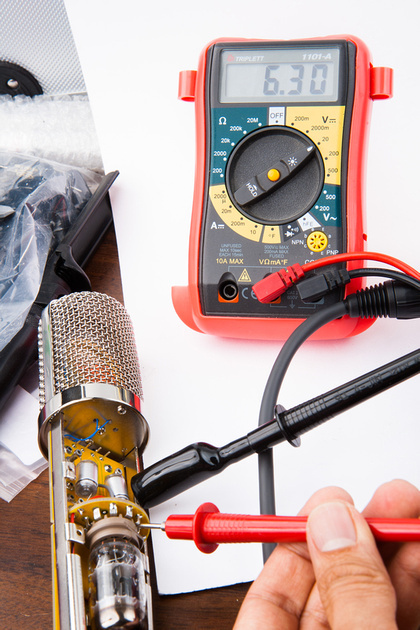 I determine which set of wires I will select as + and - for audio, trim the red wires to length and solder them to the XLR connector. Next, i secure the transformer to the frame rails with one large zip tie and 2 small zip ties. 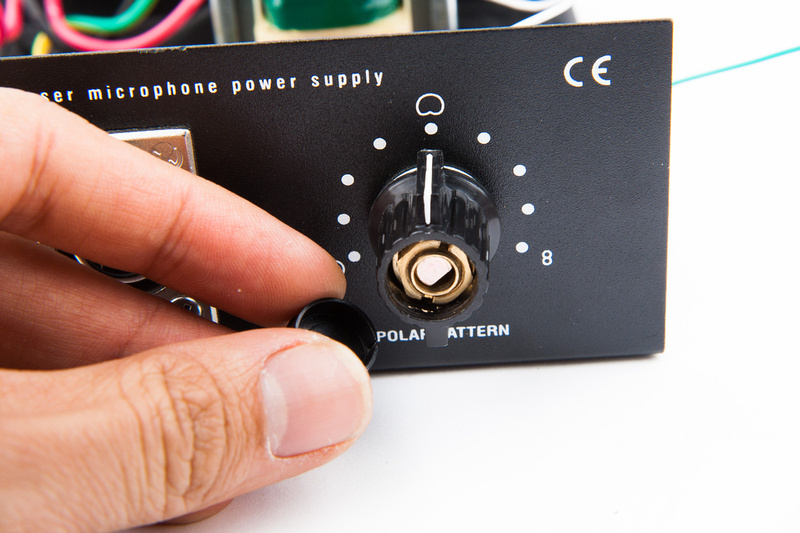 Determine a clean wiring path, cut, strip, and solder the rest of the wire leads from the 7 pin XLR to the microphone preamp pcb. 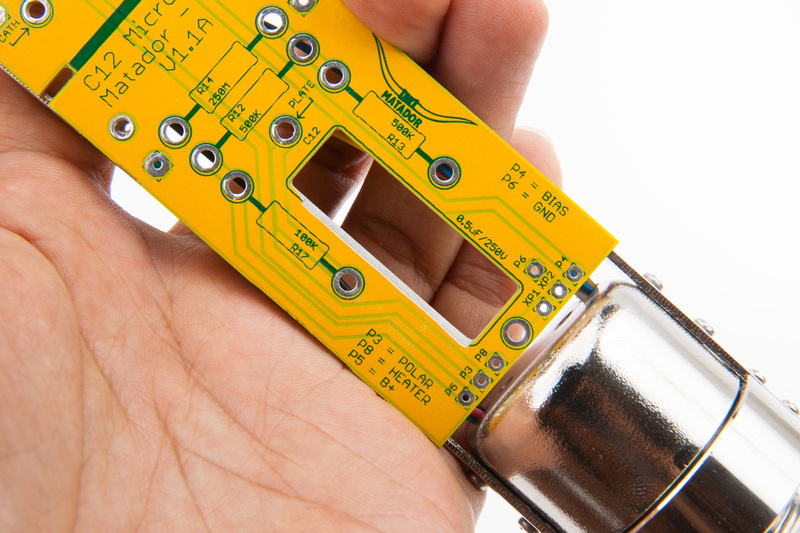 The pin labels are identical to the ones inside the pcb. 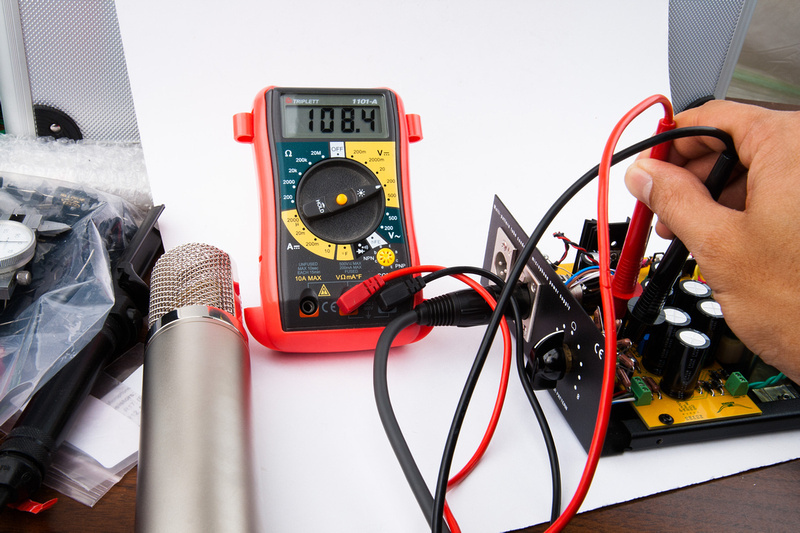 Because I used the same color code wires inside the microphone as inside the power supply, I can double check that my connections are correct. 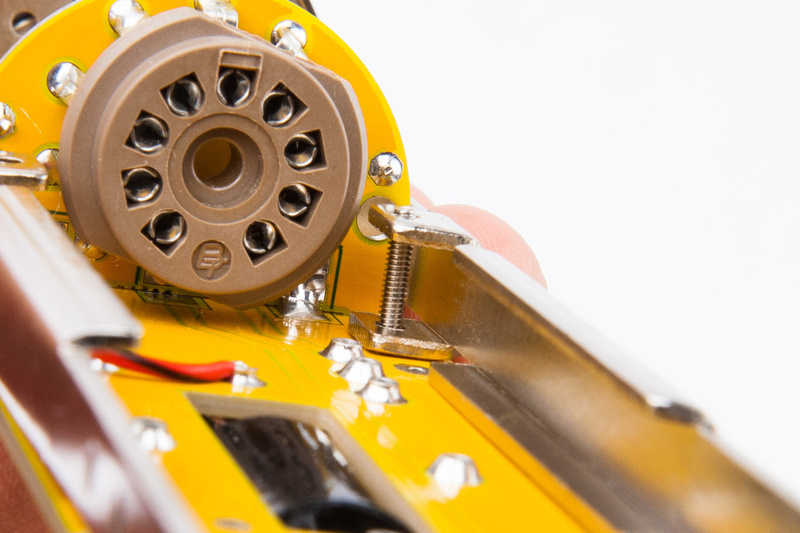 And here is the base of the microphone with all of the wires installed. 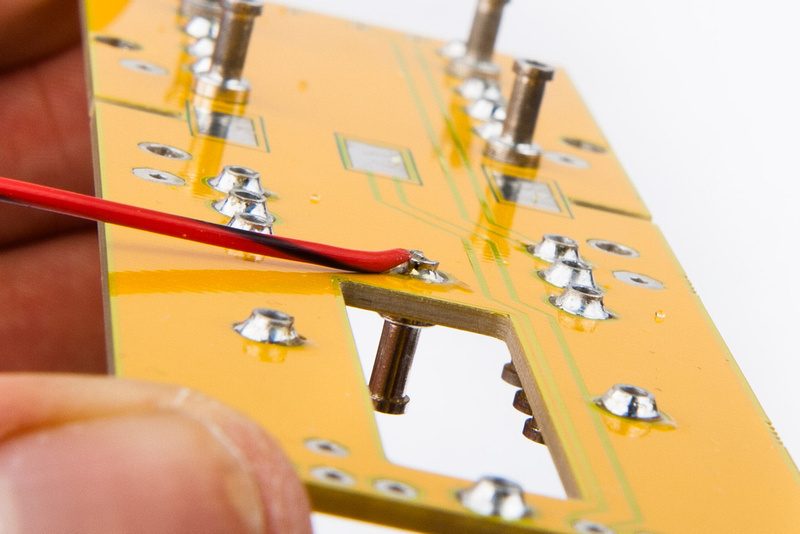 Carefully clean the solder flux off of the newly made connections on the pcb. 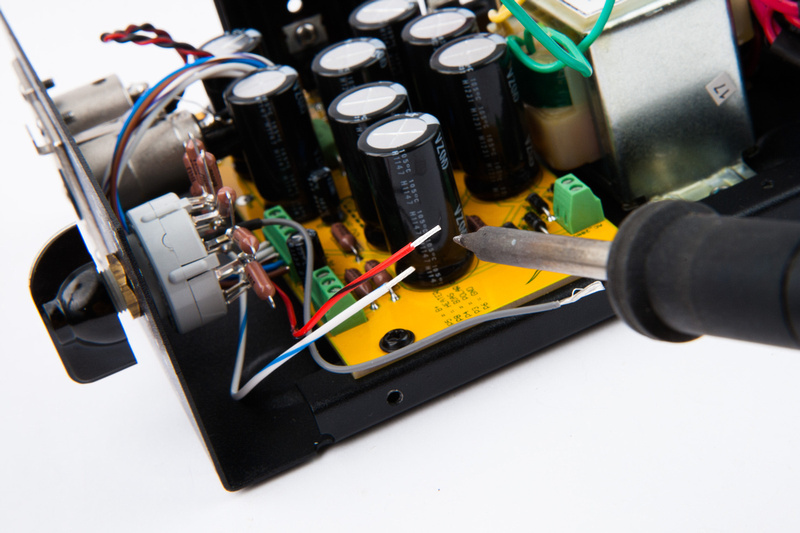 Be careful around capacitors and the delicate output transformer wires. It may be redundant to do this, but I connect an extra wire to the backplate terminal on the stock Alctron capsule to install for testing. And, the stock capsule is wired in for testing. . . I did not place much emphasis on neatness here as this is just for function testing purposes. 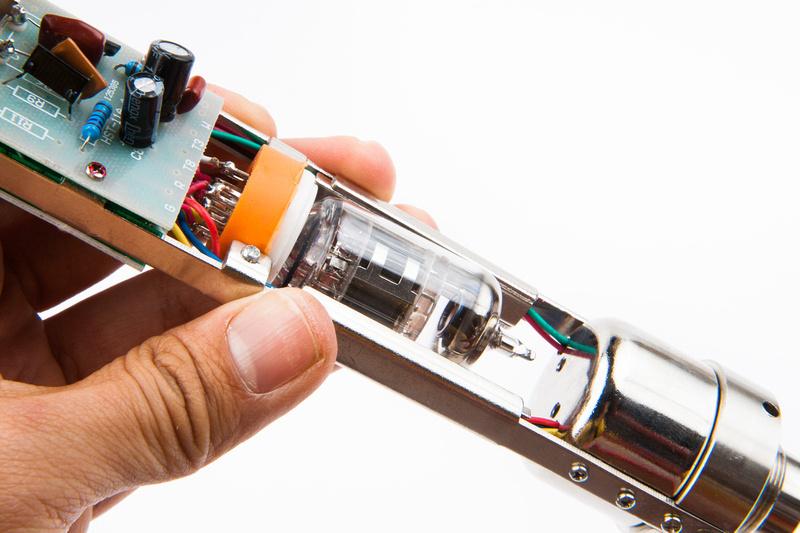 Next, install a tested/functional tube that you do not care much about or is relatively inexpensive to replace. 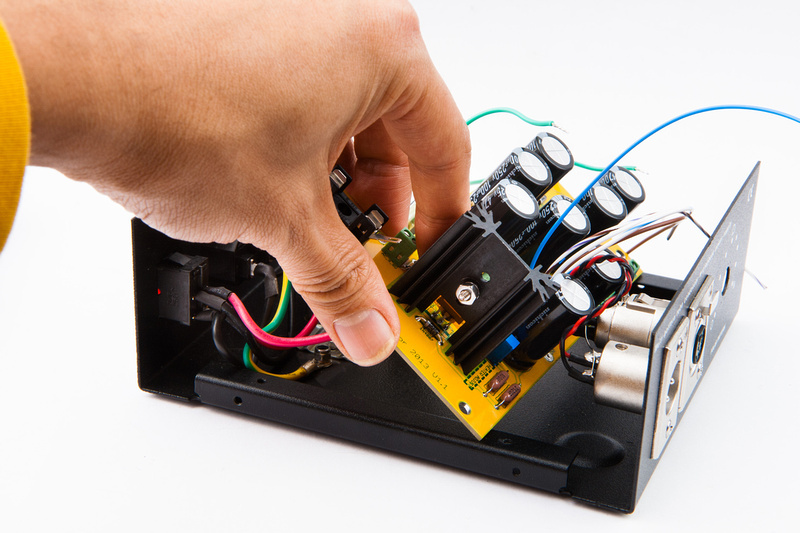 Here I am using an Electro-Harmonix tube. . . this particular sample should probably be more aptly named "Electro Microphonix". The important thing is you have a capsule and a tube installed in the microphone at this time that you can afford to blow up without crying too much. 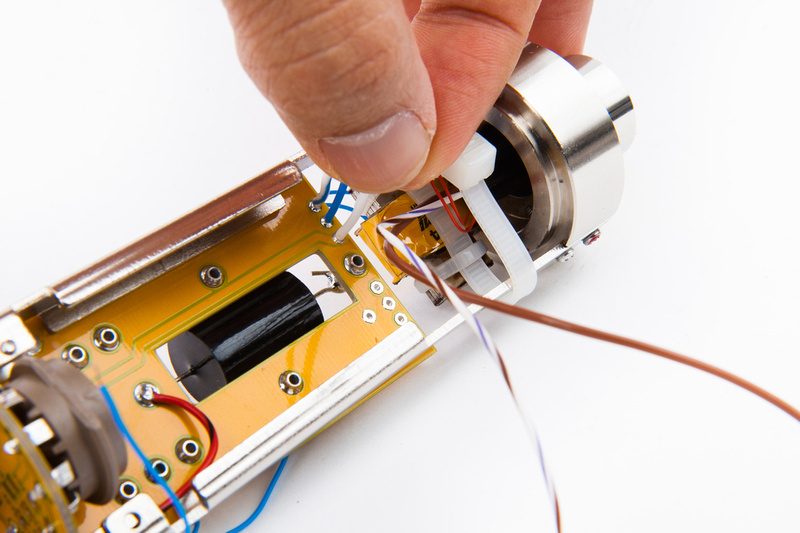 Note: It is imperative if you are following this "unscientific" initial verification process to make sure the tube and capsule that are being used for calibration and function verification are 100% stable, broken in, and functional. Otherwise, all manner of problems that are difficult to trace can surface. 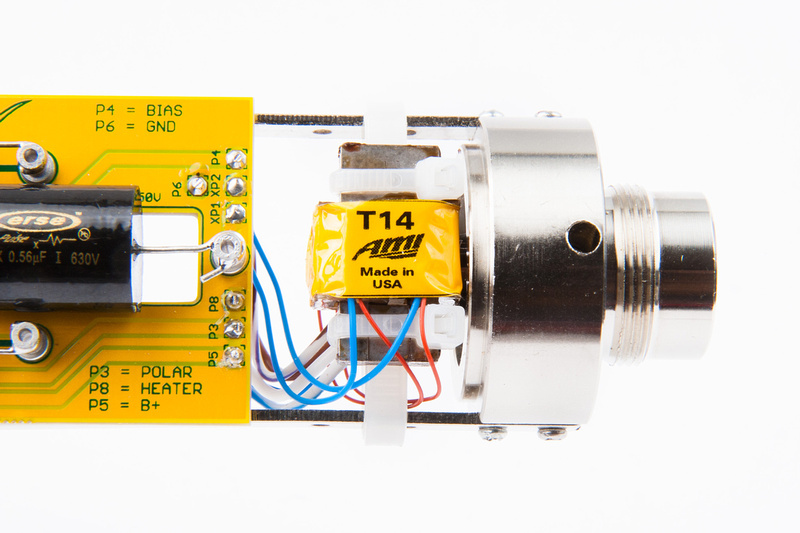 The 12AX7 tube that originally shipped with my HT-11A was a hissy, intermittent, crackling mess and totally unsuitable for even function testing. 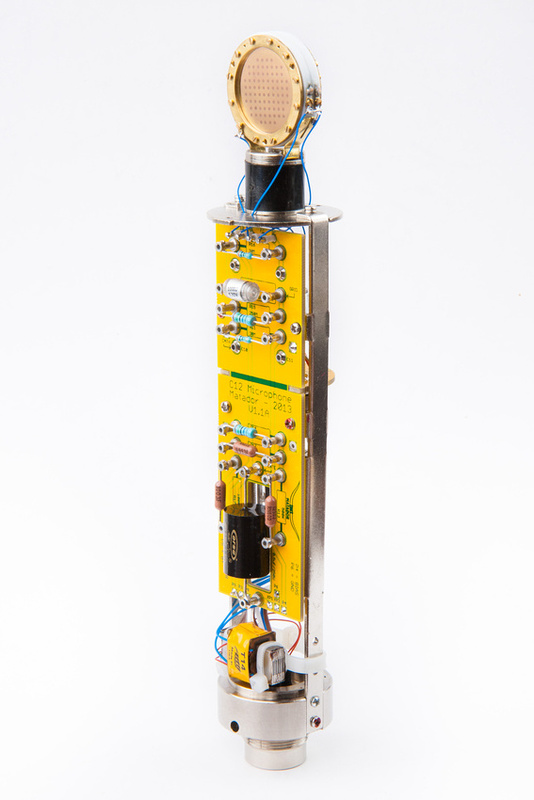 The Electro Harmonix 6072A tube used for function testing was fired up in a guitar amp for about a week and tested in studio to be completely stable in another microphone. 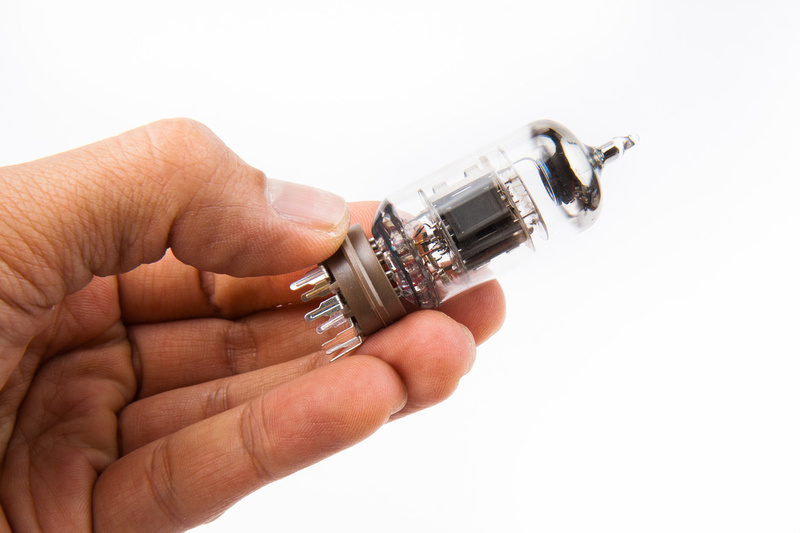 If purchasing a nice NOS tube from Christian Whitmore for this project and you do not have a known, stable tester tube on hand, please consider sourcing a stable but cheap tube from him for testing purposes. 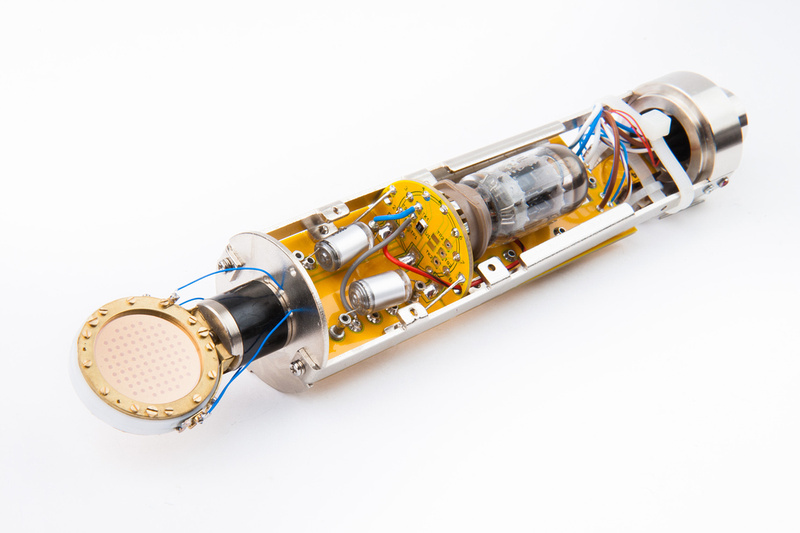 . . perhaps a tube that is more microphonic than acceptable for microphone use, but is stable and good enough for setting up voltages and function checking. 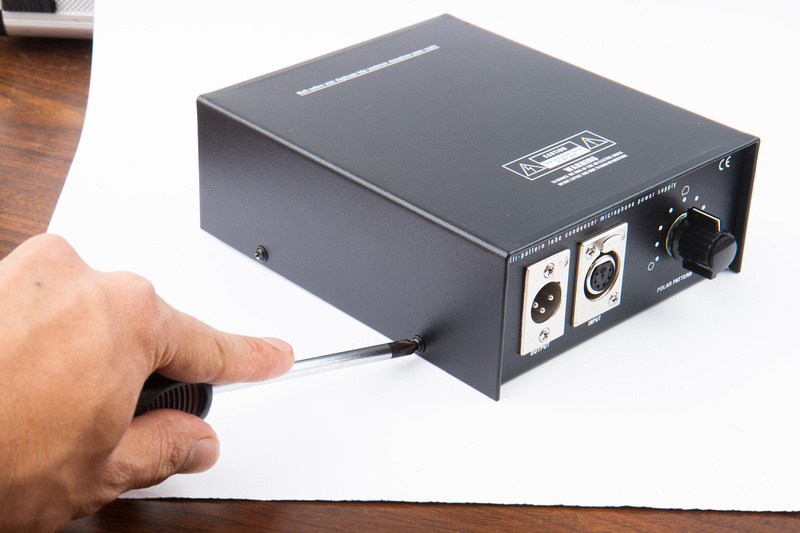 First I adjust my heater voltage with the trimmer pot inside the power supply measuring from the microphone because there will be some loss along the cable. Set this to 6.3 volts. 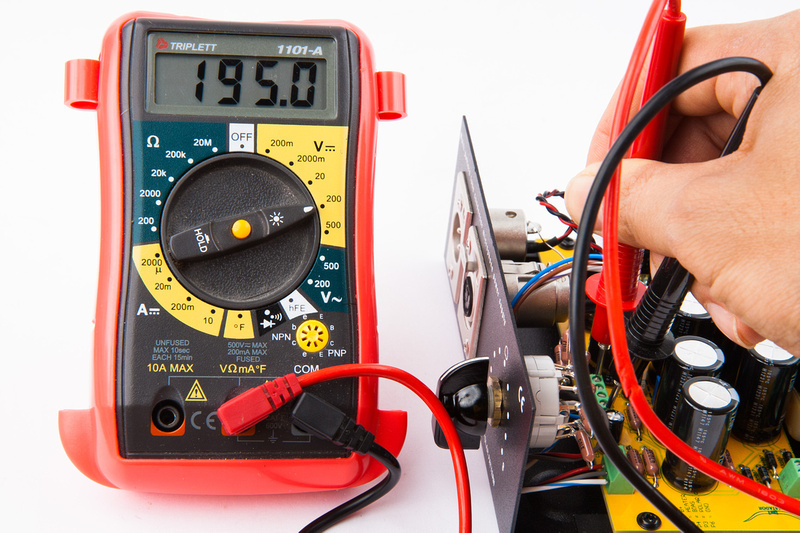 Measuring from inside the power supply, set B+ voltage to 120V and the bias voltage to -1V. 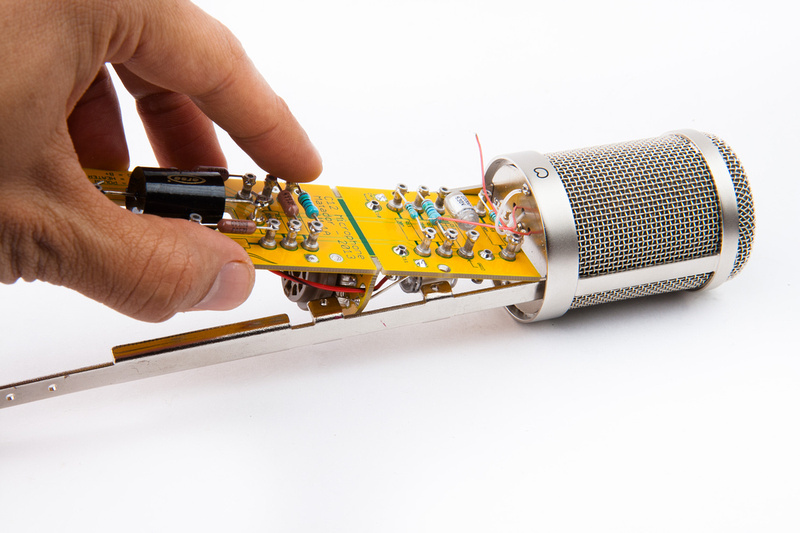 With the tube DC conditions properly set, and the capsule's AC conditions set, assemble the microphone and test for audio and patterning. "Check 1, 2. . . 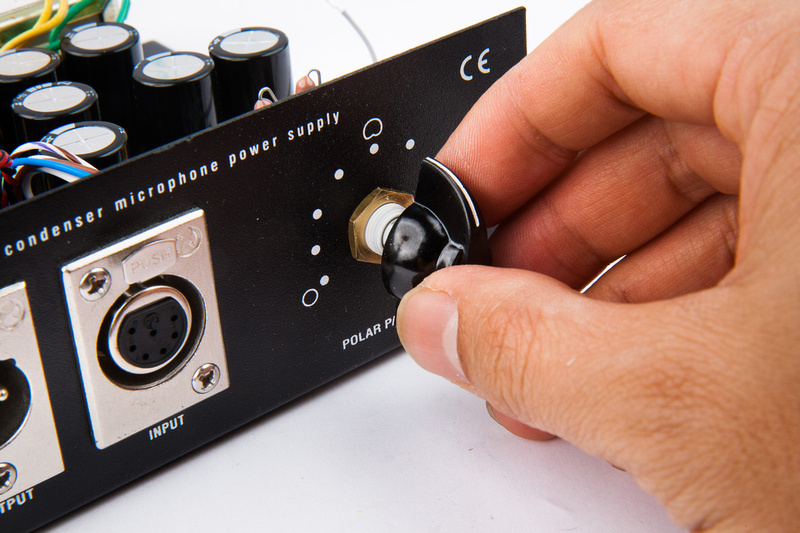 Check 1, 2. . . " For this build, the microphone fired up right away without any problems whatsoever. 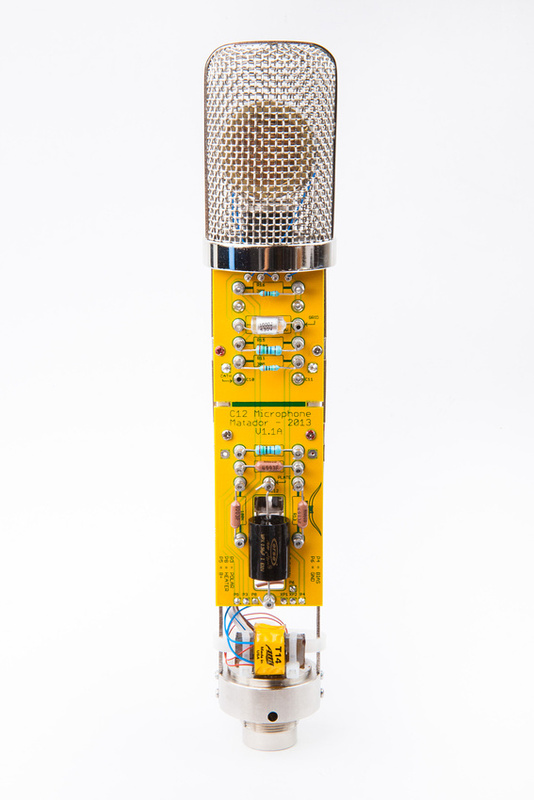 With the circuit tested on our cheap/free donor microphone capsule and expendable tube, it's time to install our premium components to bring this microphone to life. For this build, we will be using our custom headbasket designed and produced specifically for this project. And Tim Campbell's outstanding CT12 capsule which is an authentic reproduction of the original C12 capsule and uses the actual old stock membrane material used in the original capsules. 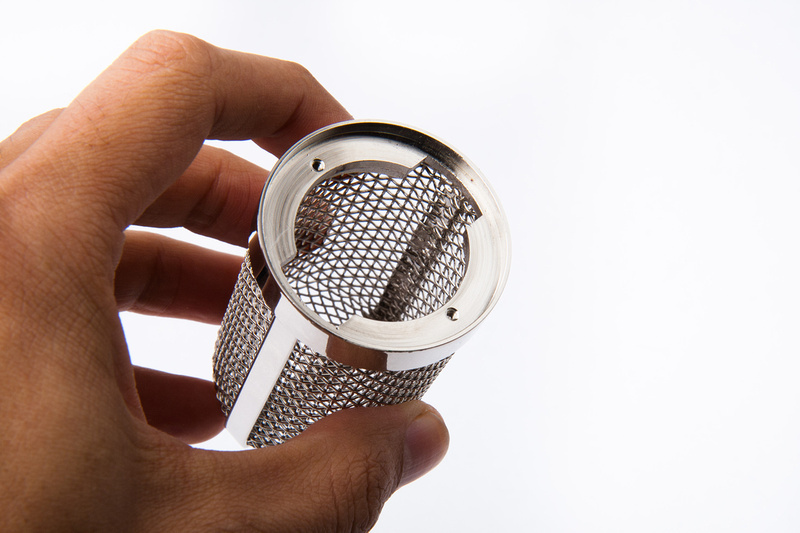 Tims handmade capsule to my knowledge, is the only readily available capsule that utilizes the original capsule's backplate and resonating chamber design. I do not know about specifics, but it is not a trivial task assembling and calibrating the internal components of this complex assembly. 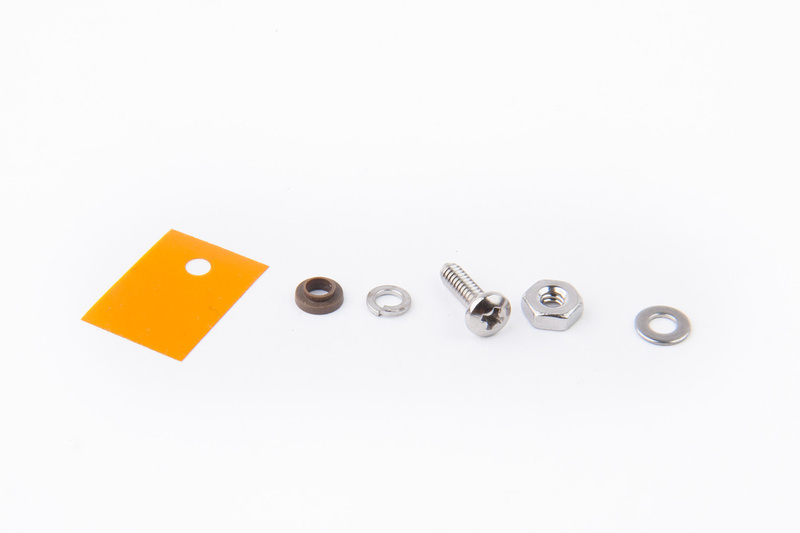 Most other edge terminated capsules currently available are based on a completely different K67-based backplate configuration. 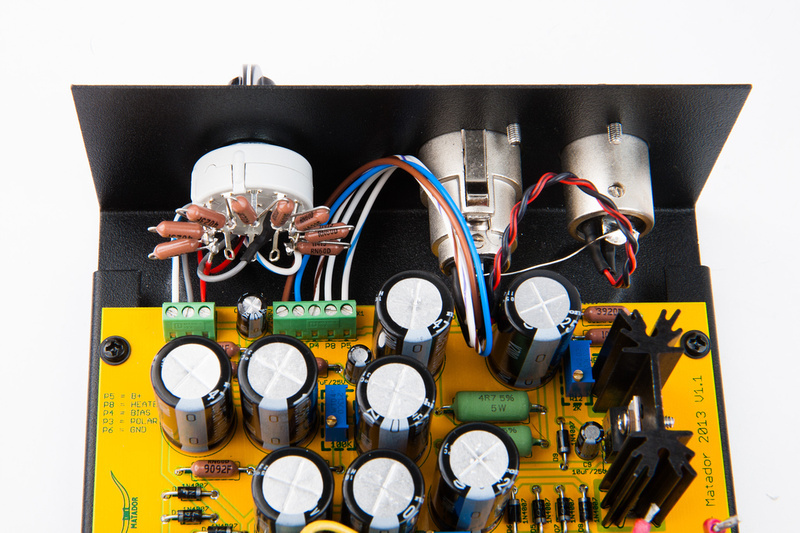 That is not to say the other capsules cannot be made to work in the circuit and sound amazing. Certainly the newer designs are easier to manufacture consistently. It's just that there are few options if "original vibe" is the target. Tims capsules take a long time to build and the lead time can be long at times, but he does not take your money until your particular capsule is being made and has been of great support and resource to the DIY community. Also, in my experience, his projections of actual lead time at the time a reservation is placed are for the most part accurate, so it is not an open-ended time-frame. 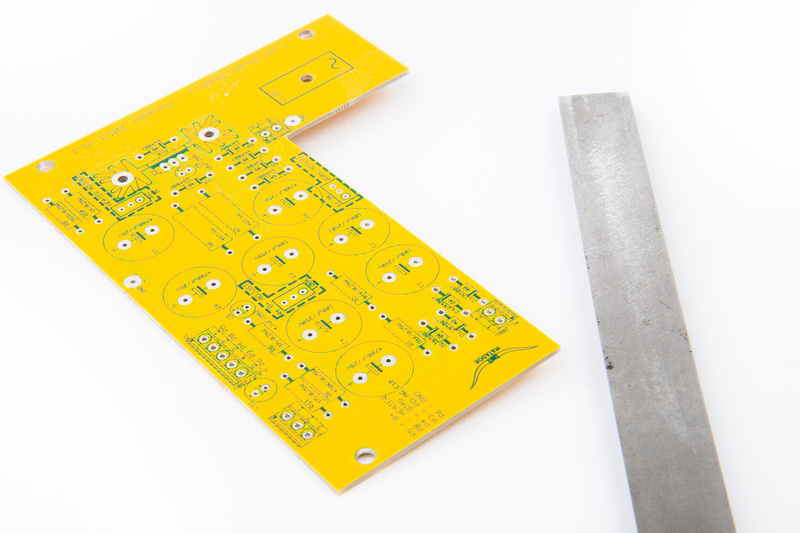 The CT12 capsule has isolated backplates which we will bridge together at the solder terminals on the capsule. 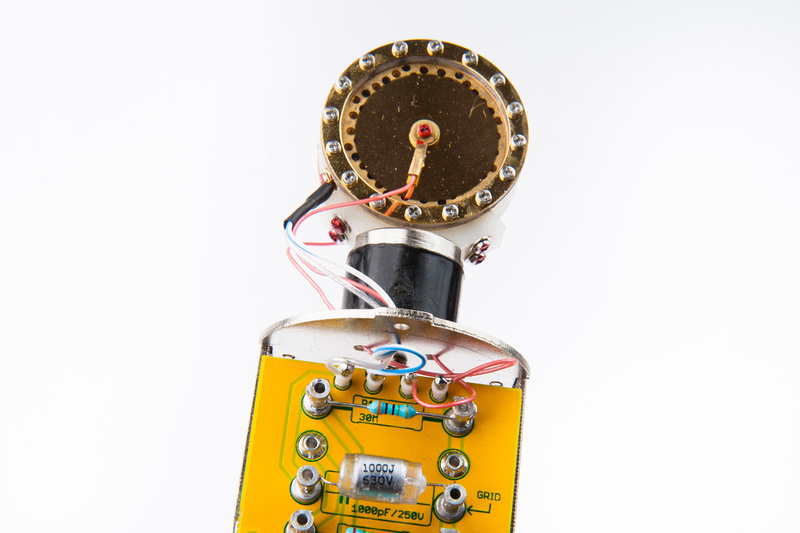 With this capsule being scavenged from a previous prototype, Matador already soldered in wires for the front diaphragm, rear diaphragm, front/rear backplates, as well as bridge the front and rear backplates together. 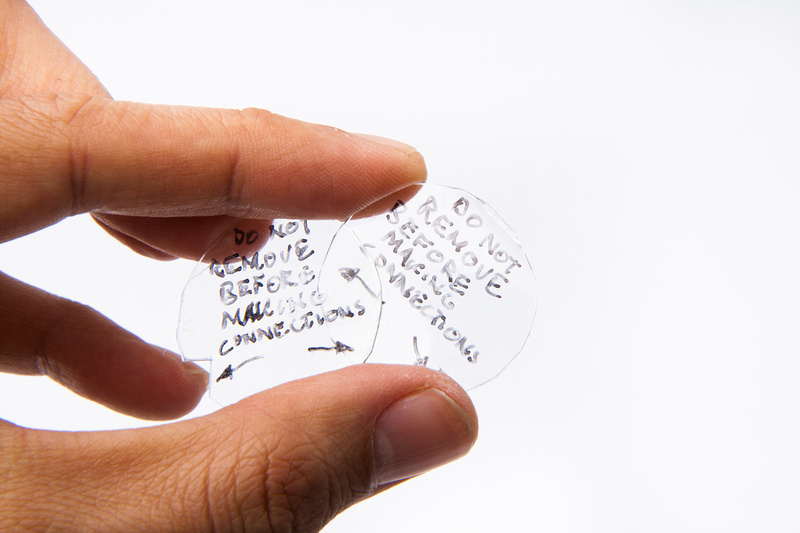 The capsule originally came with plastic cover plates to protect the delicate diaphragm membranes from solder splash. I replace these protectors at this time as I transfer the capsule from the older prototype to the new microphone depicted here. 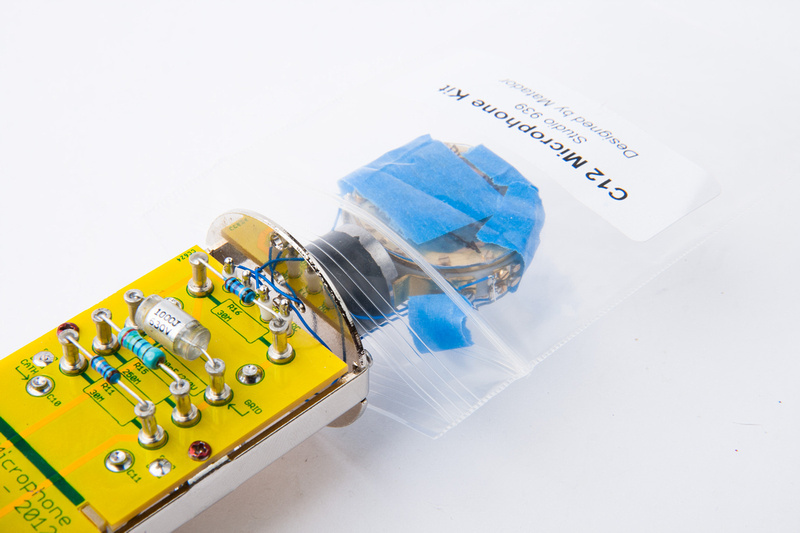 And, just because it's expensive and I cannot afford to much this up, I put a plastic bag over the entire assembly before de-soldering the capsule from the previous prototype. 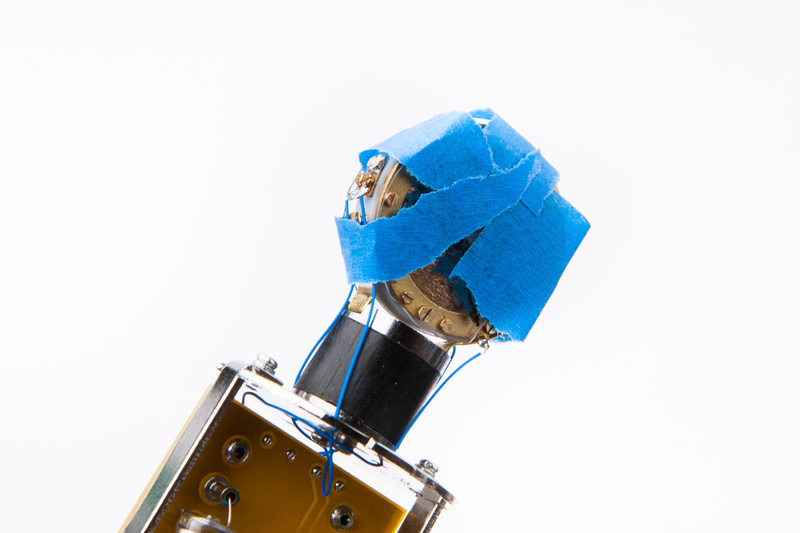 Next, remove the stock headbasket and de-solder the stock test capsule. Remove the capsule and the saddle. 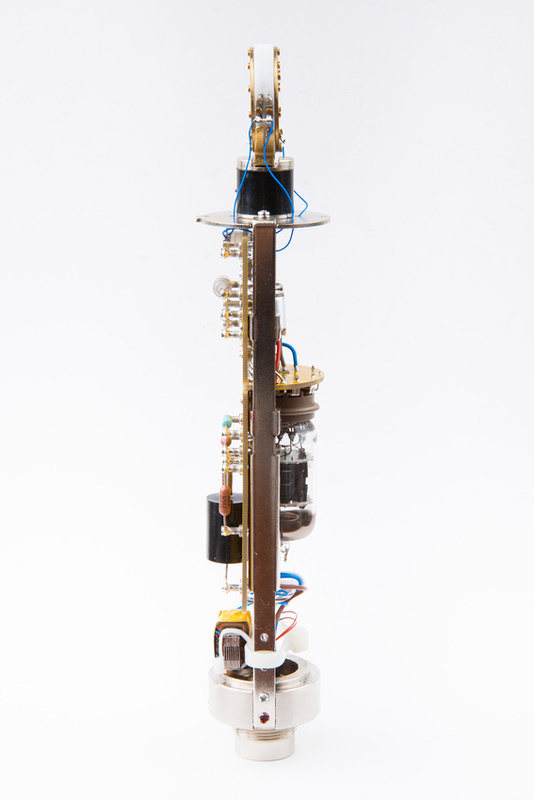 And install the brass mount provided with the Tim Campbell CT12 capsule. 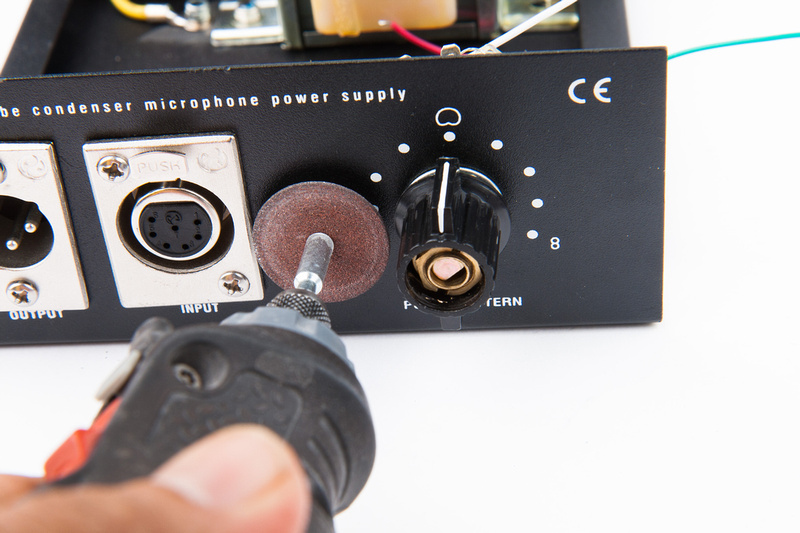 Carefully install the capsule and solder the four connections to the proper lugs on the microphone pcb. 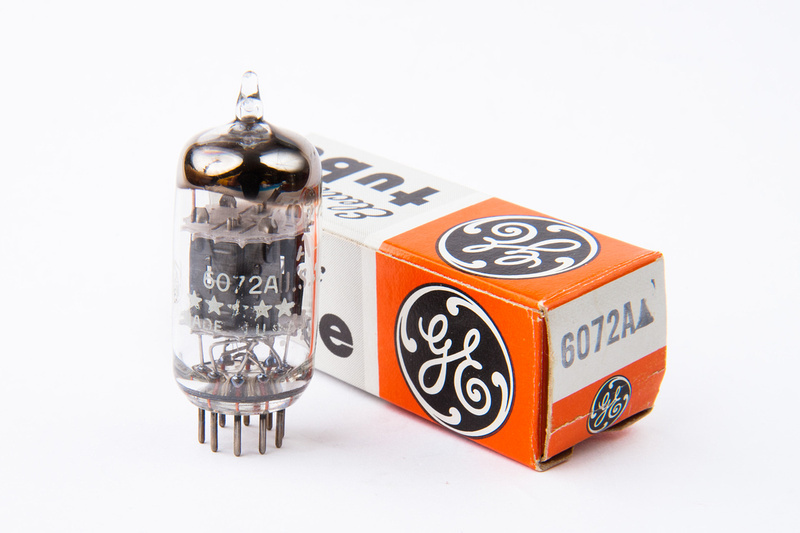 For this build we will be using a NOS vintage GE five star 6072A tube. Microphone-grade copies of this tube are becoming more and more rare. 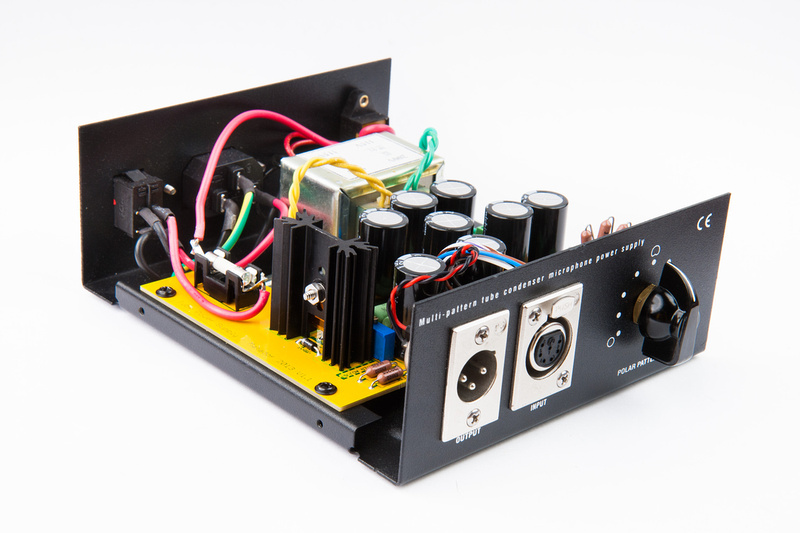 I source my tube from Christian Whitmore who tests his tubes for microphonics, noise, and audio quality. He also burns the tube in for 72 hours to ensure stability. 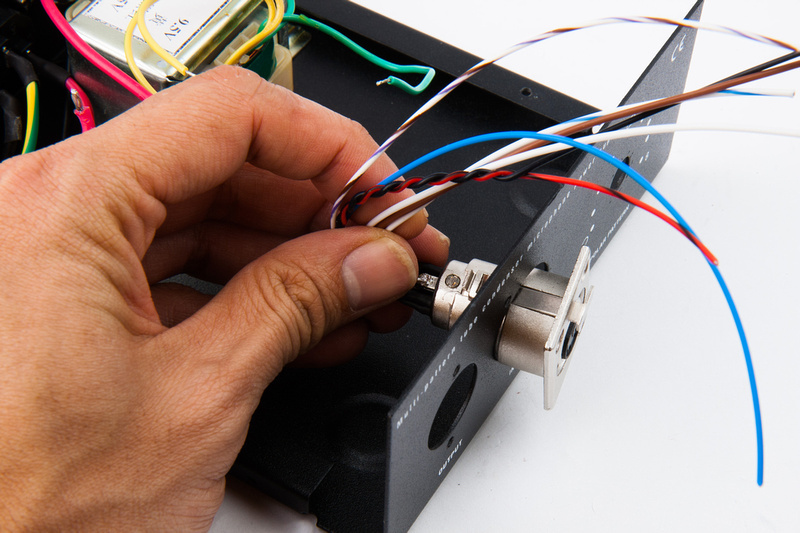 The selection process is VERY stringent and the best, modern measuring equipment is used to ensure the tube is up to the highest standards for microphone use. These days, less than 1 out of 10 samples will measure up. At this point, our C12 clone is electronically completely assembled. 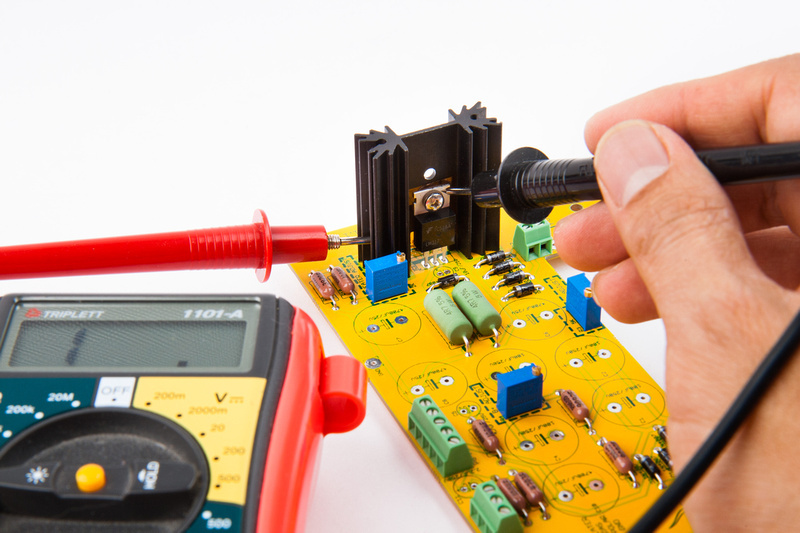 And confirm or adjust the heater voltage again for the final tube. 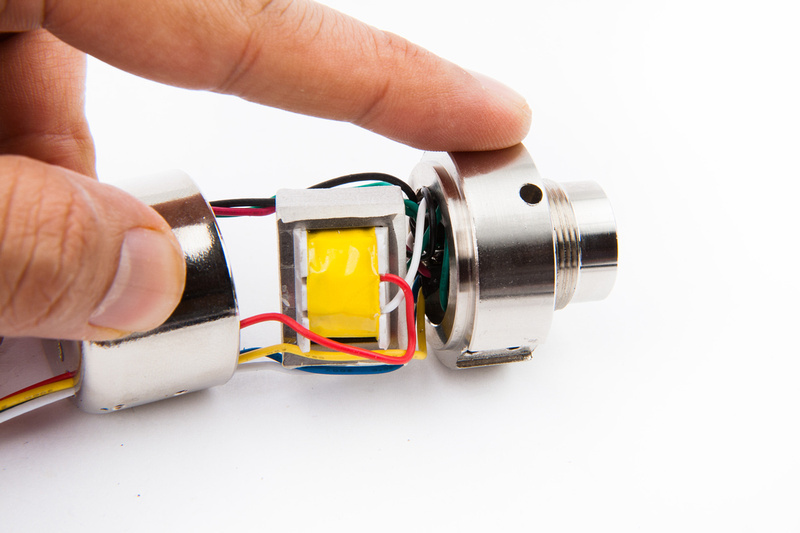 The rest of the calibrations can be made with the microphone assembled, so power down and assemble the body. 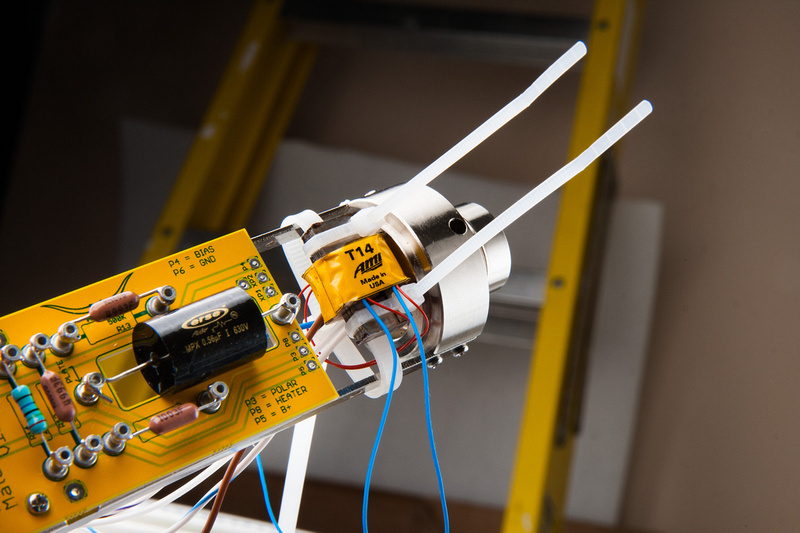 Our B+ voltage has shifted downward to 108.4 volts upon installation of the Tim Campbell capsule. A few turns on the trim pot bring us back to our nominal 120 volts. 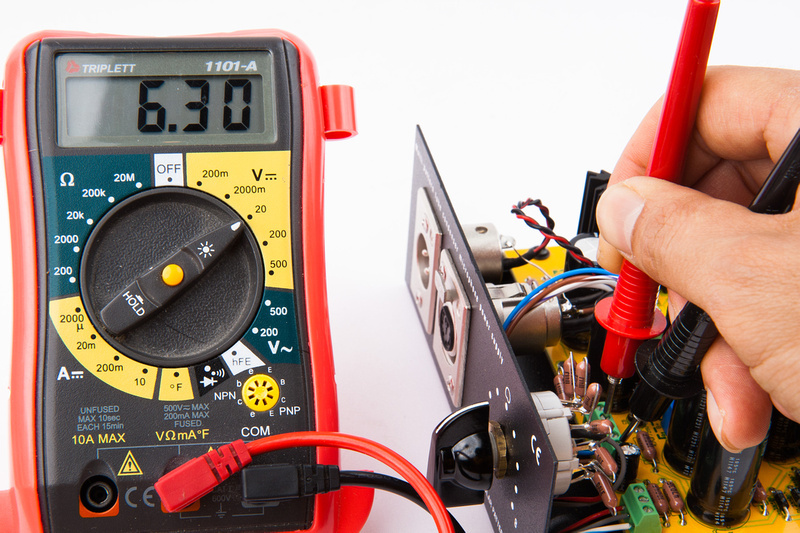 Re-adjust the bias voltage to -1.0 volts. 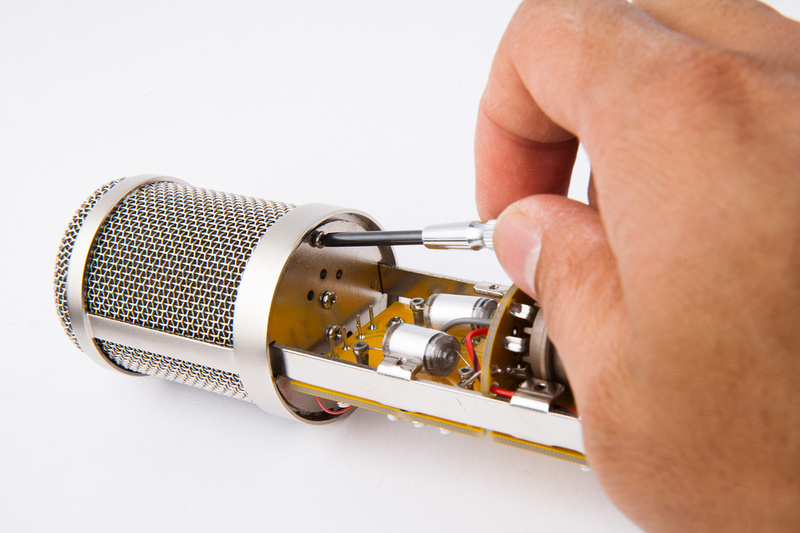 And at this point, all calibrations are completed for this microphone. 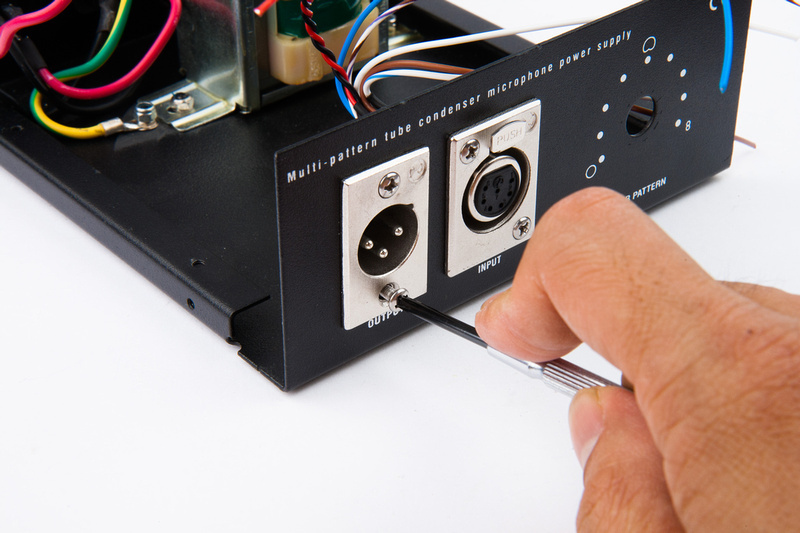 Re-install the cover plate on the power supply. And the C12 clone is complete! Humans win. Why do you want to wreck that knob? its pretty easy to take out with some long nose pliers. I certainly didn't want to wreck the knob, but I'm assuming the torque applied to the knob tensioning nut varies from copy to copy. Mine did not come out by conventional means and I didn't feel like making a special tool to remove it. 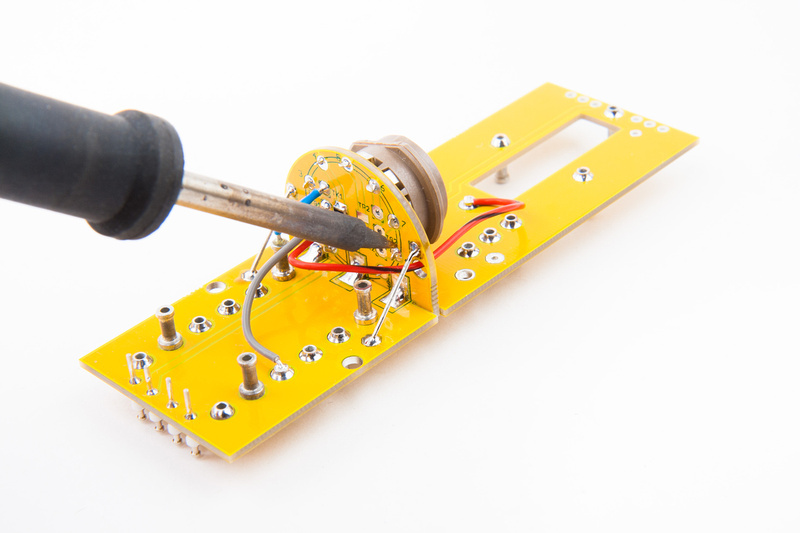 I'll try pliers on a few samples I have laying around though and see if I have success removing the knob. 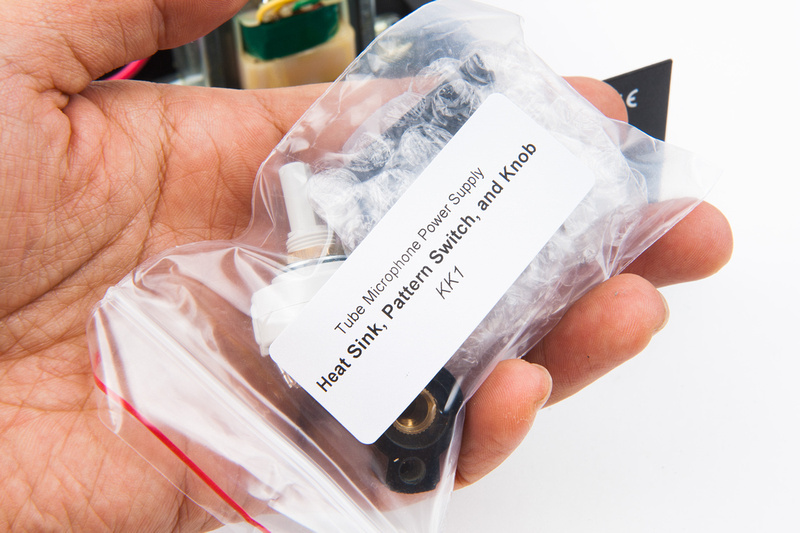 In either case, the kit includes a knob. This is quite inspiring, well done. If I can make one comment, heatsink compound on both sides of the regulator insulating washer will increase heat dissipation by a factor of 2 or more. I tried on two prototype supplies: the plastic is brittle and tends to crack when you try to get needle-nose pliers in to loosen the top of the slitted nut. It was obviously intended to be removed only with the proper tool. 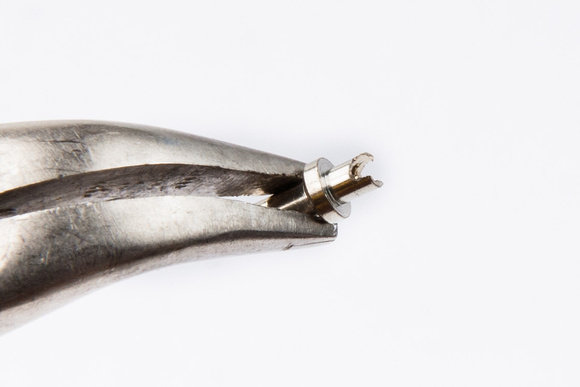 Perhaps if you have pliers that are thin enough then it wouldn't be a problem. 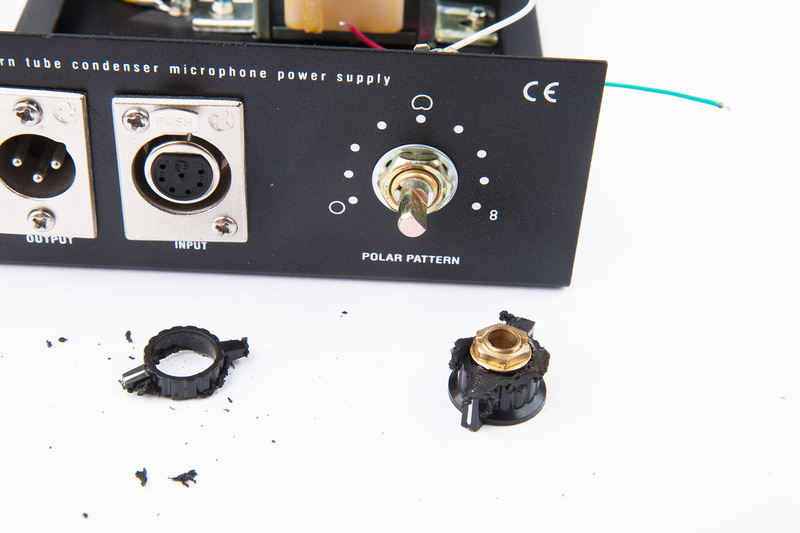 In any case, I highly recommend using the alternate Lorlin switch: the stock switch can only be rebuilt if you have the proper soldering tools, as the plastic carrier melts quite easily. If it melts enough, then the switch no longer makes contact at that position, and then the polar patterns start to jump around as you move the switch. Its all cool i understand chinesse stuff tends to vary from unit to unit. I performed some mods long ago on my psu and switch never melted down. i was using a 25watts iron maybe not too hot to melt it! Your photo color books have have made many mics possible. First post updated with latest schematics.